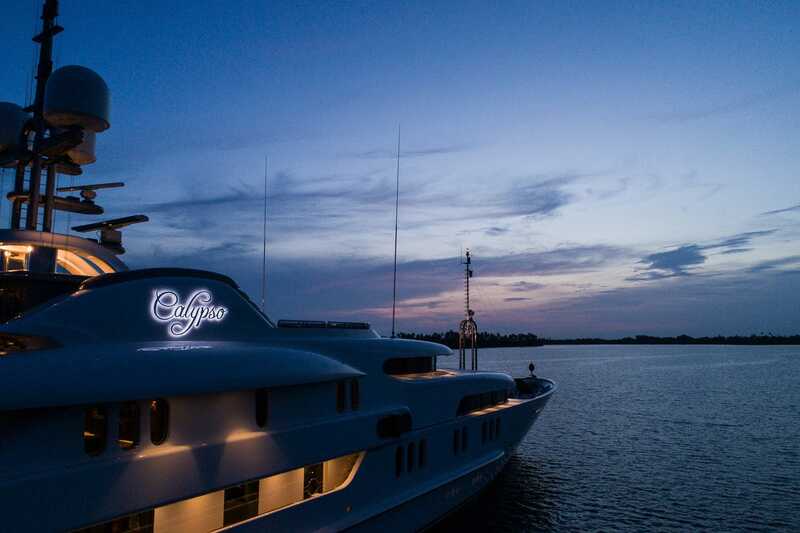 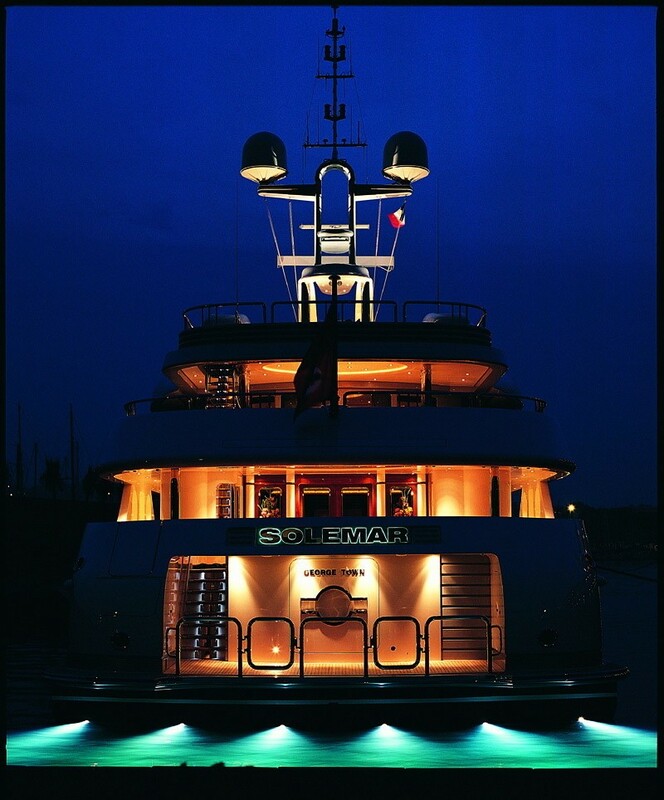 Motor yacht CALYPSO (Ex Solemar) was built by the Amels yard in Holland in 2003. 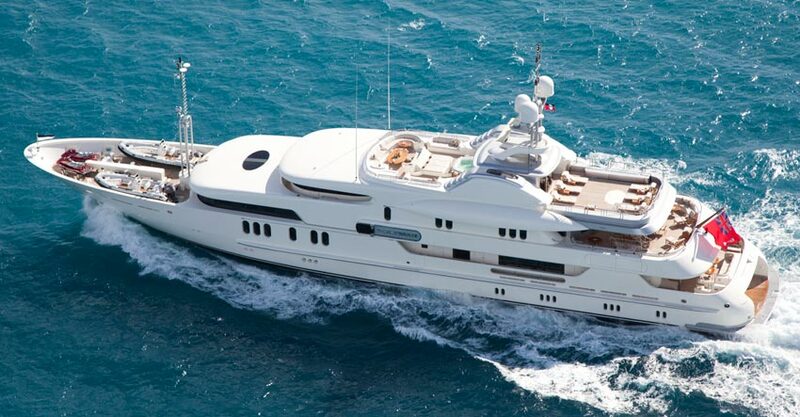 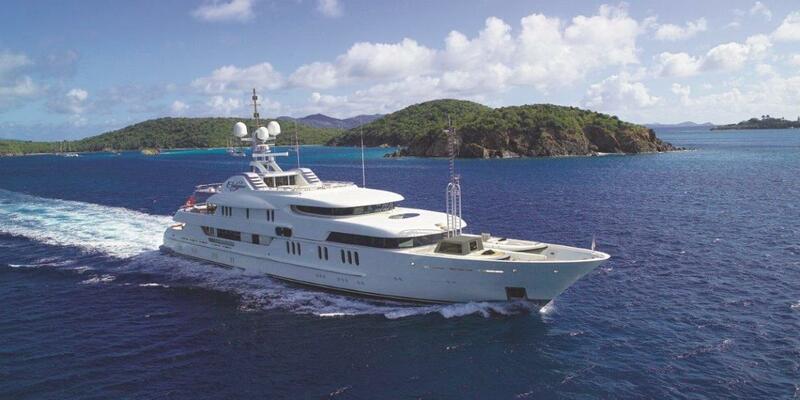 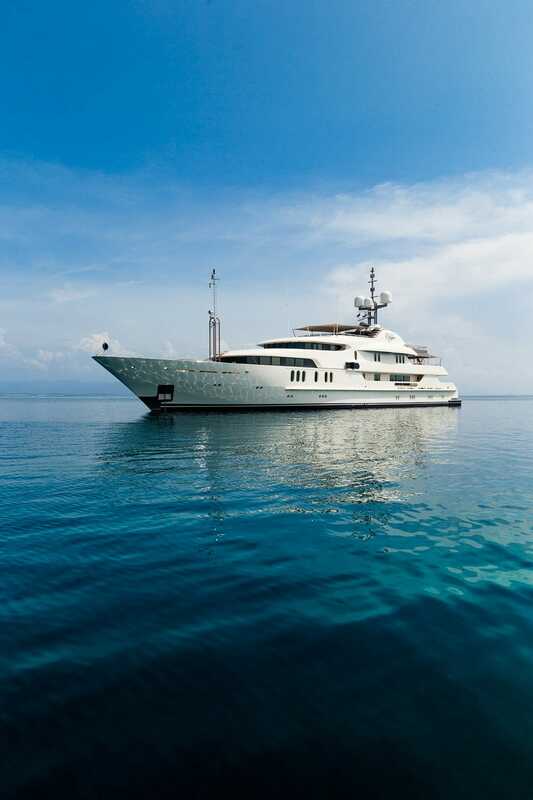 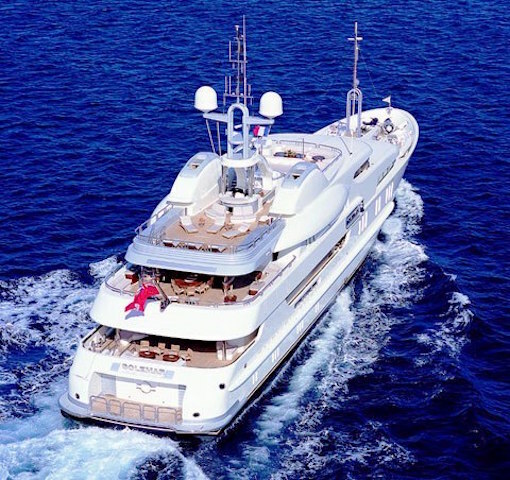 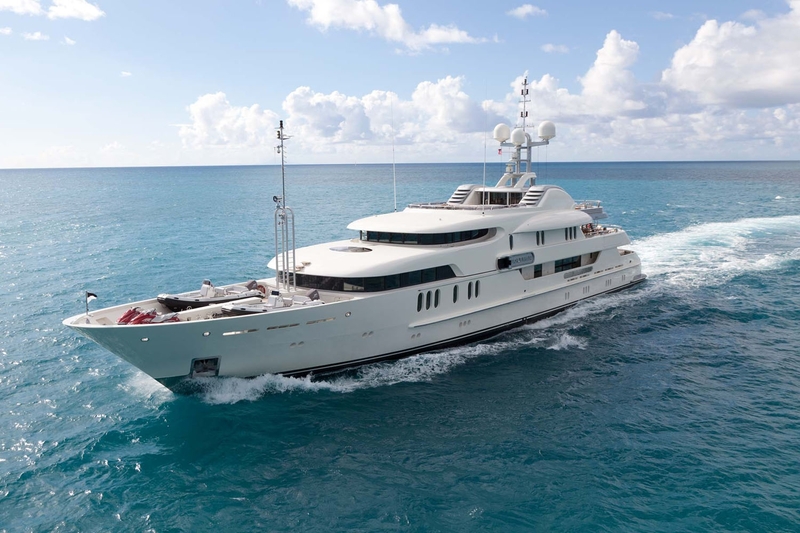 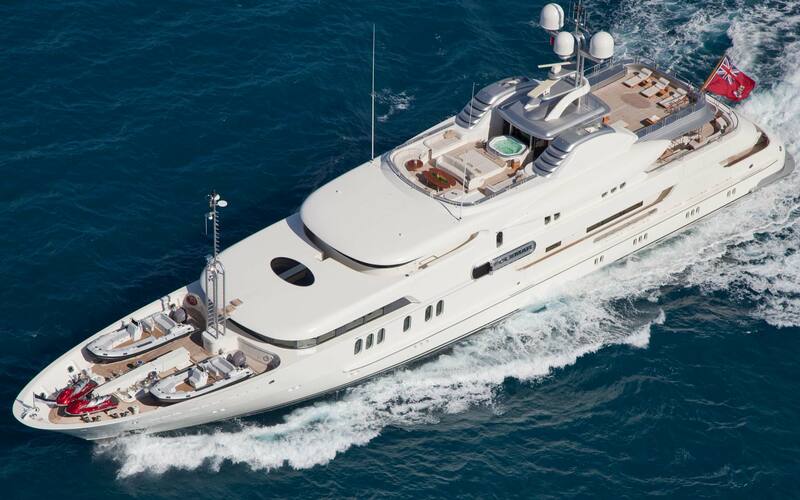 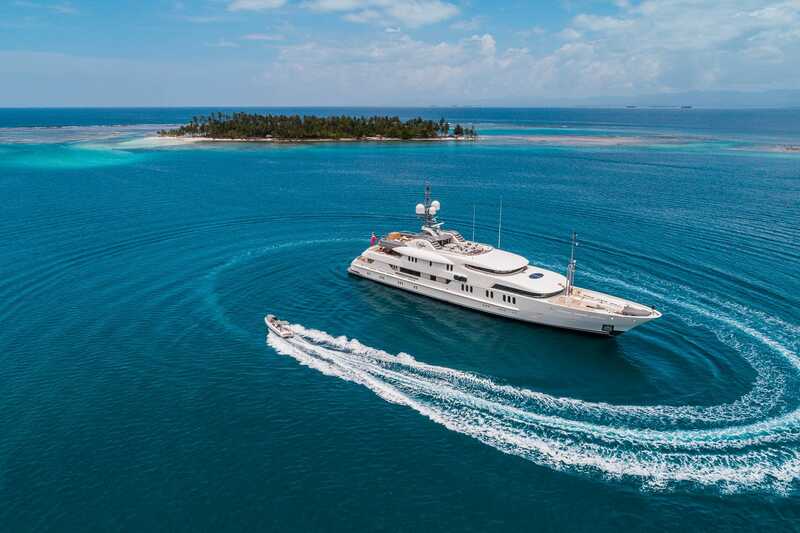 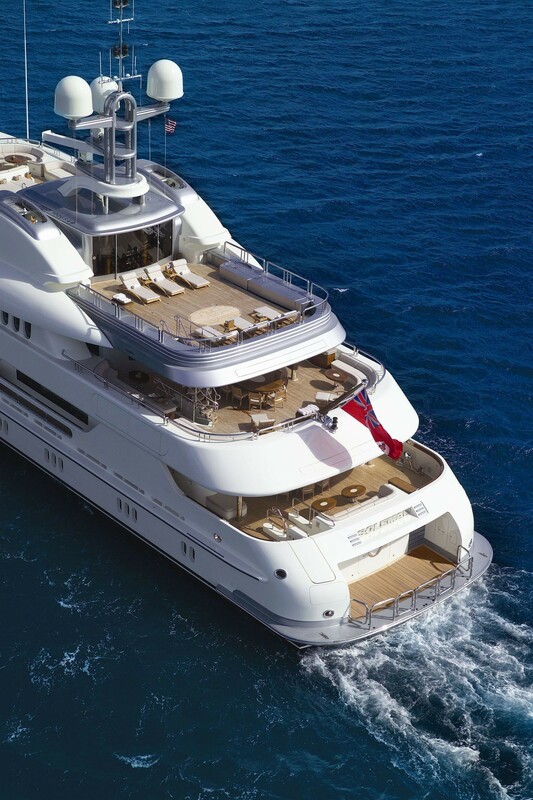 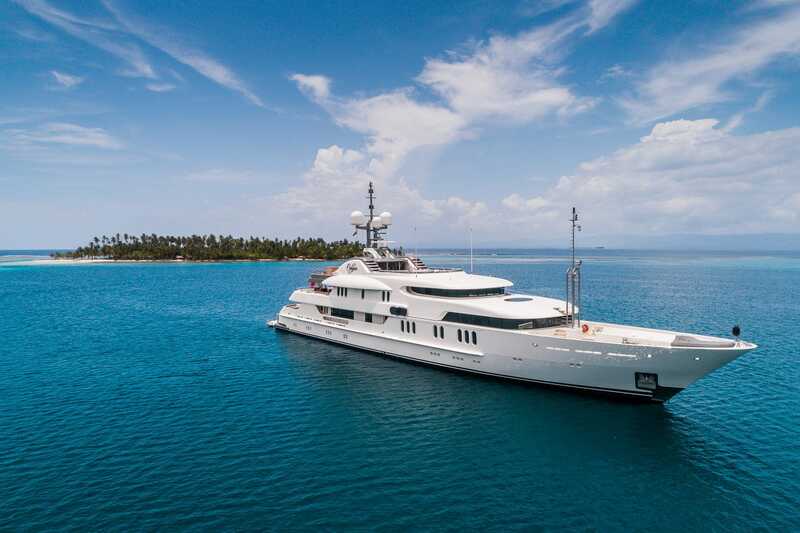 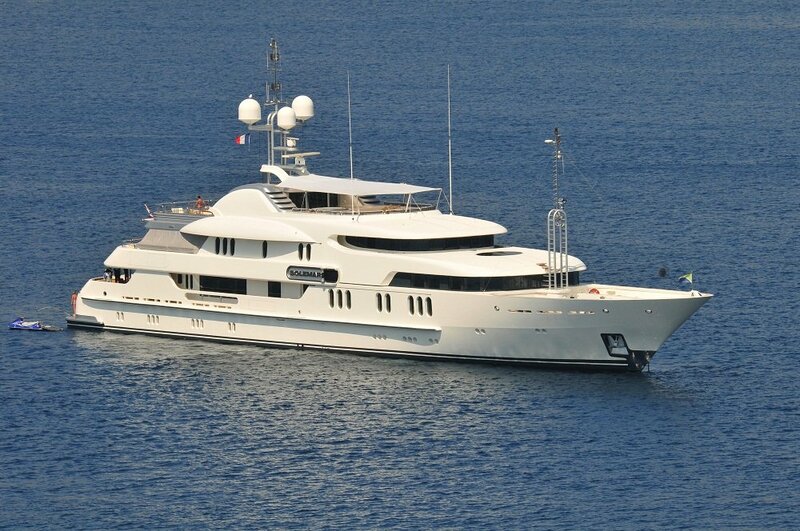 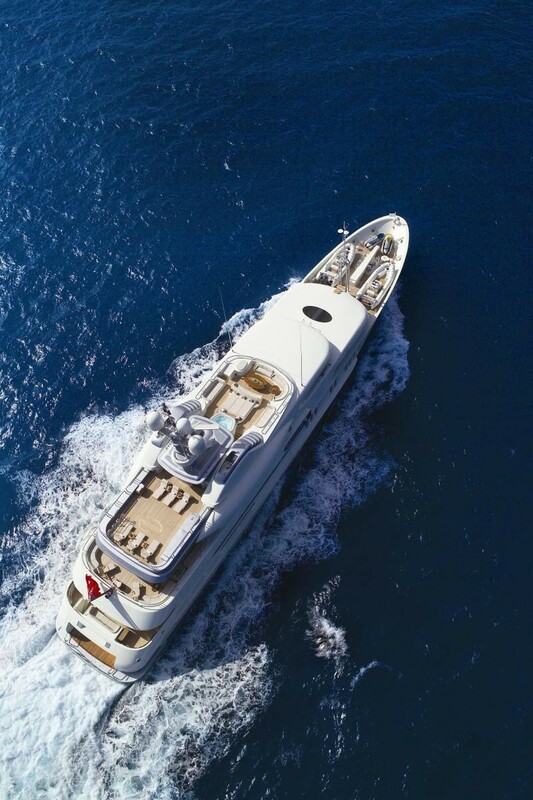 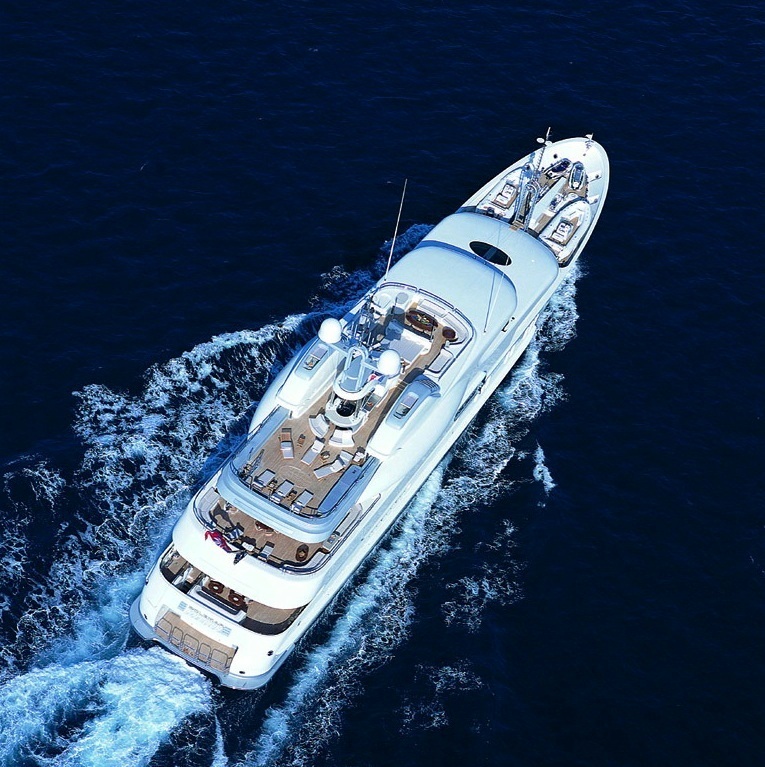 She is a 61.5m luxury yacht which features meticulous design detailing, lovely exterior styling and huge interior spaces. 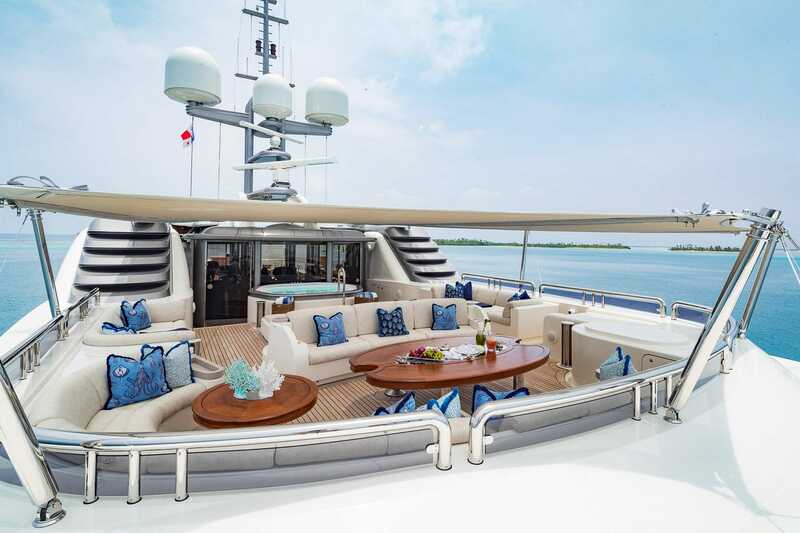 Her side deck areas are also abundant with space, such as the expansive sun deck, where you can lounge in the sun and relax or enjoy al fresco dining. 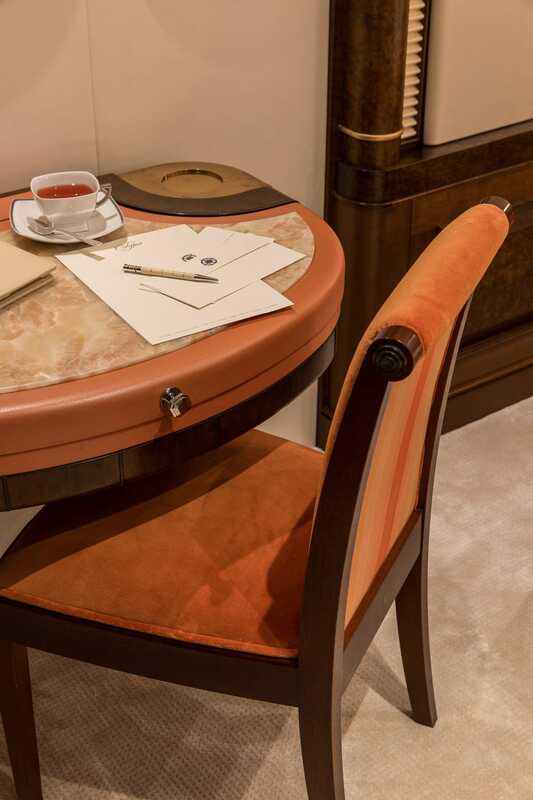 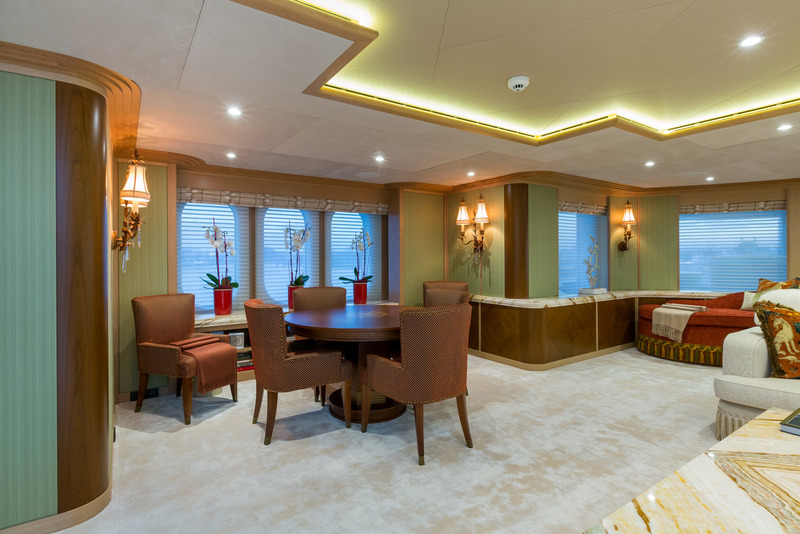 In 2016/17, the yacht received an extensive refit throughout, she boasts a neutral décor, with a timeless ambiance and sophisticated finish. 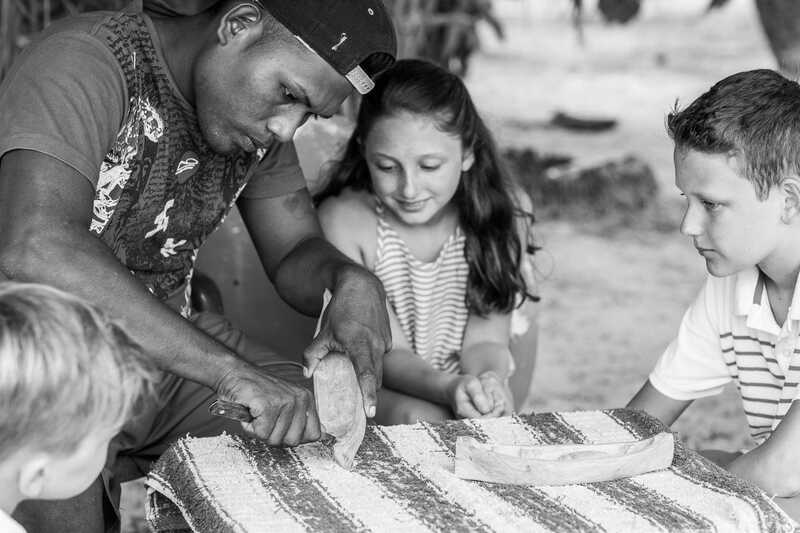 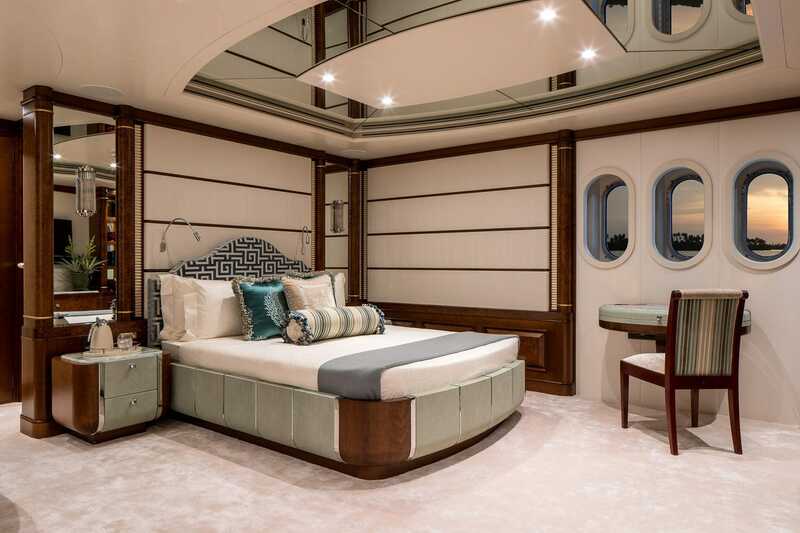 CALYPSO’s beautiful interior conveys a contemporary feel with raised and fielded paneling in cherry wood. 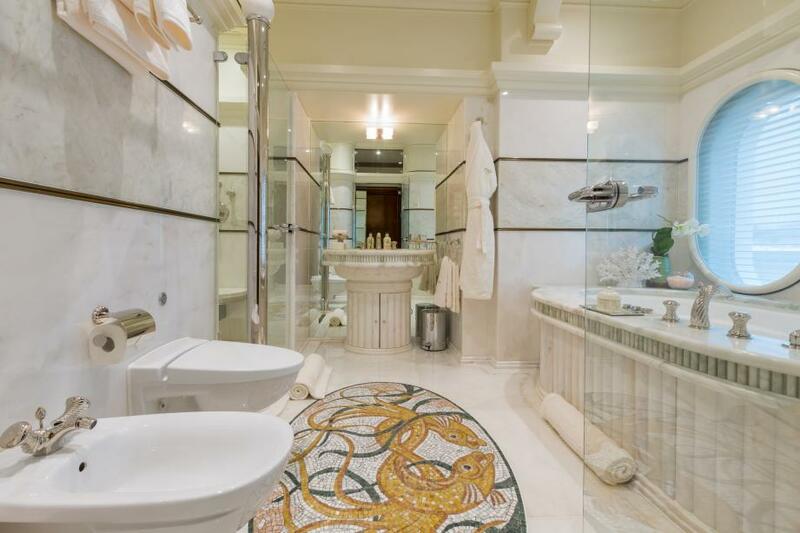 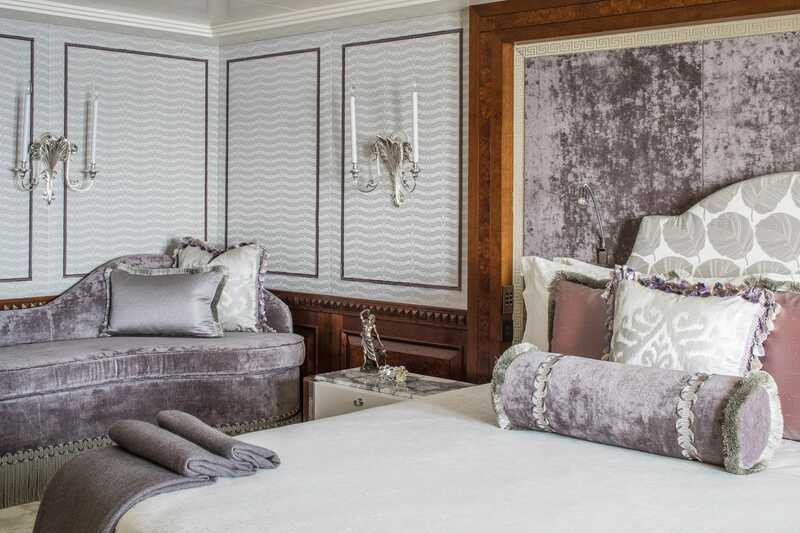 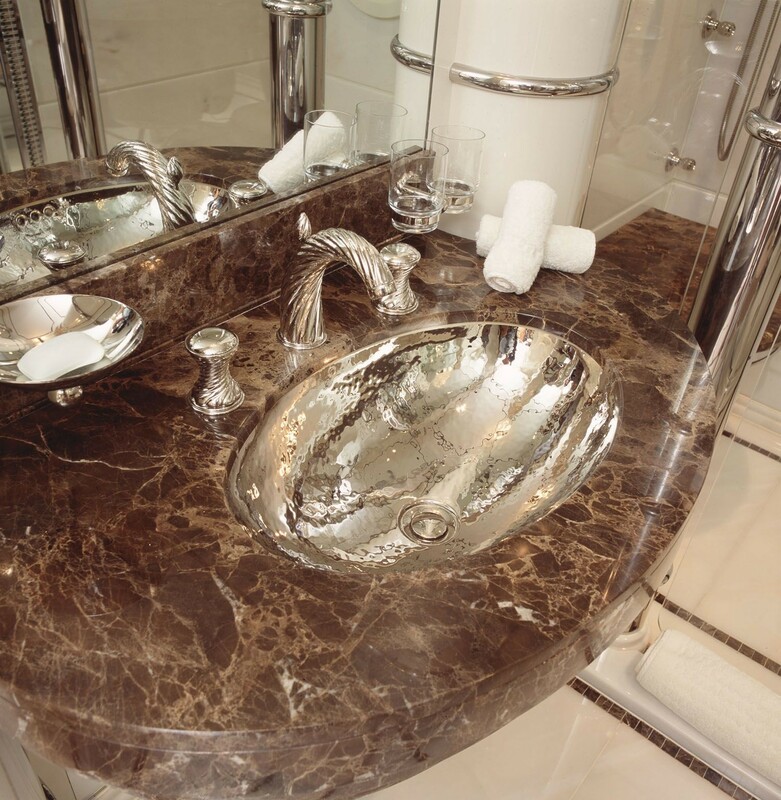 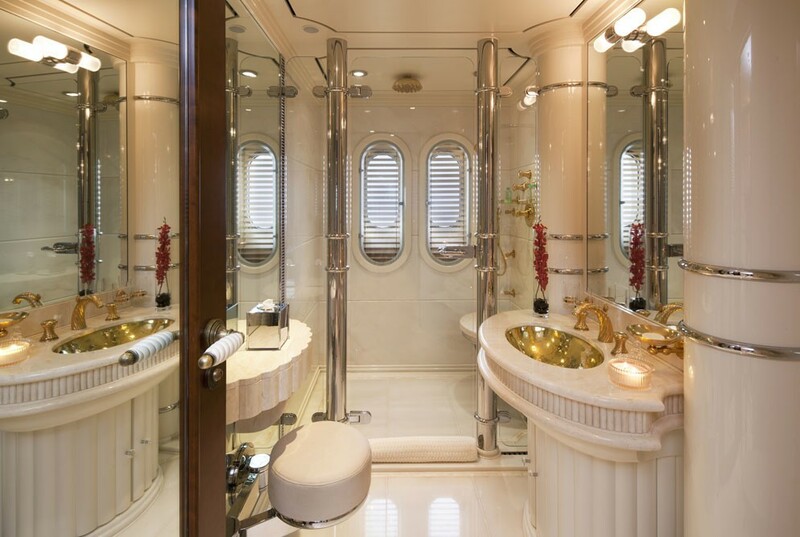 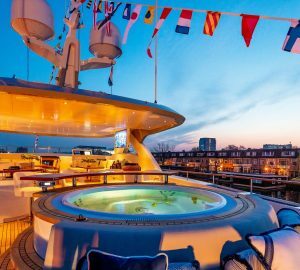 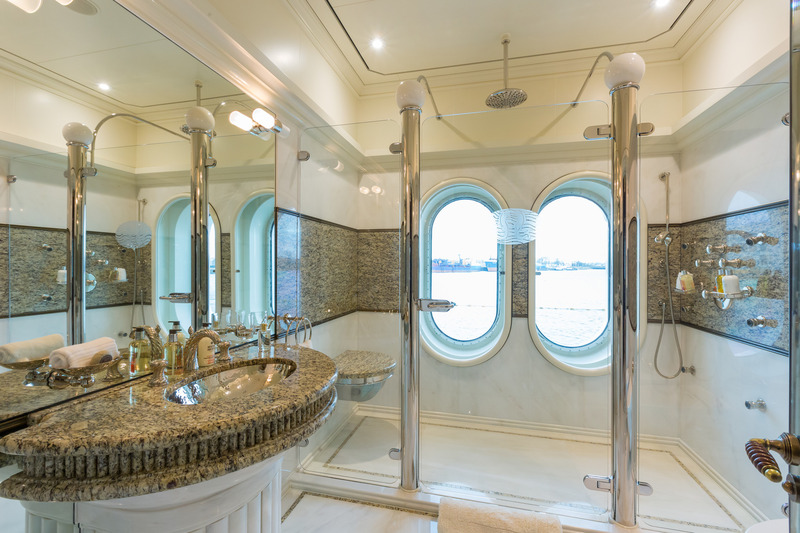 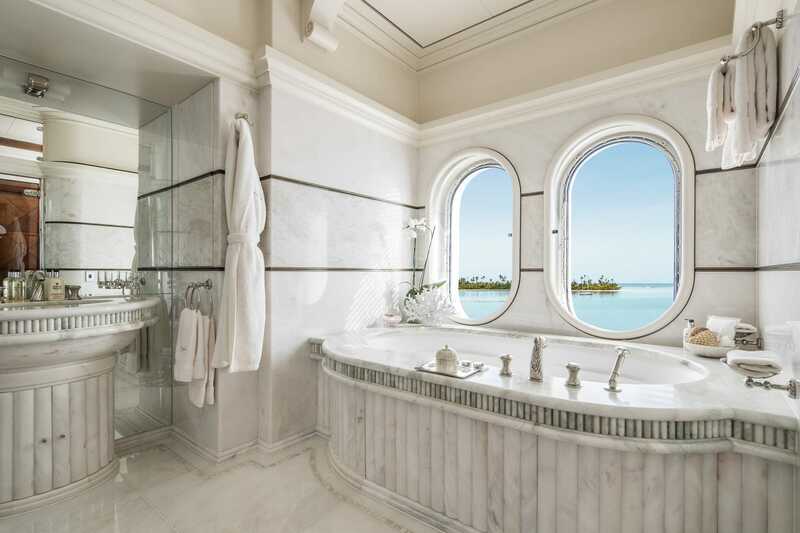 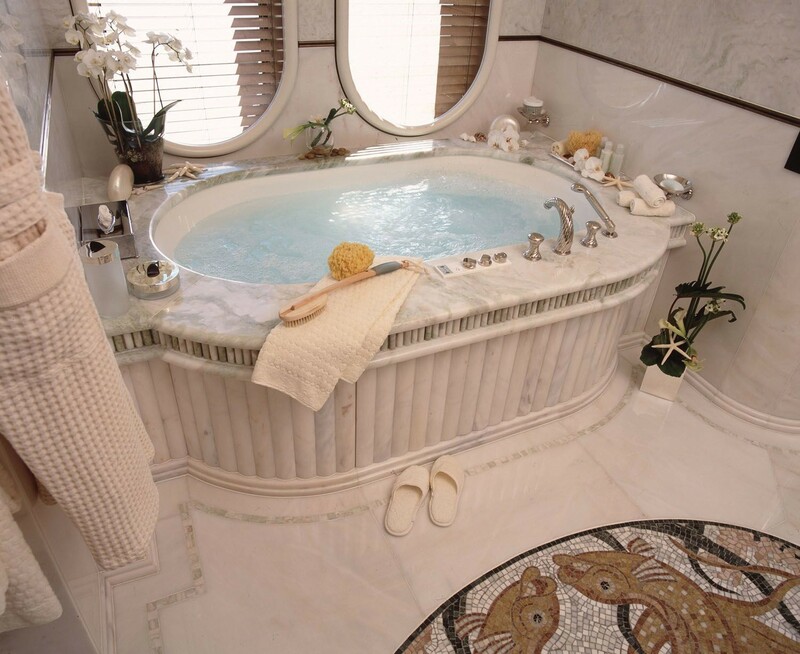 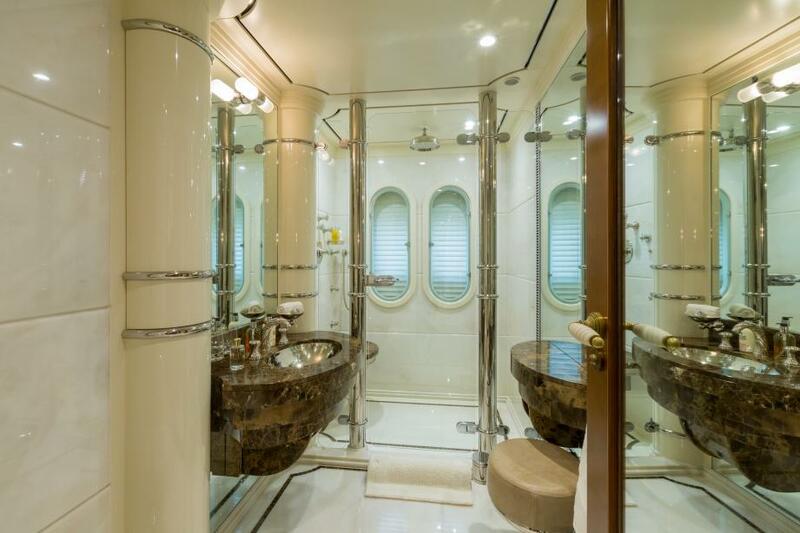 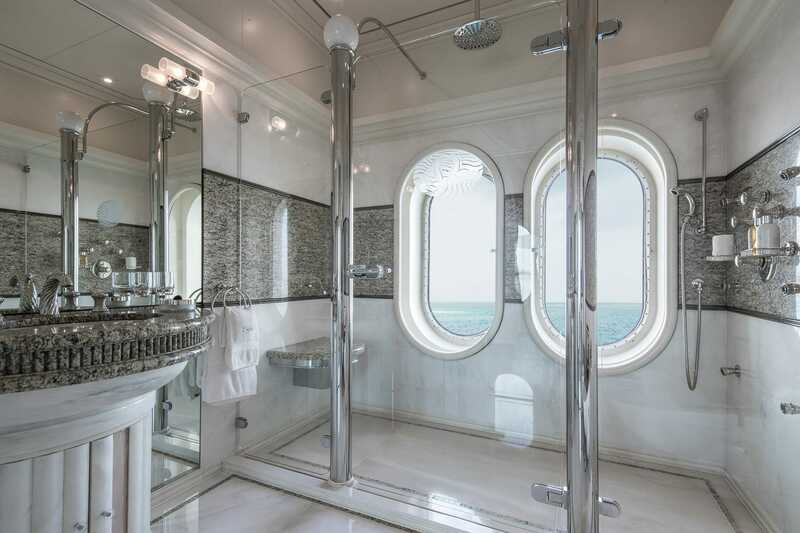 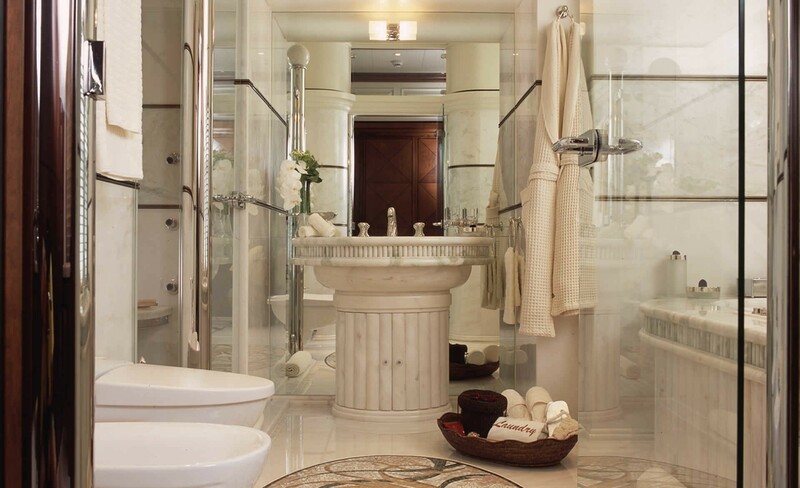 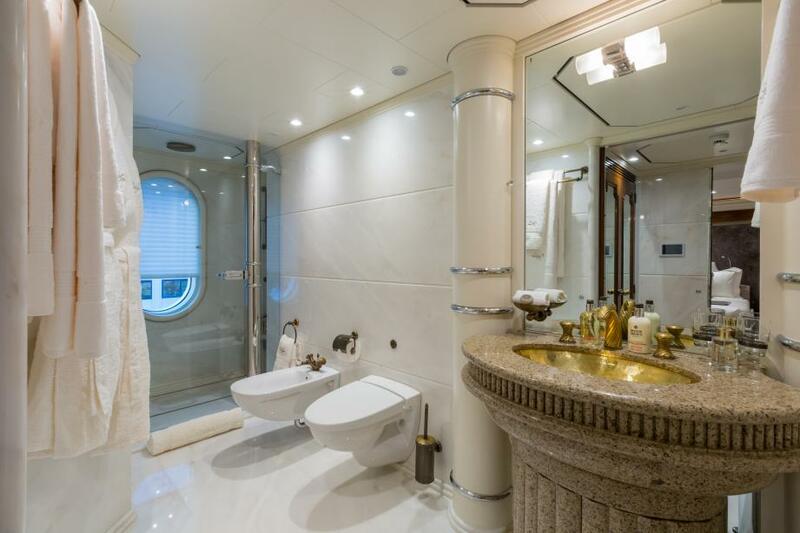 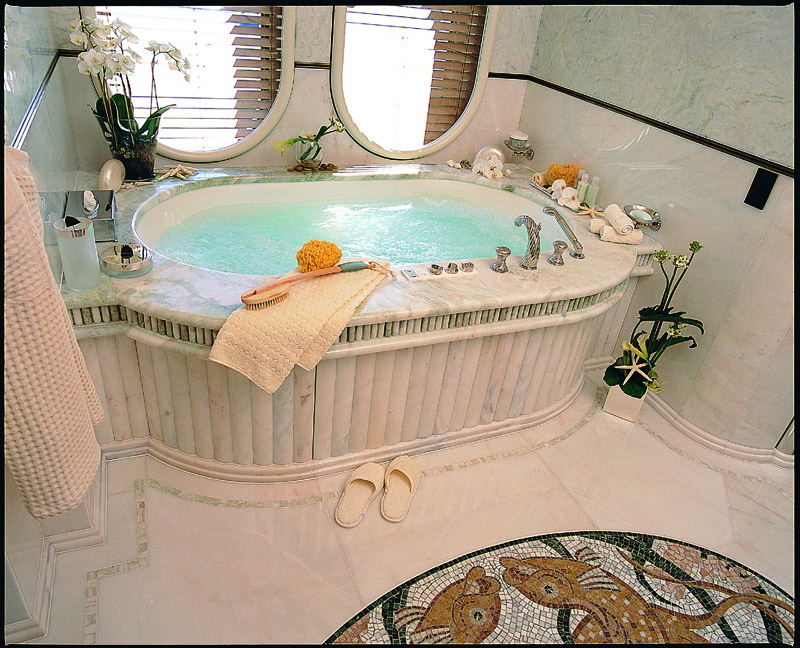 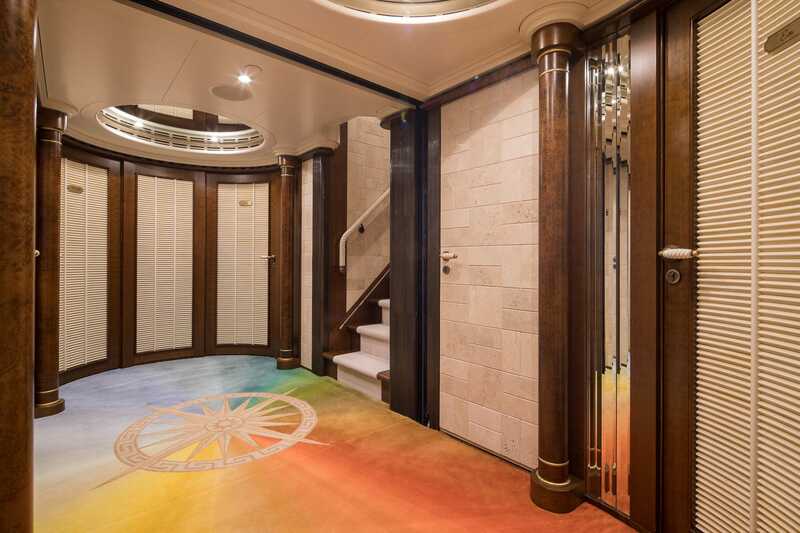 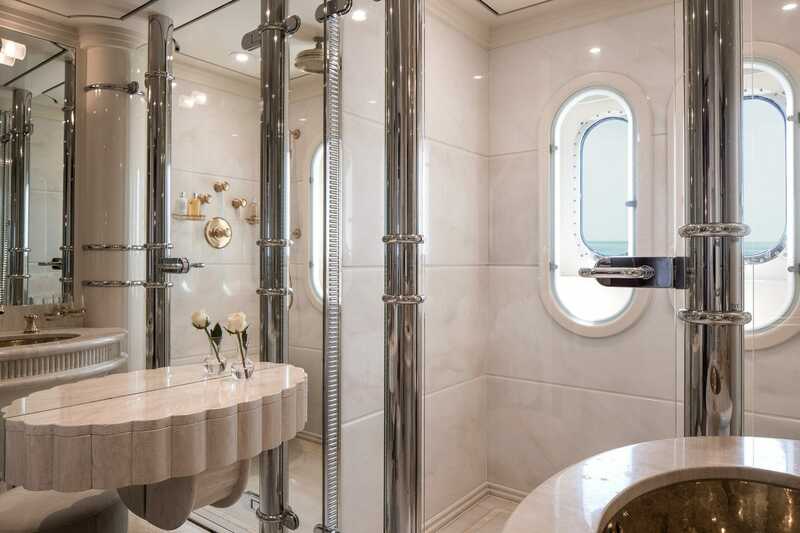 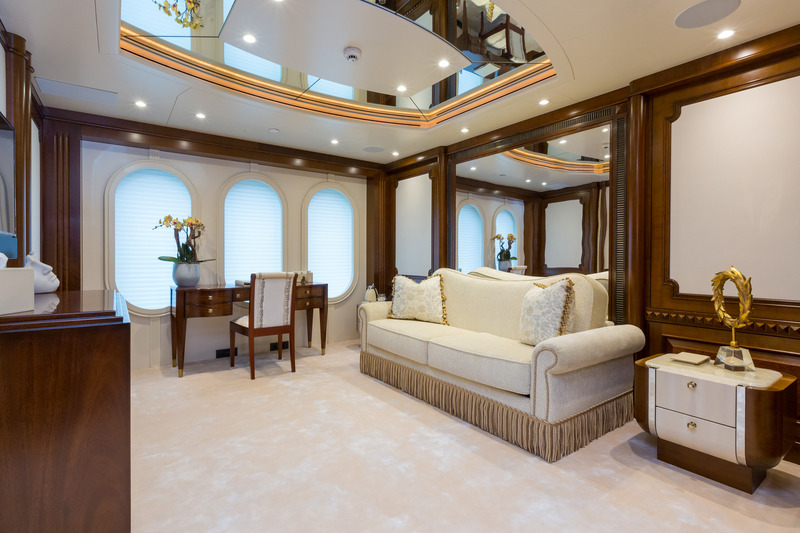 A lovely sumptuous ambiance flows through the entire yacht, with a widespread use of marble and colorful fabrics and furnishings. 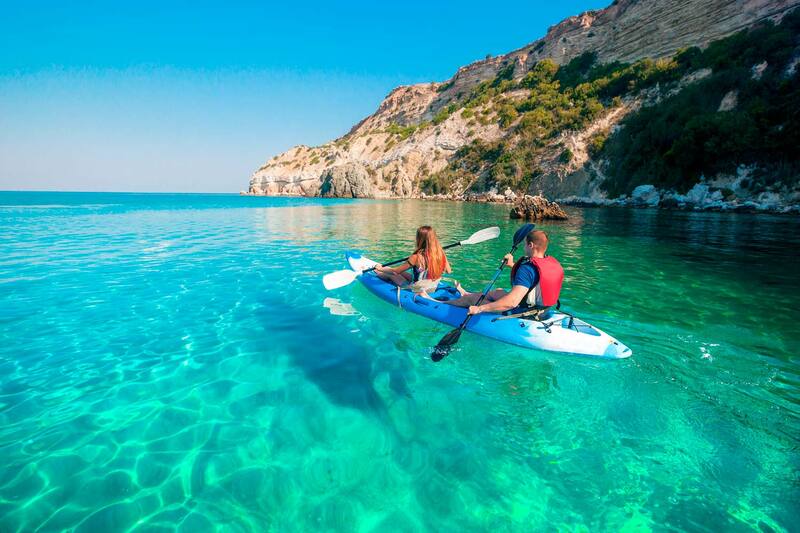 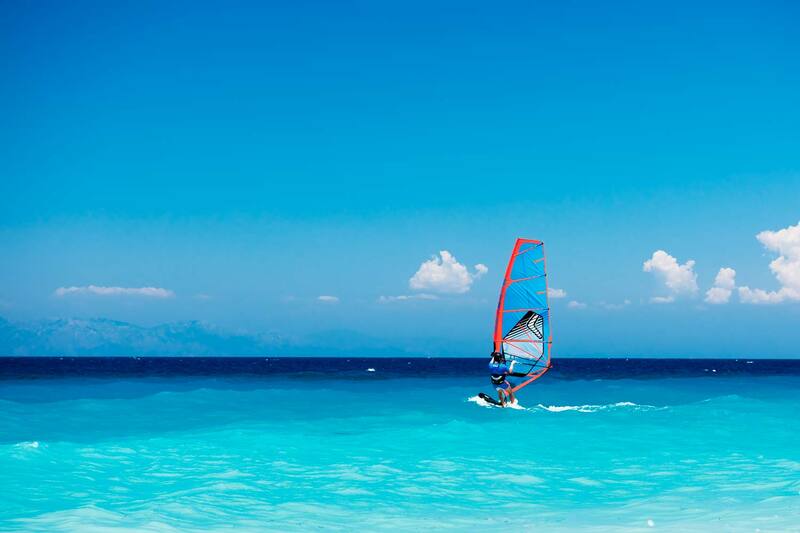 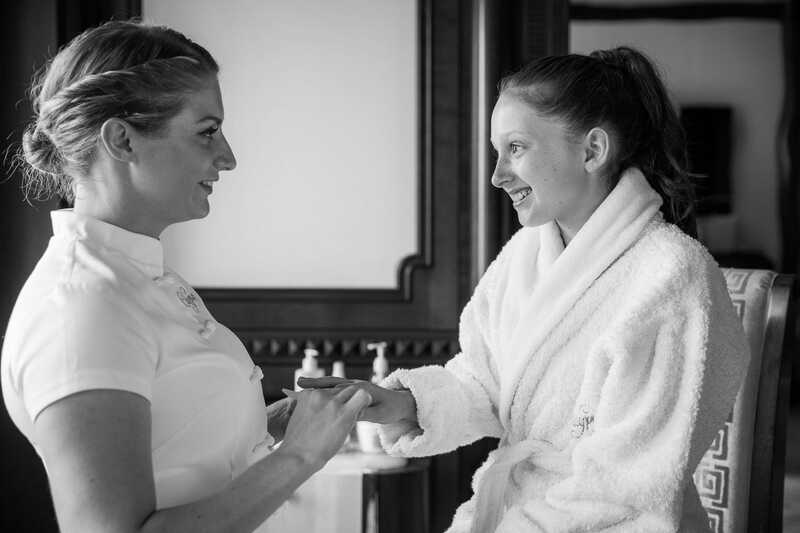 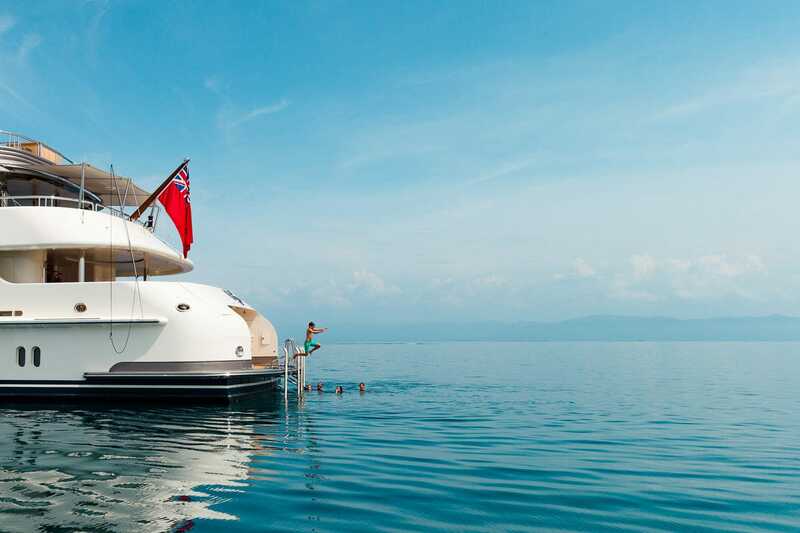 She also offers charter guest a new fully equipped gymnasium as well as a fantastic Spa Pool. 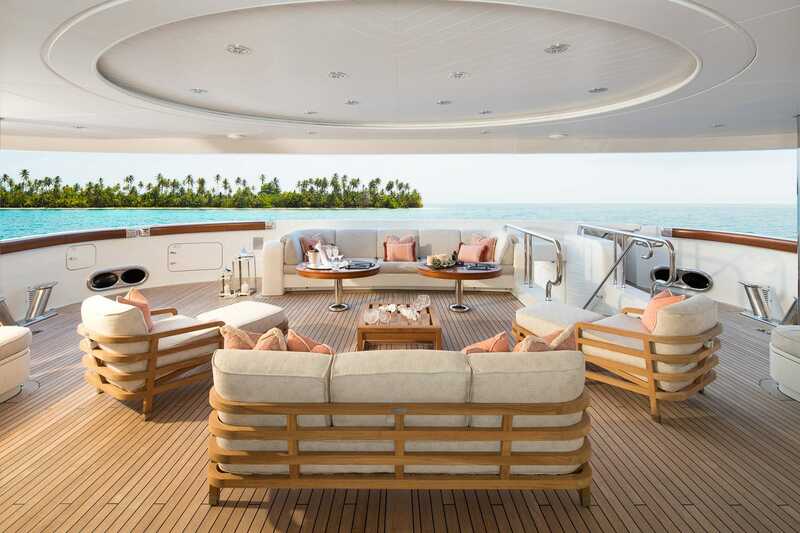 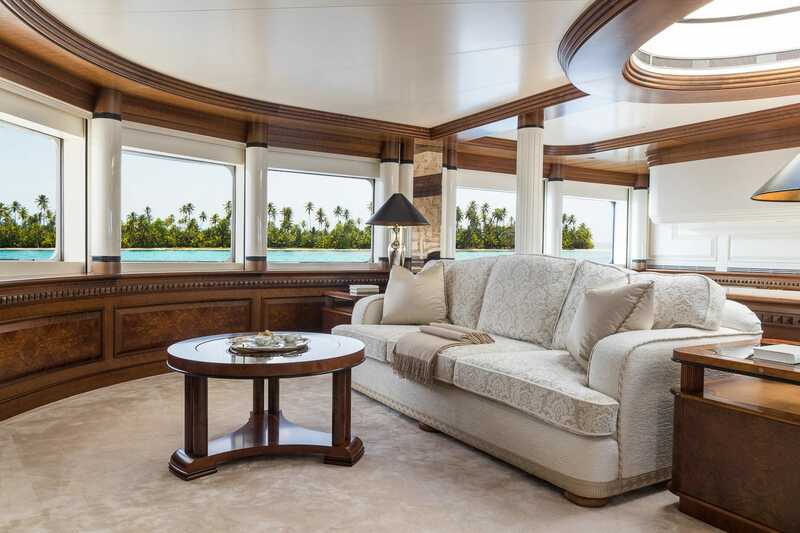 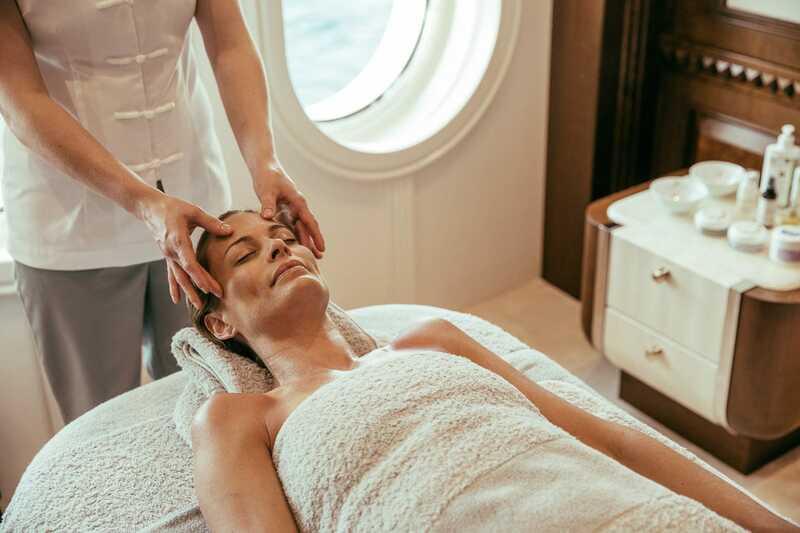 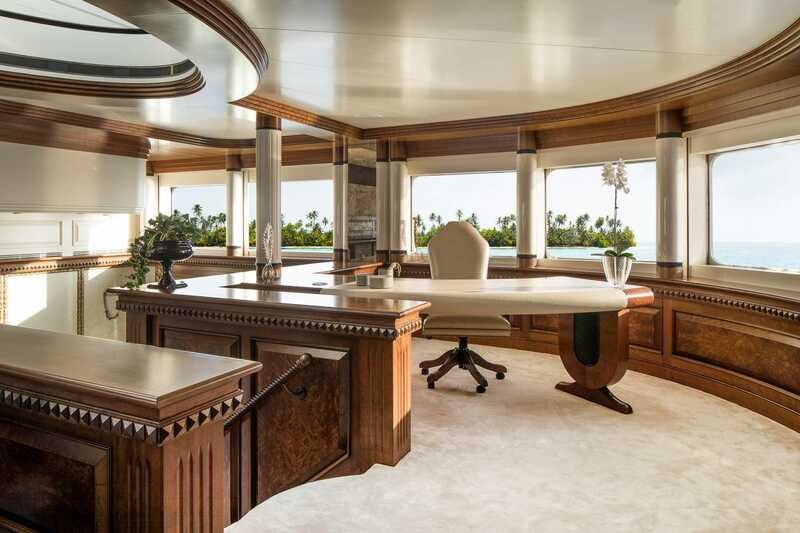 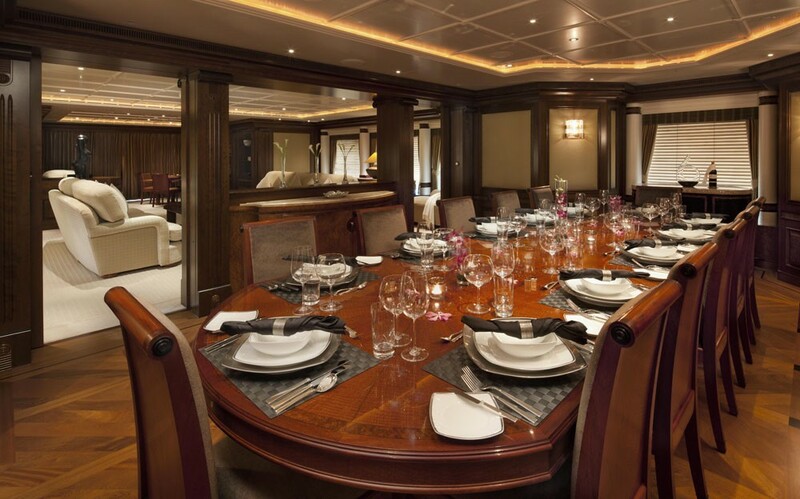 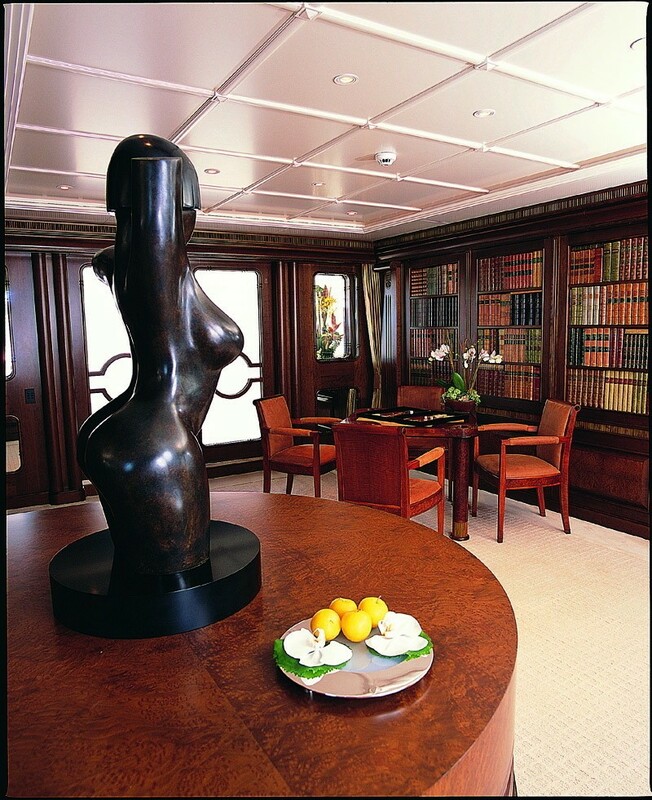 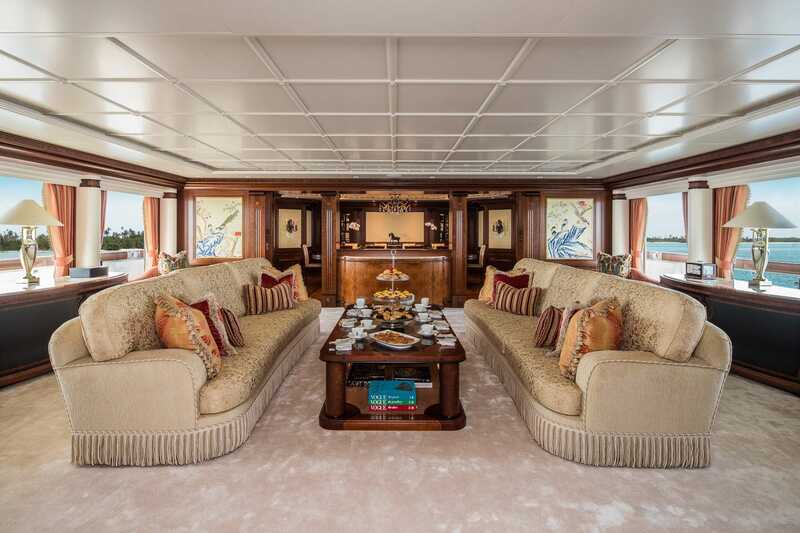 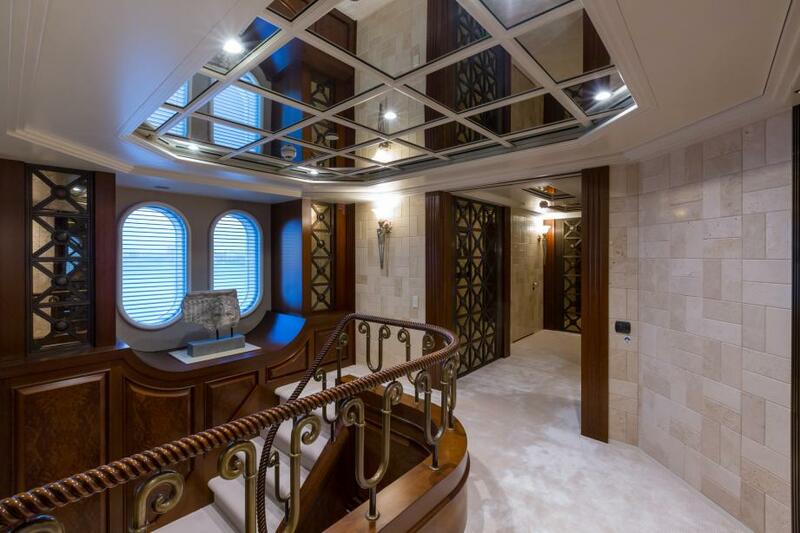 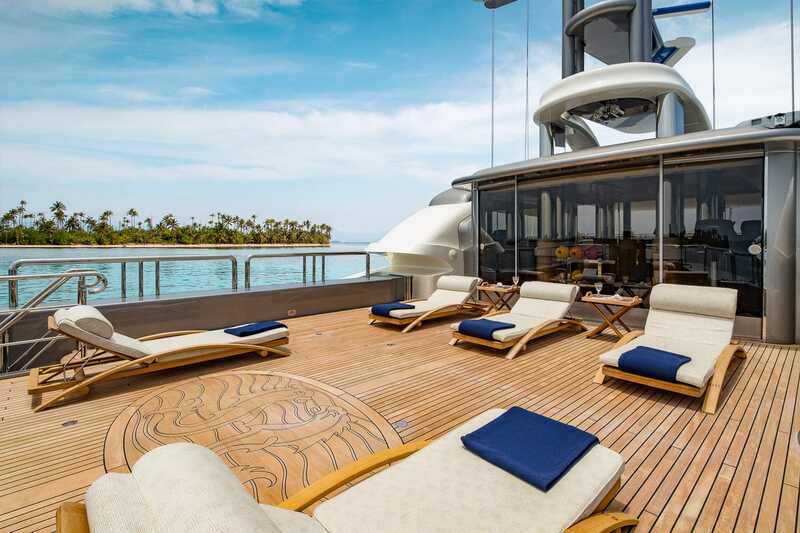 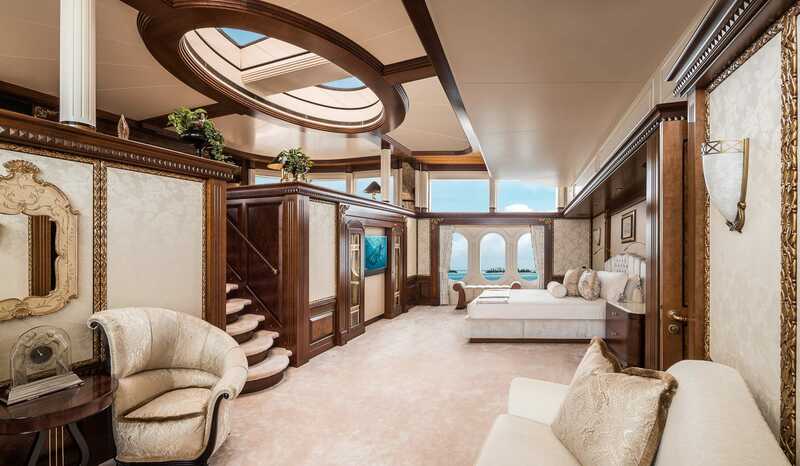 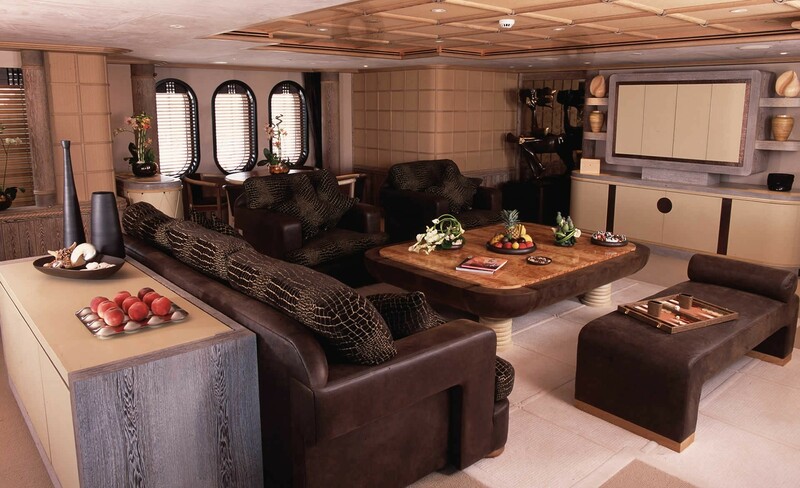 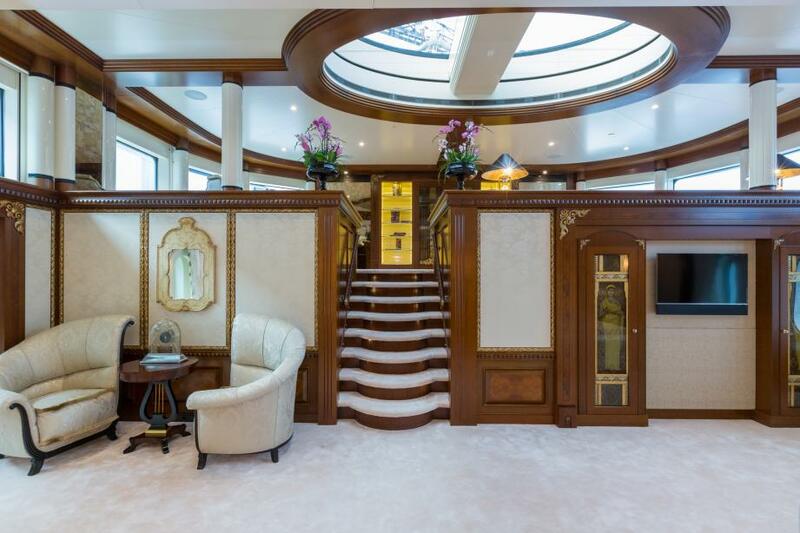 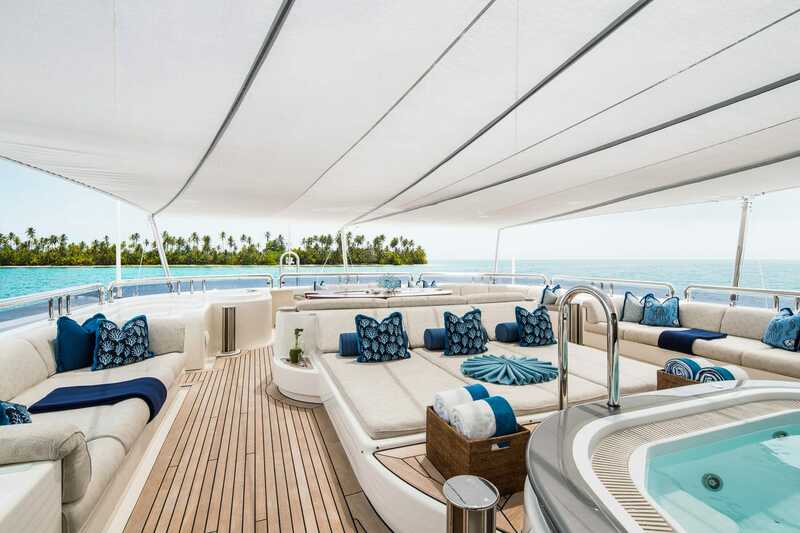 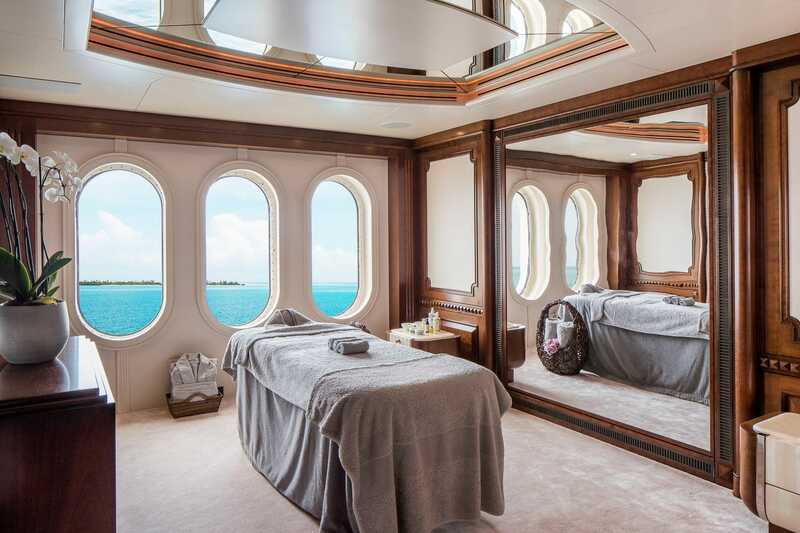 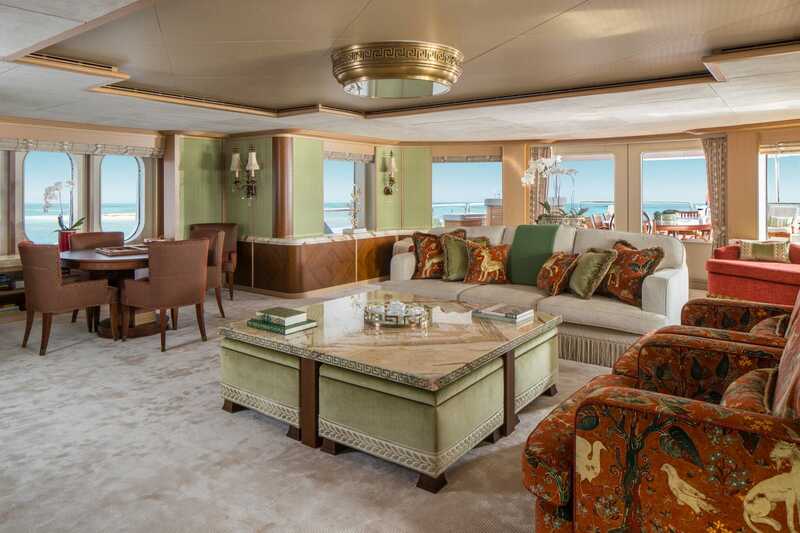 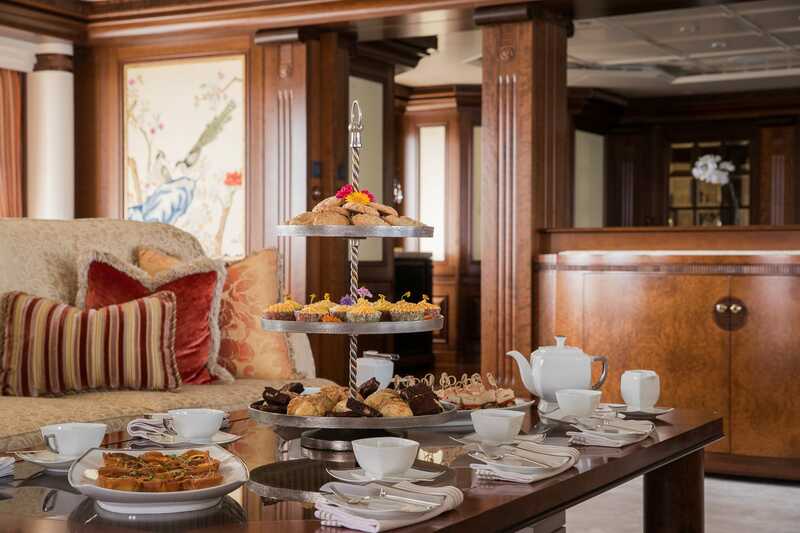 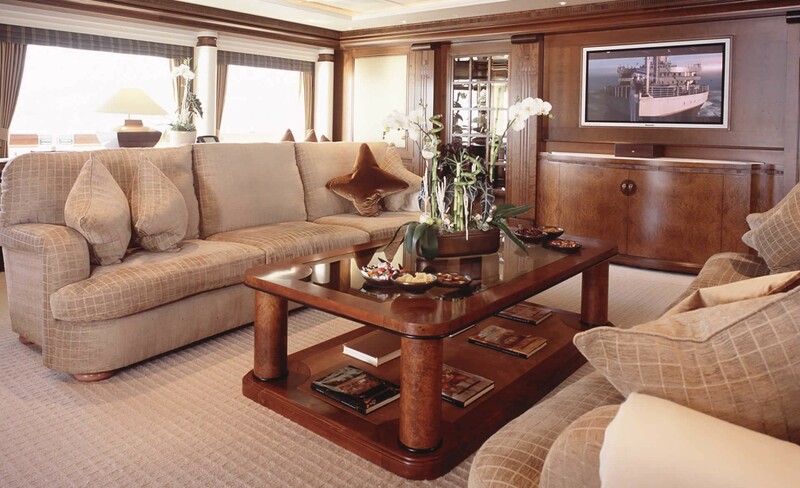 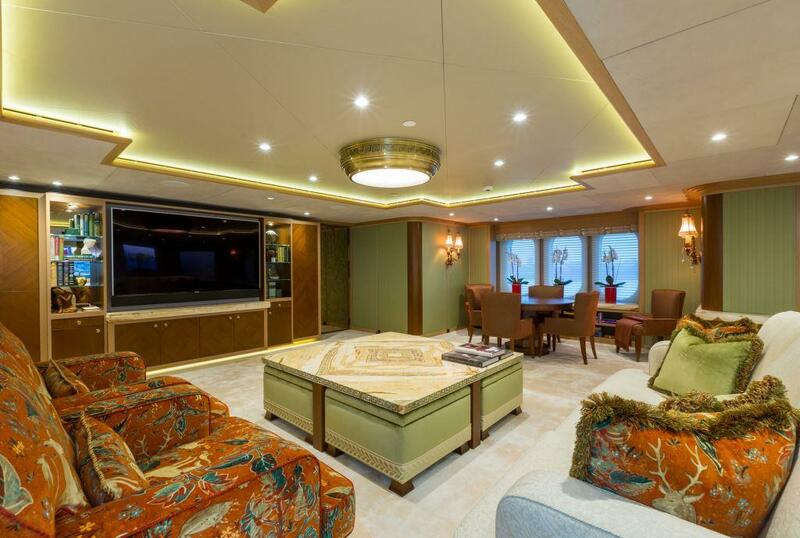 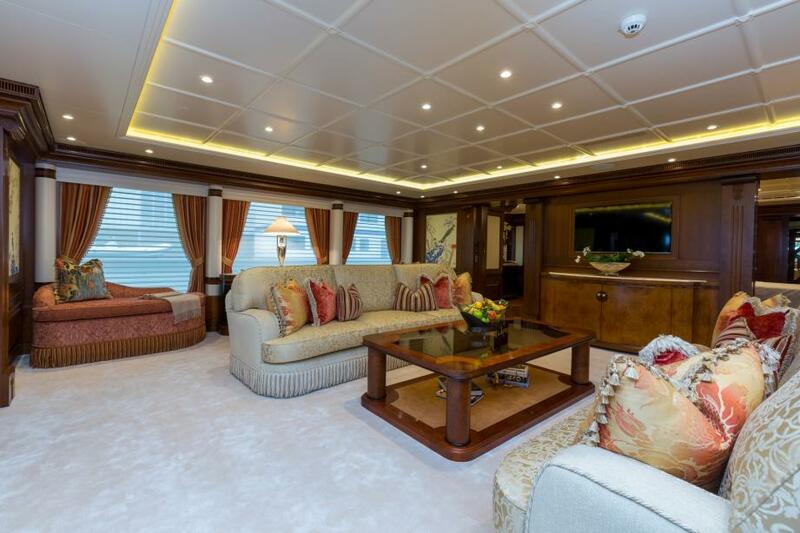 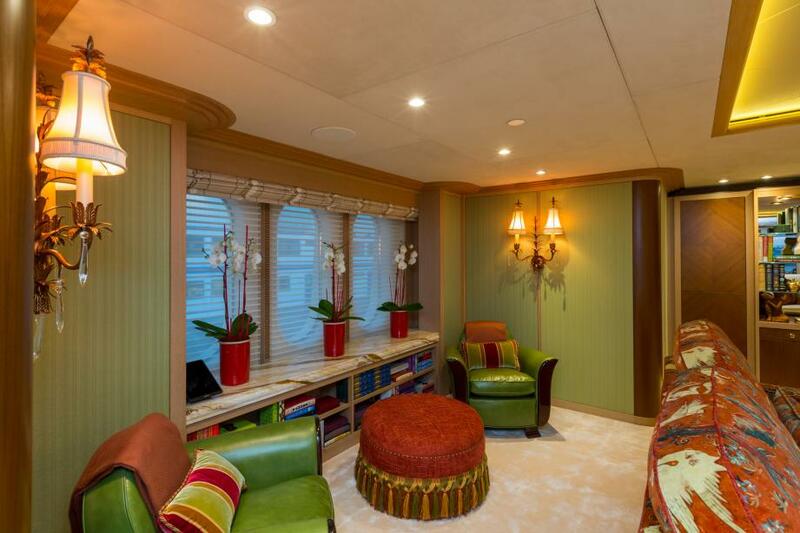 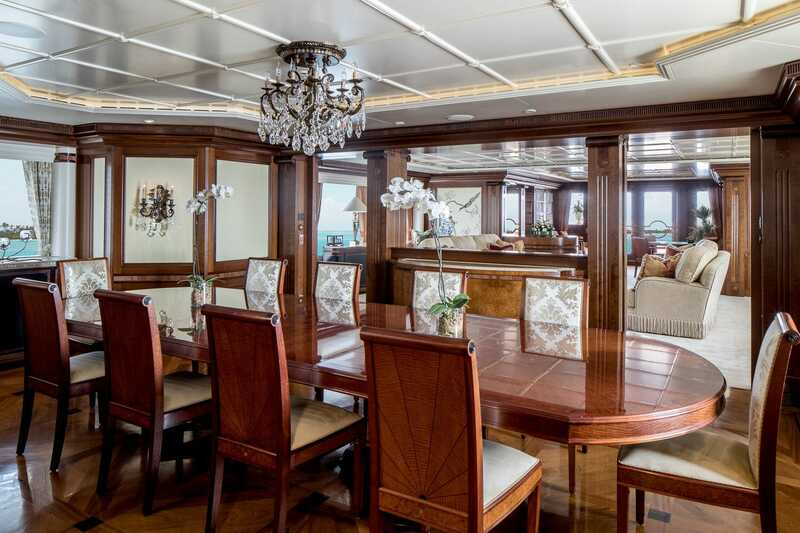 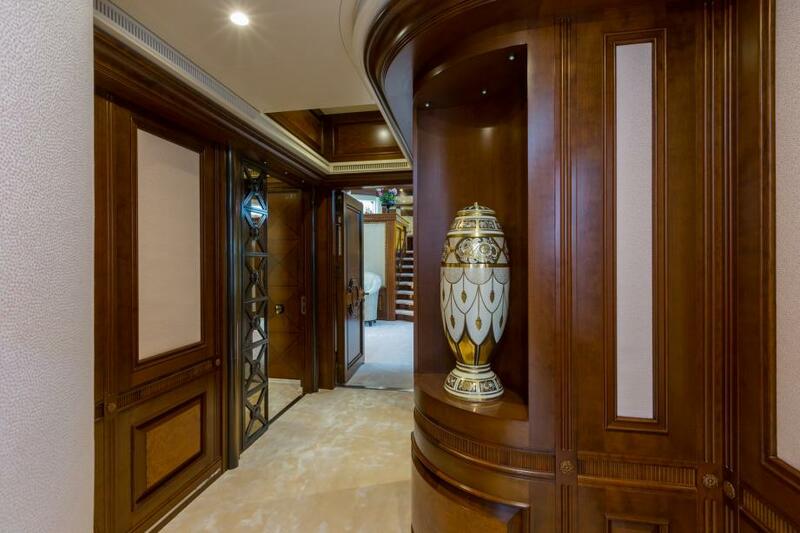 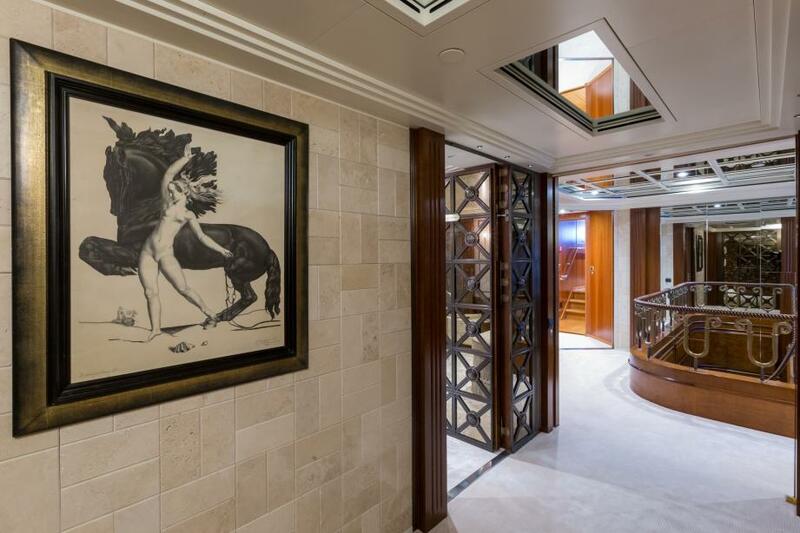 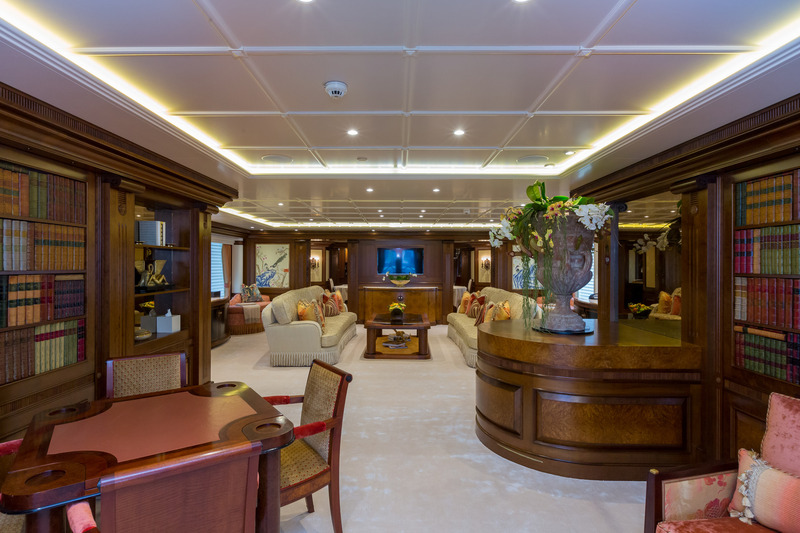 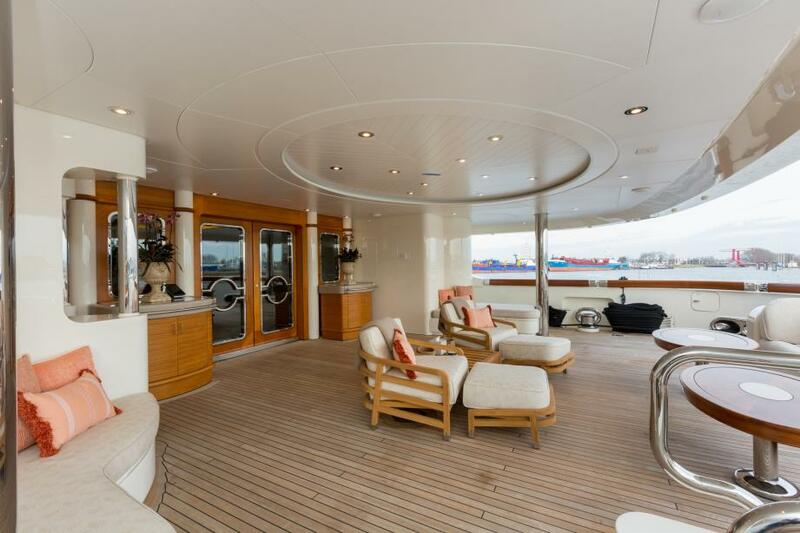 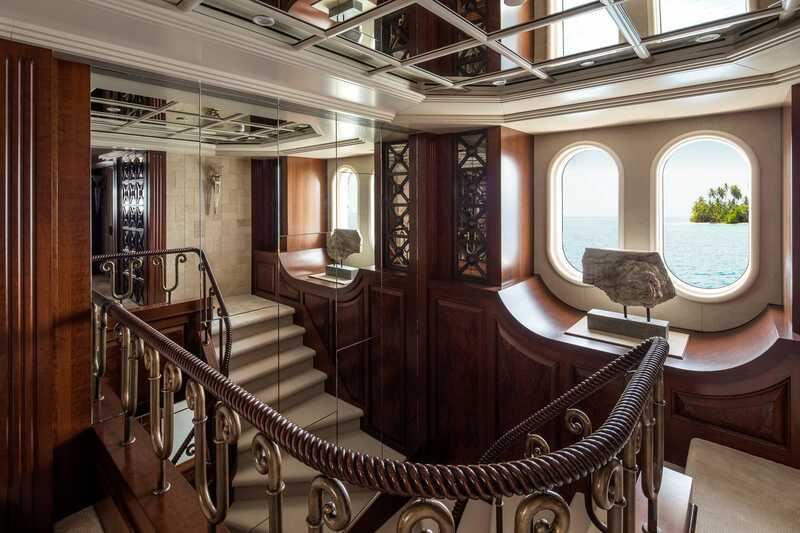 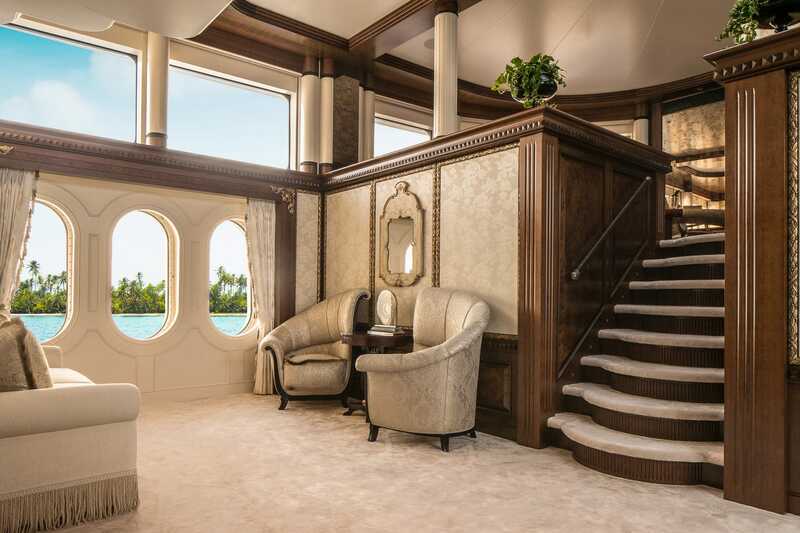 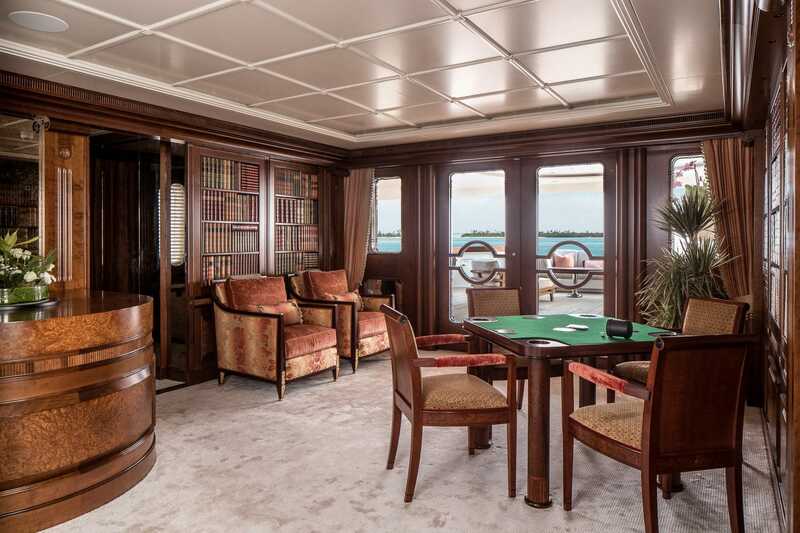 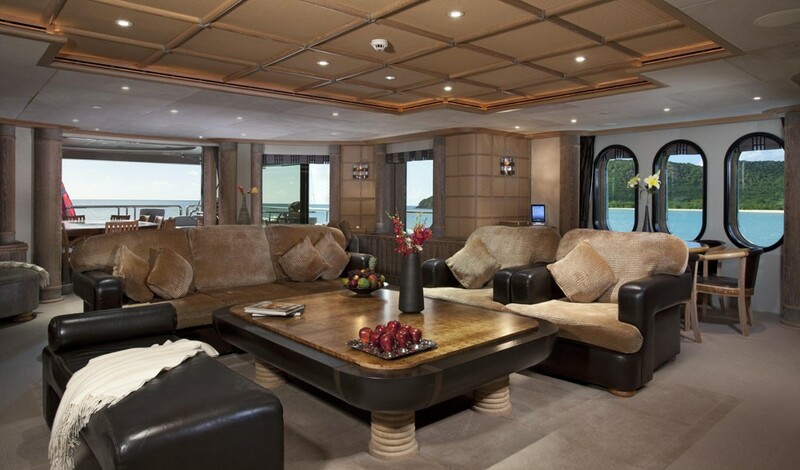 On the main deck, the expansive salon offers a sumptuous lounge and adjacent private library. 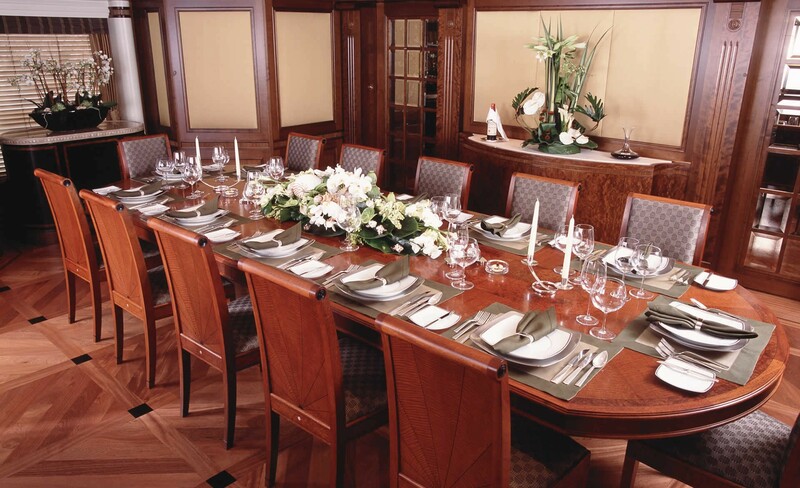 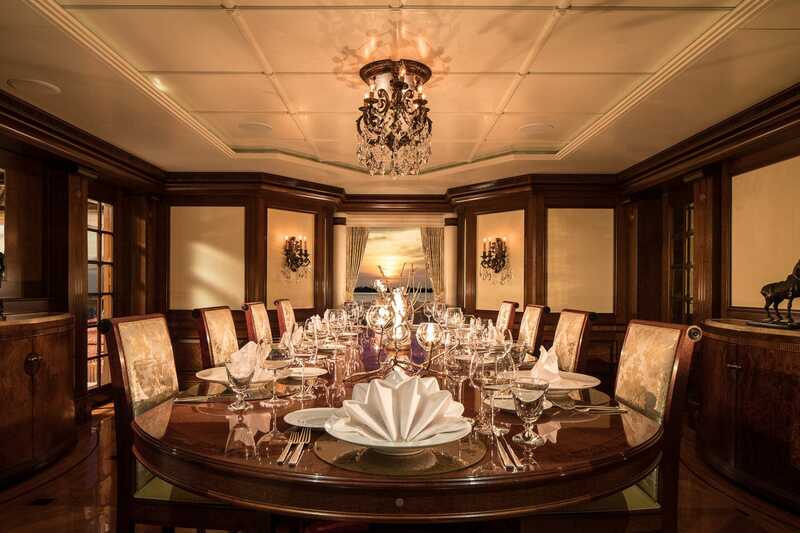 Separate and forward is the formal dining table, seating 12 guests in elegance. 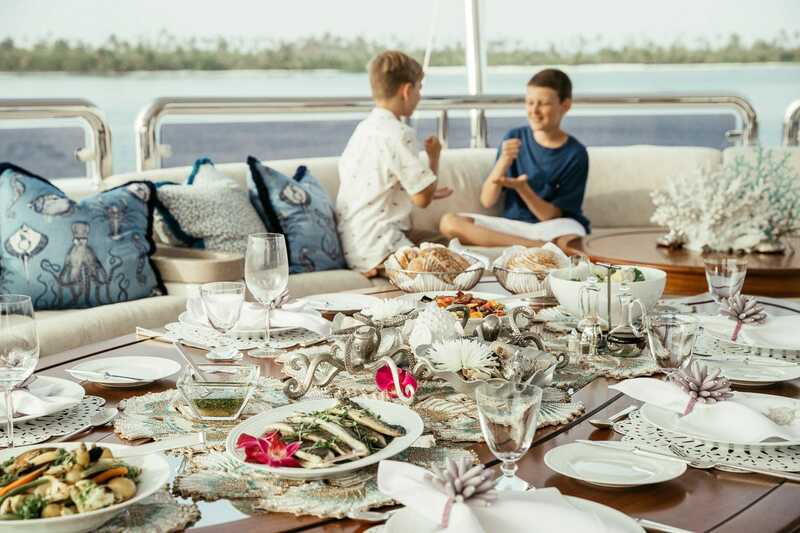 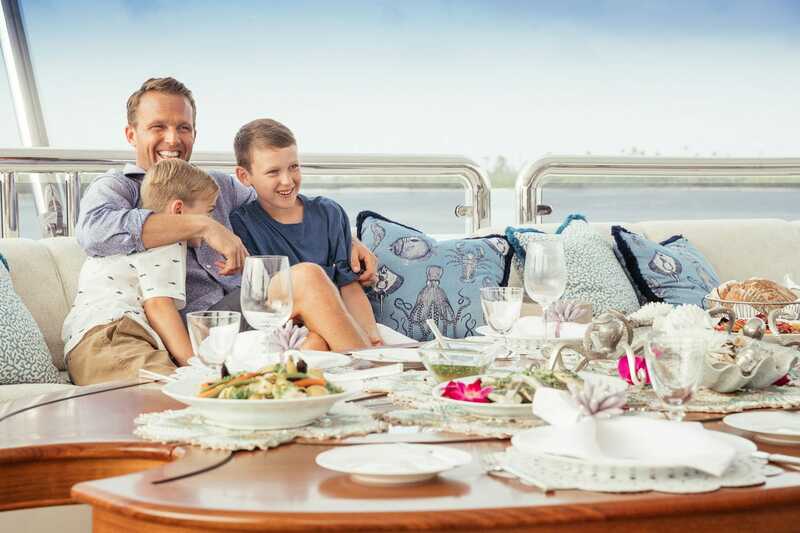 The exterior living is over 3 well-appointed decks, perfect for entertaining large groups or simply relaxing. 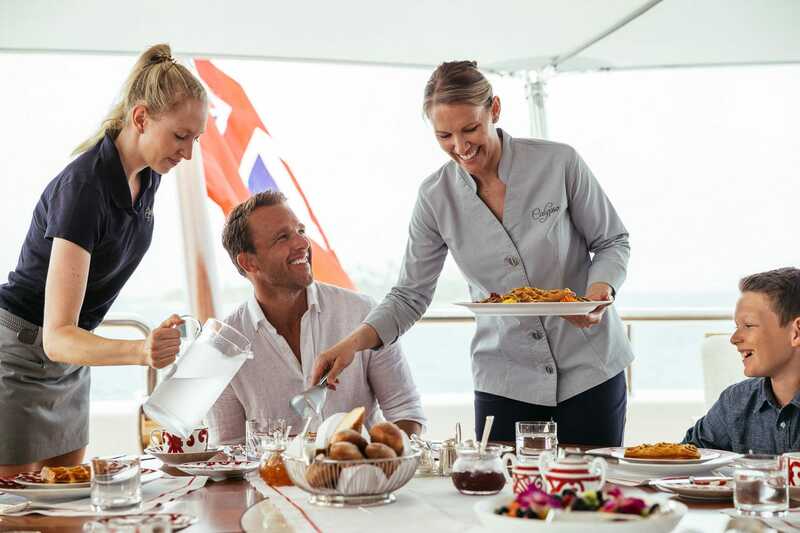 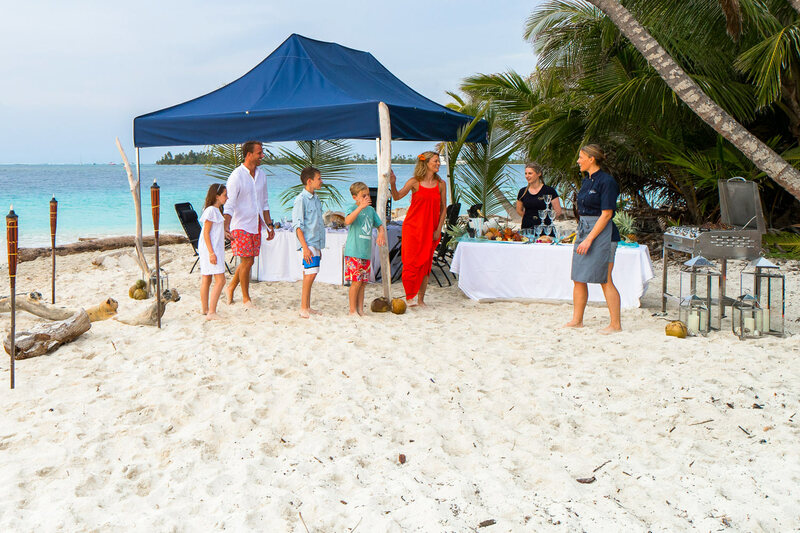 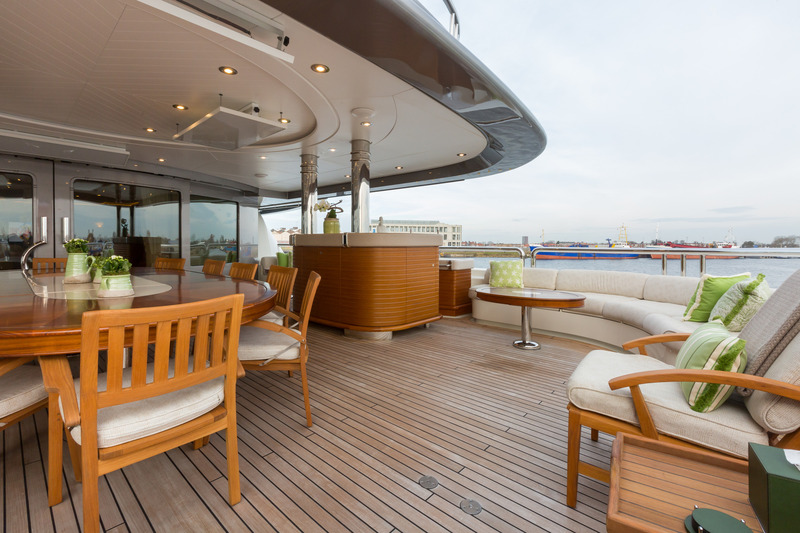 On the main deck is a shaded seating area, complete with the option of alfresco dining. 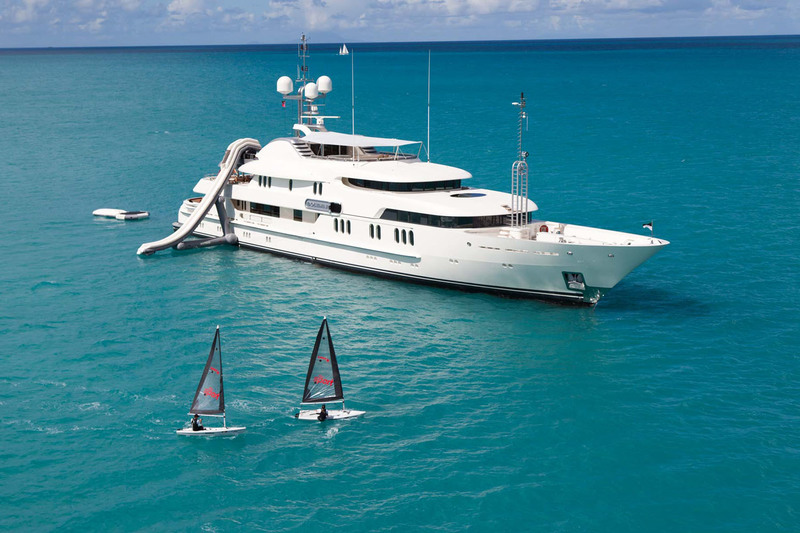 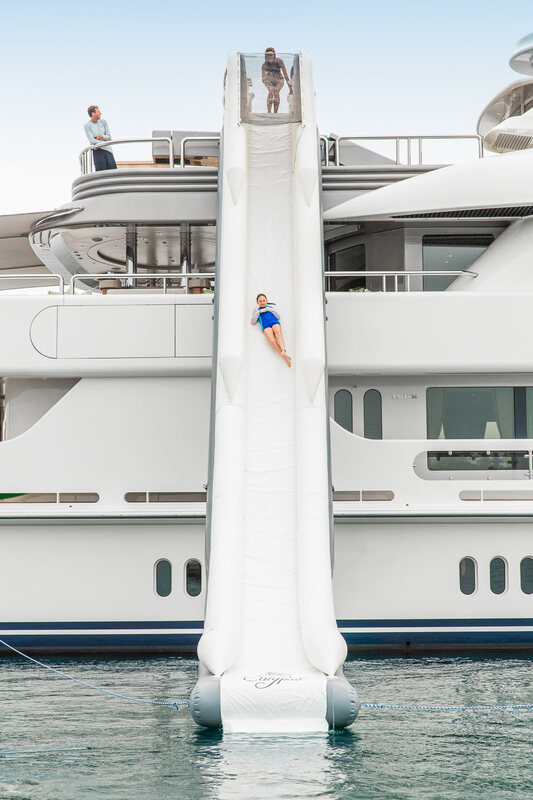 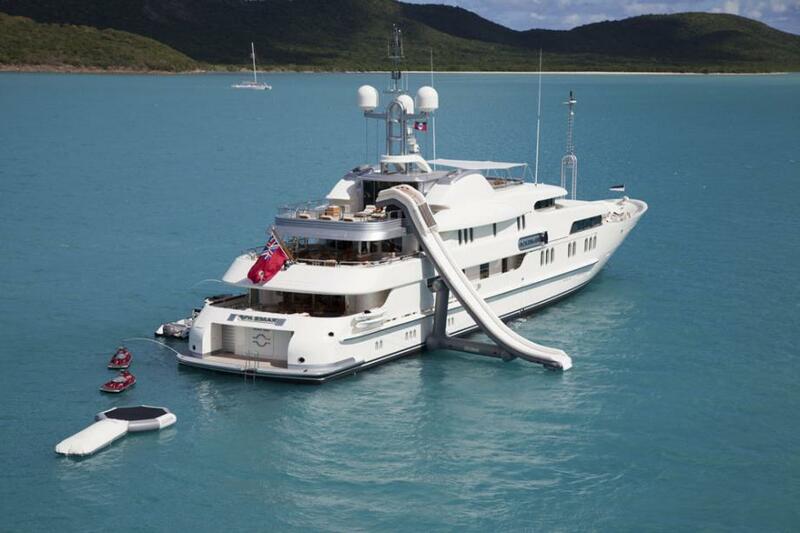 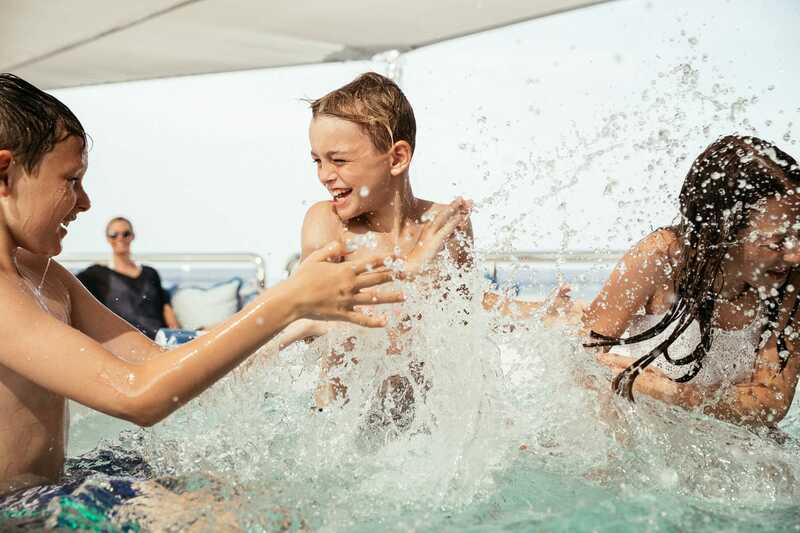 Steps lead from the main deck aft to the extended swim platform and water toys activity center. 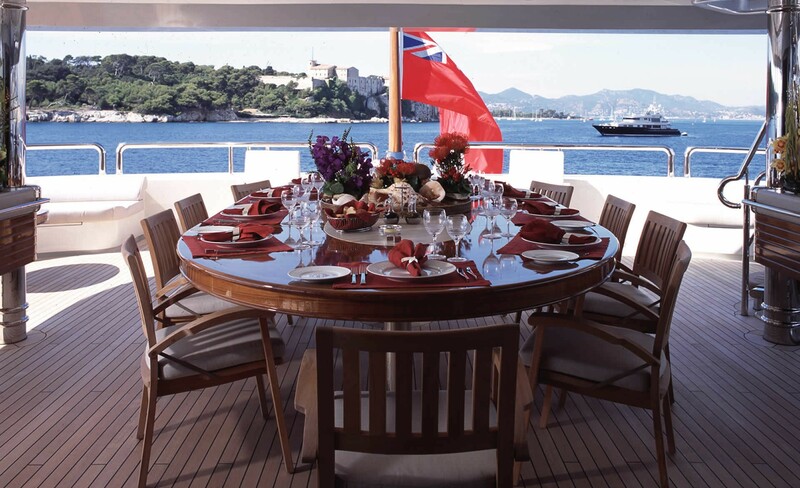 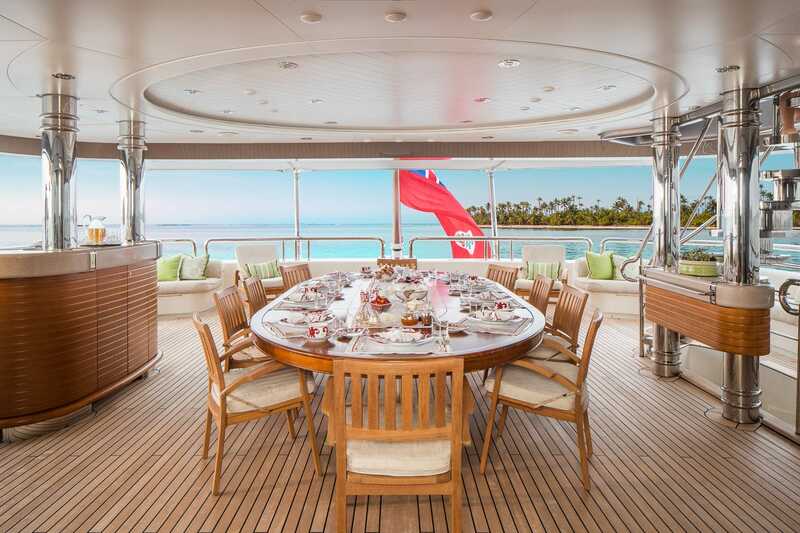 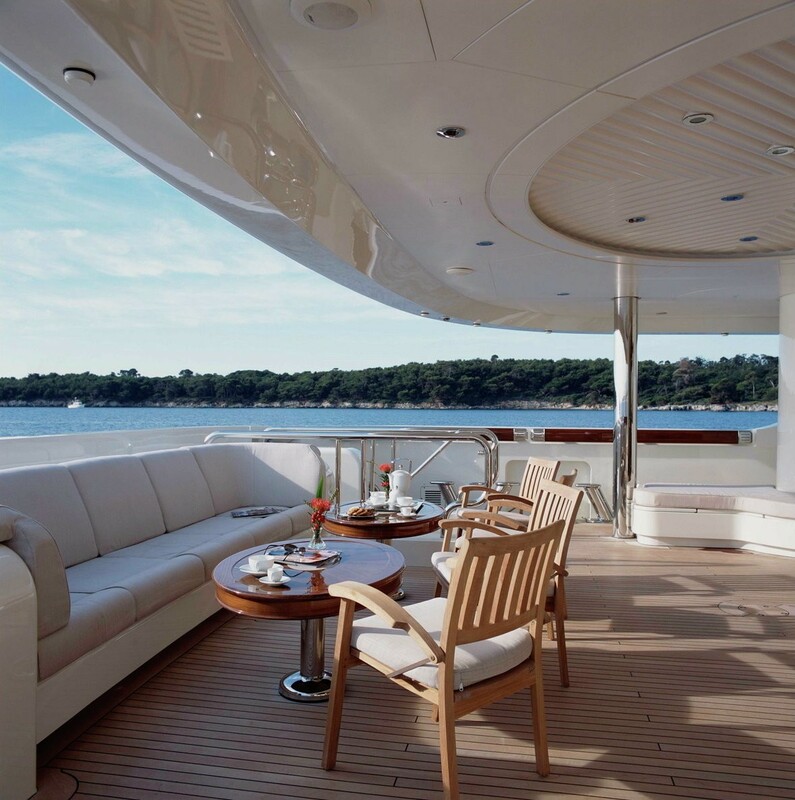 The upper aft deck features a further alfresco dining area, seating, wet bar and partial shade. 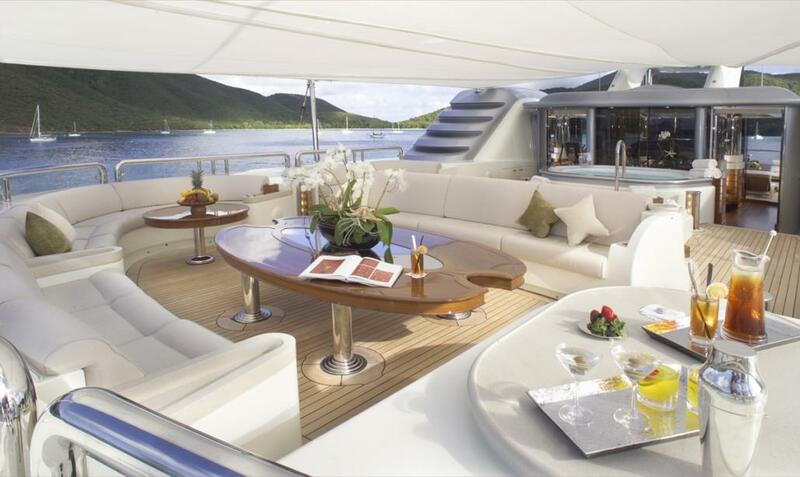 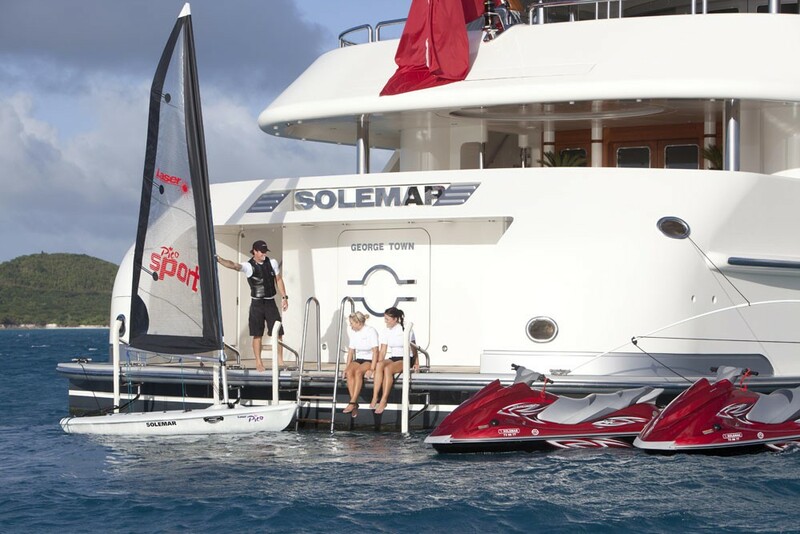 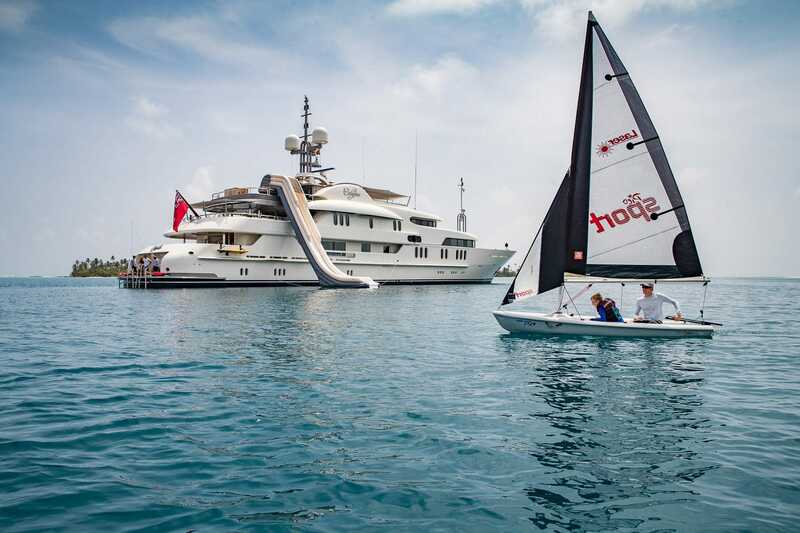 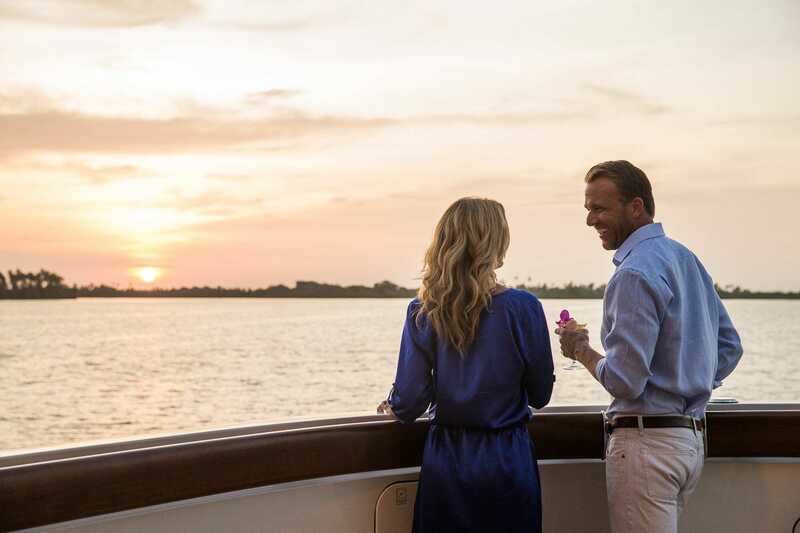 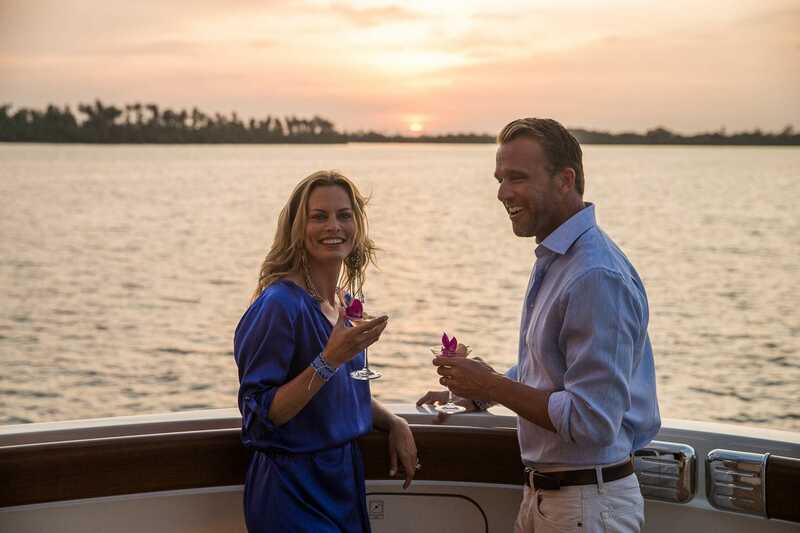 Her sundeck is exceptionally well designed and offers both an aft and a forward section. 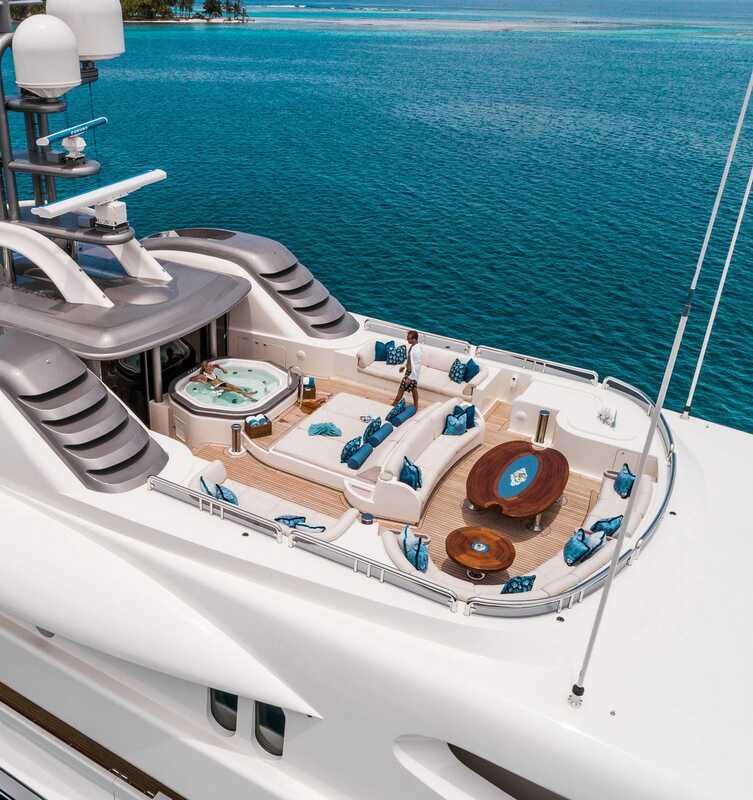 The forward area has comfortable seating, alfresco dining, sunpads and a Jacuzzi tub. 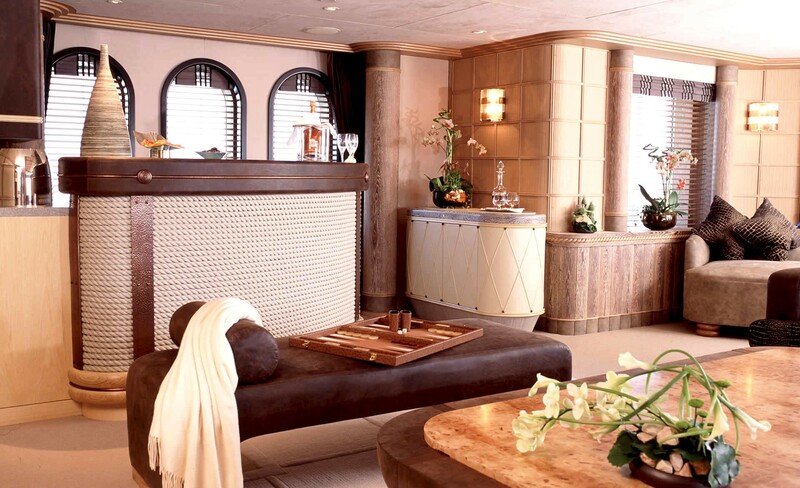 Centered, is a fully equipped air conditioned gym for the fitness enthusiasts. 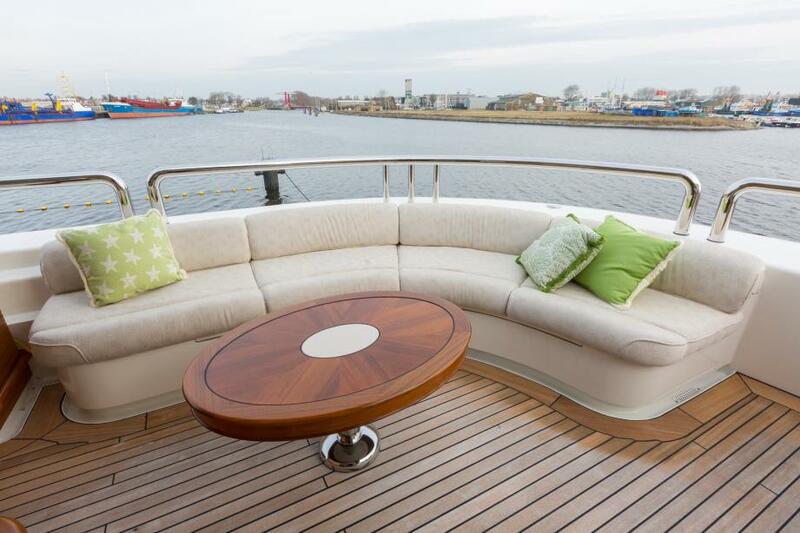 The aft section of the sundeck is incredibly spacious and has chaise loungers and seating. 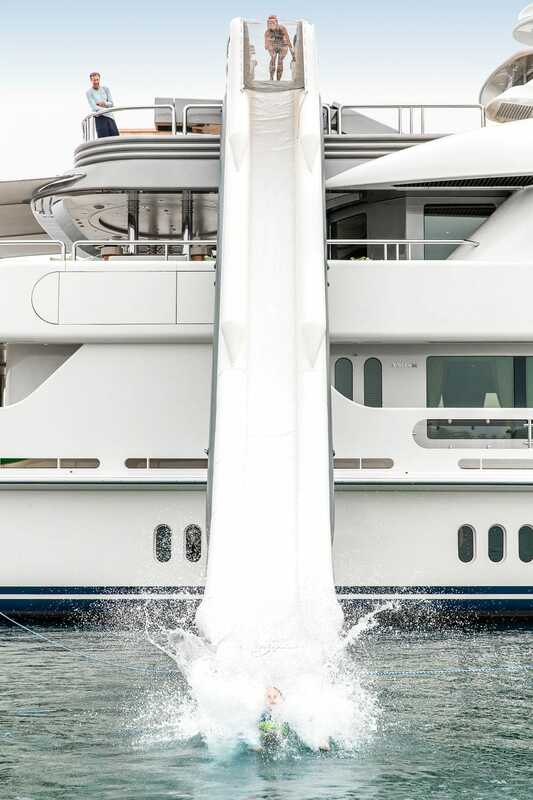 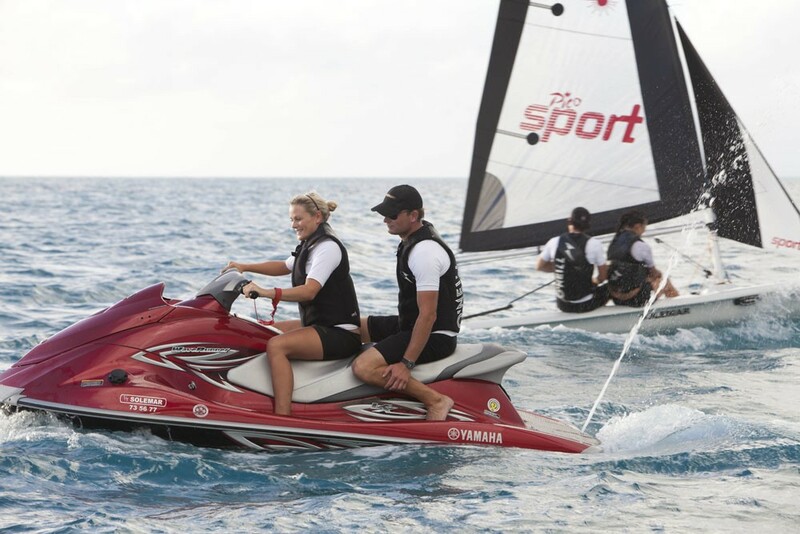 The yacht is powered by 2 x CAT 2,600hp engines with cruising speeds of 14 knots and top speeds of 15.5 knots. 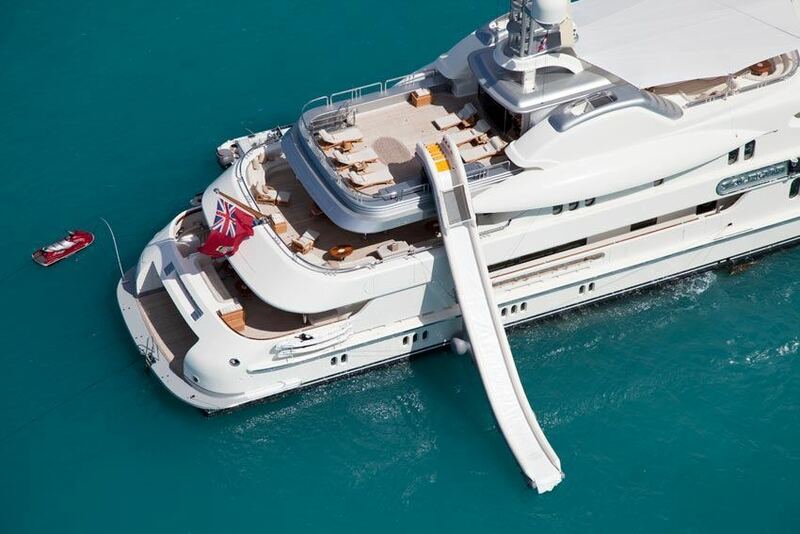 She has both at anchor and underway stabilizers for optimum comfort. 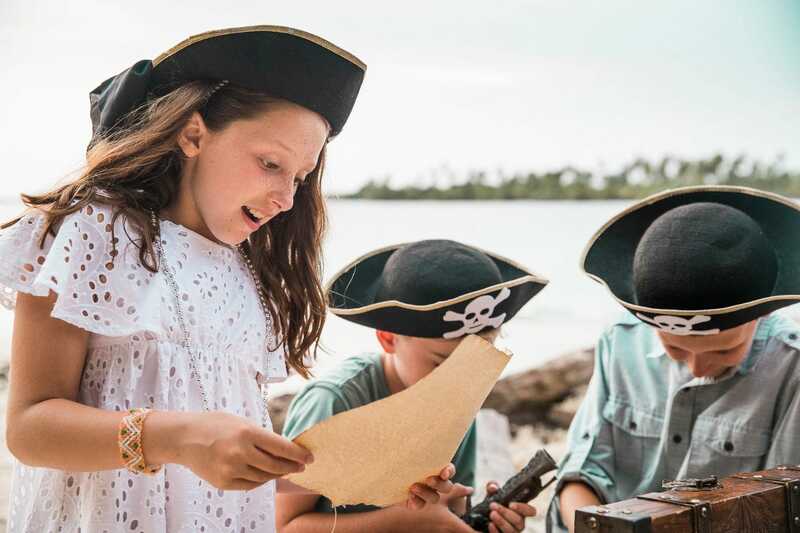 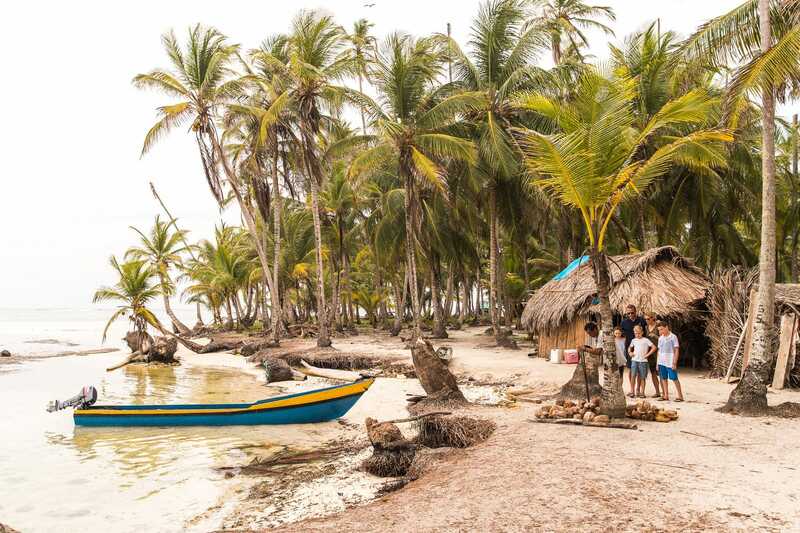 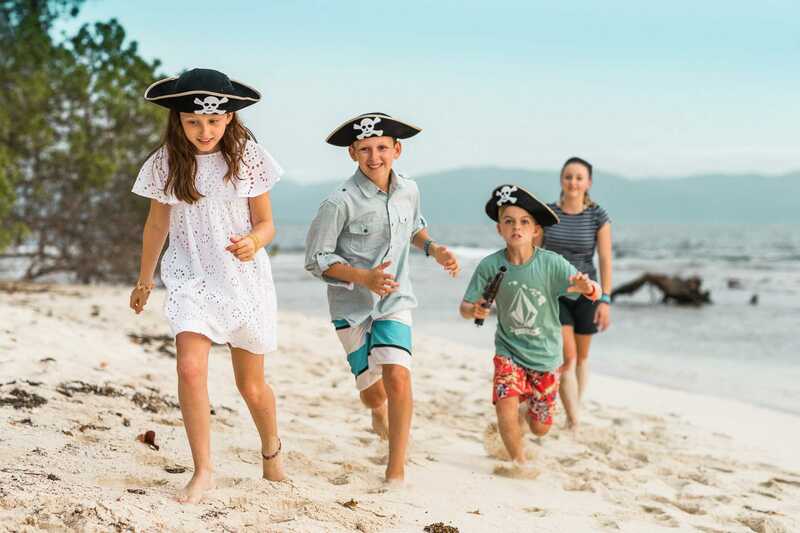 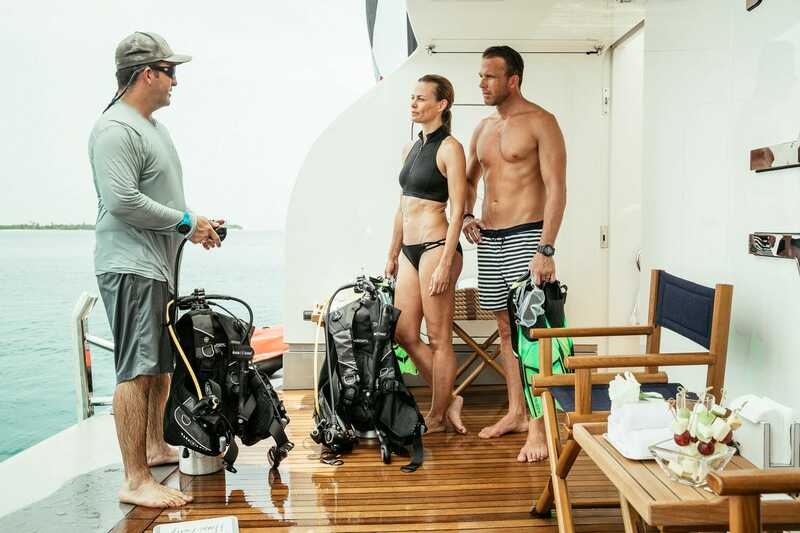 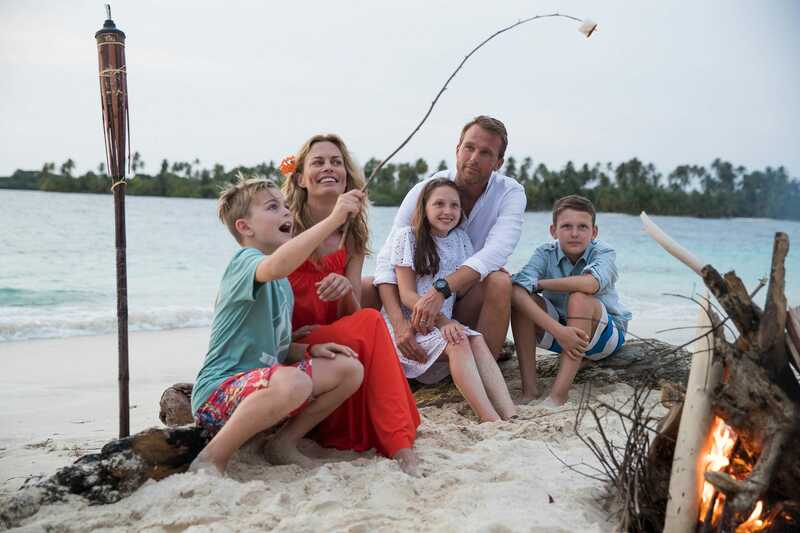 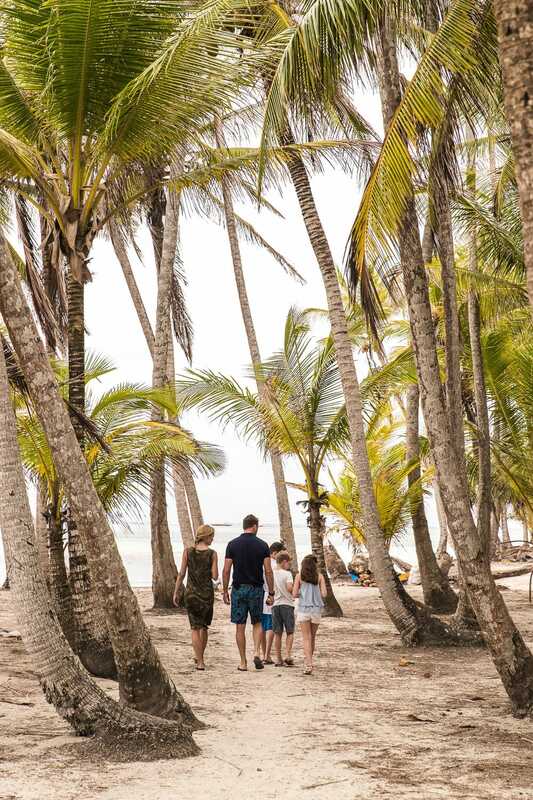 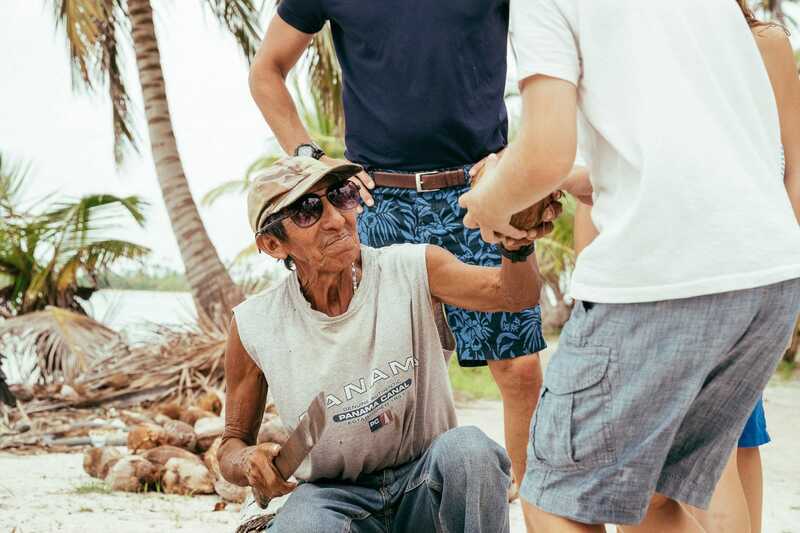 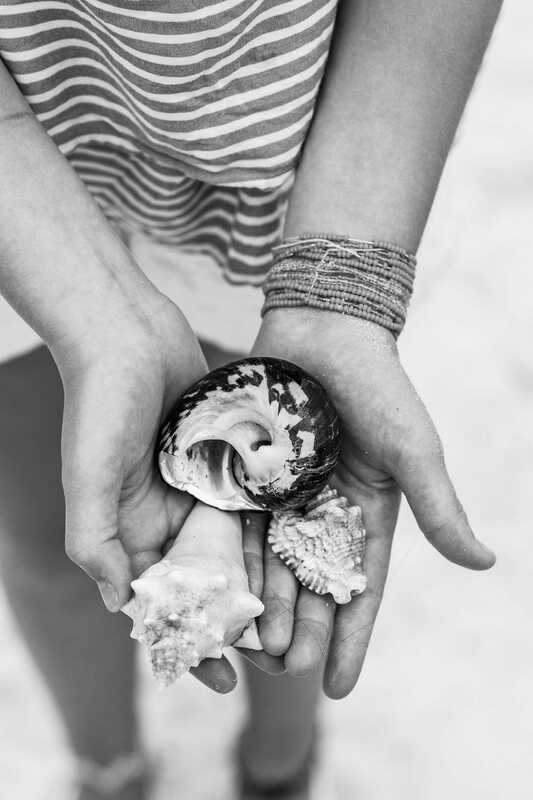 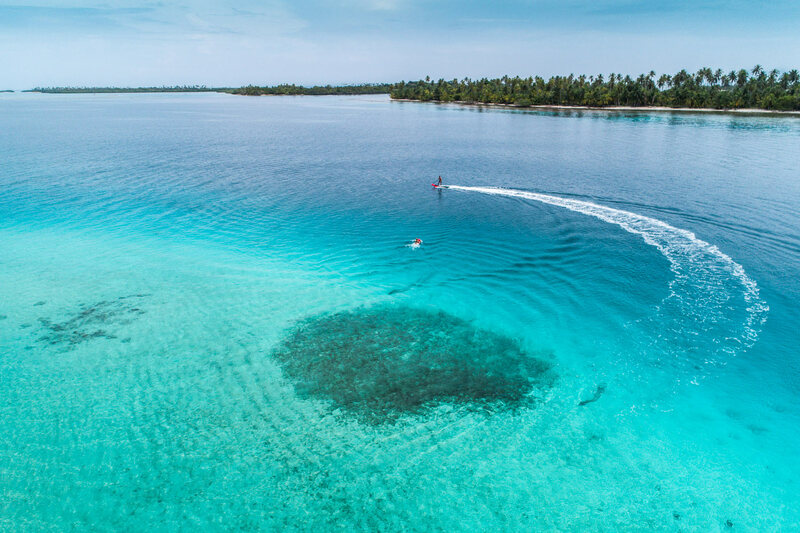 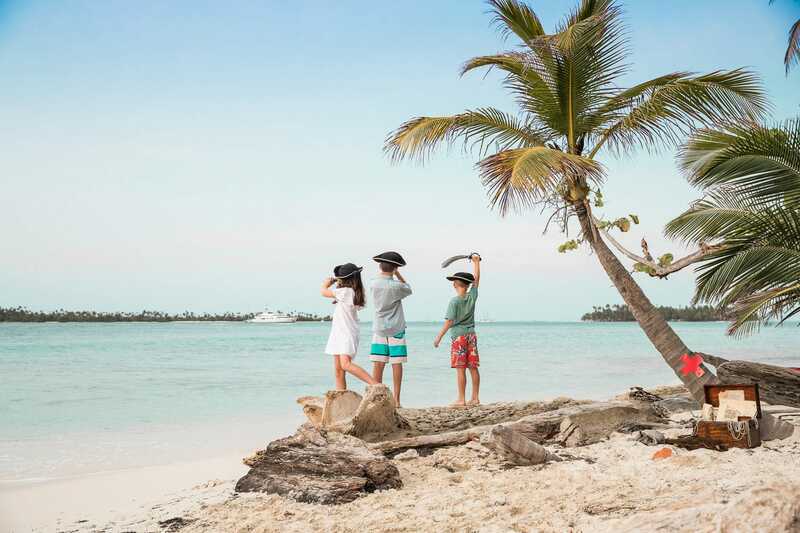 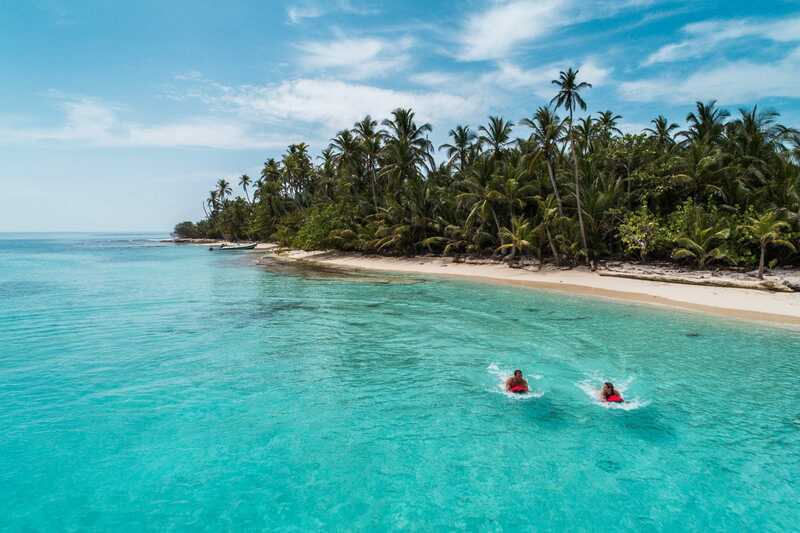 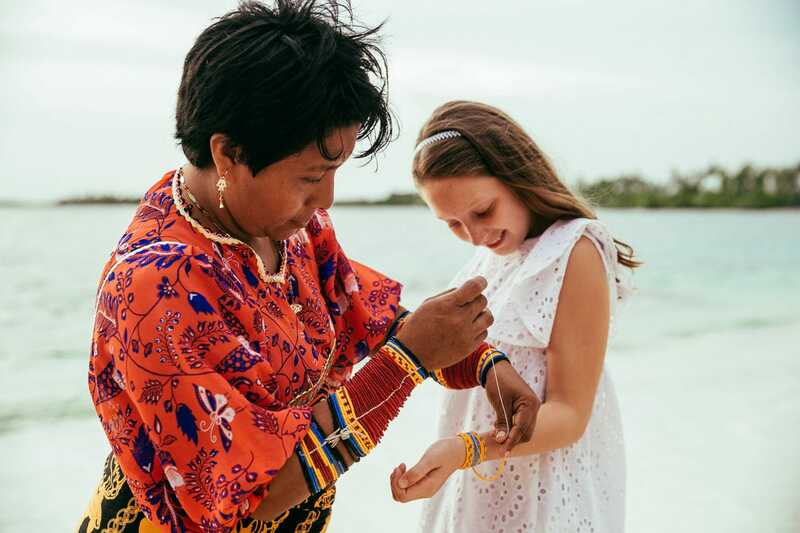 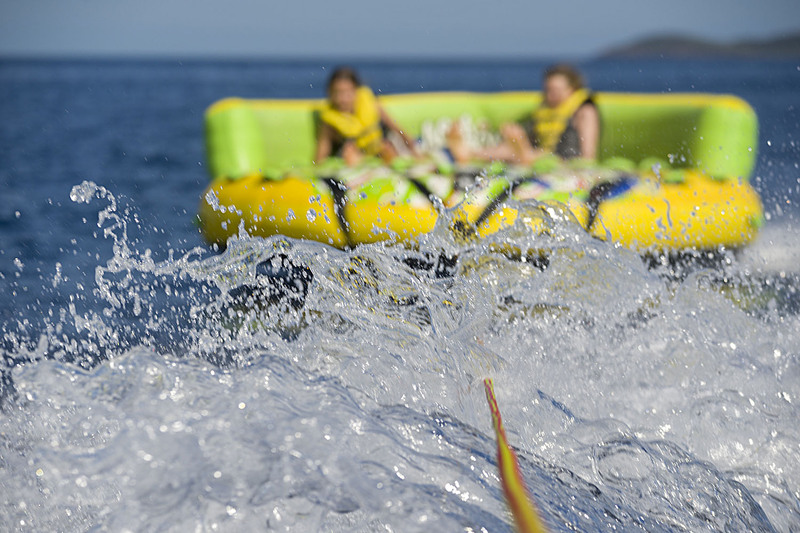 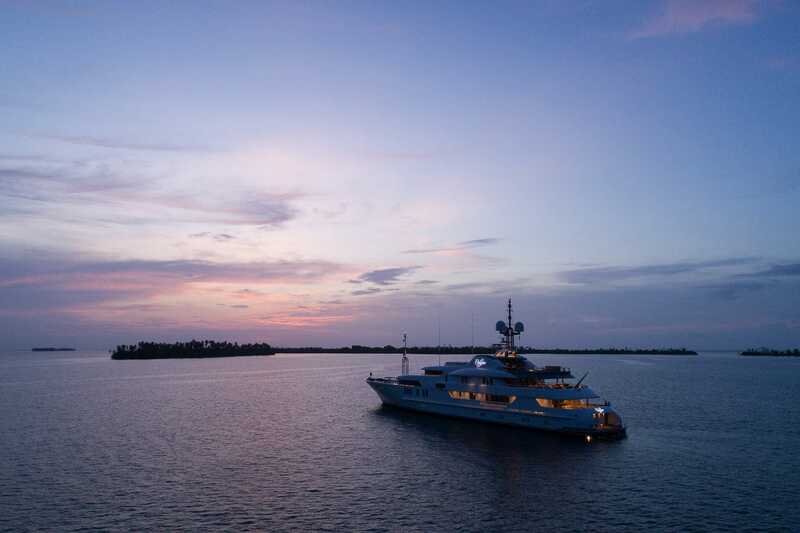 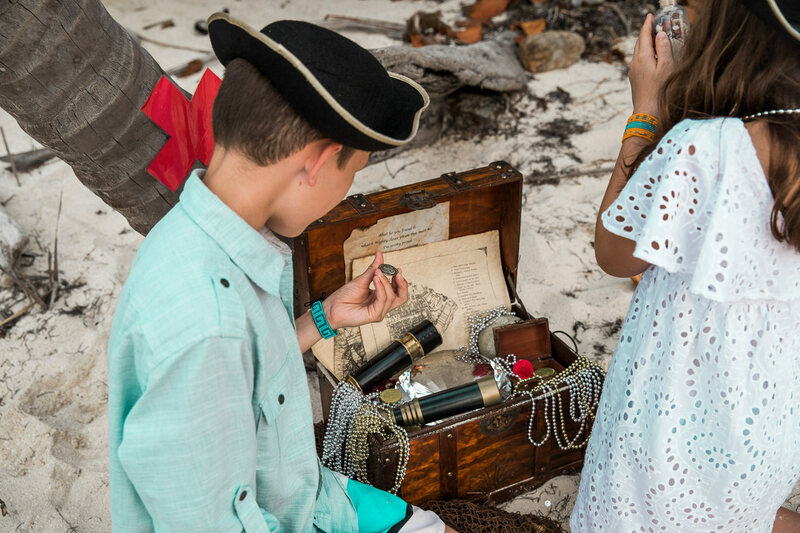 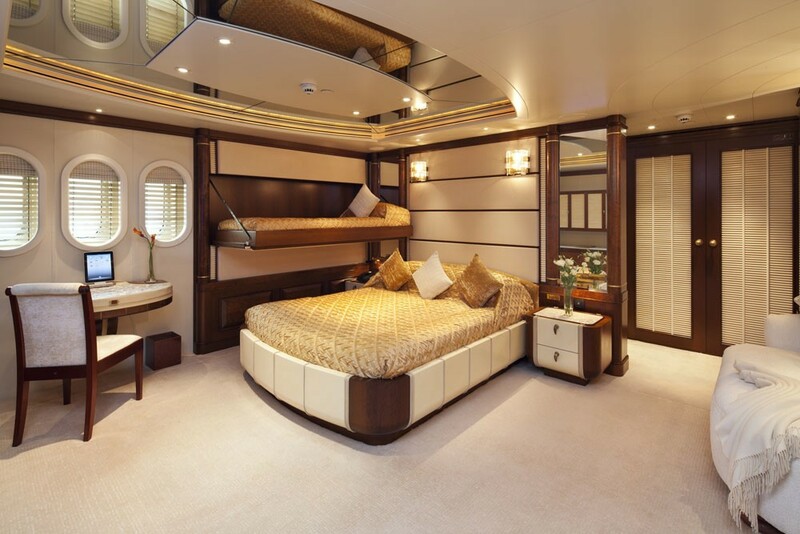 Accommodation is in 7 guest cabins for 12 charter guests. 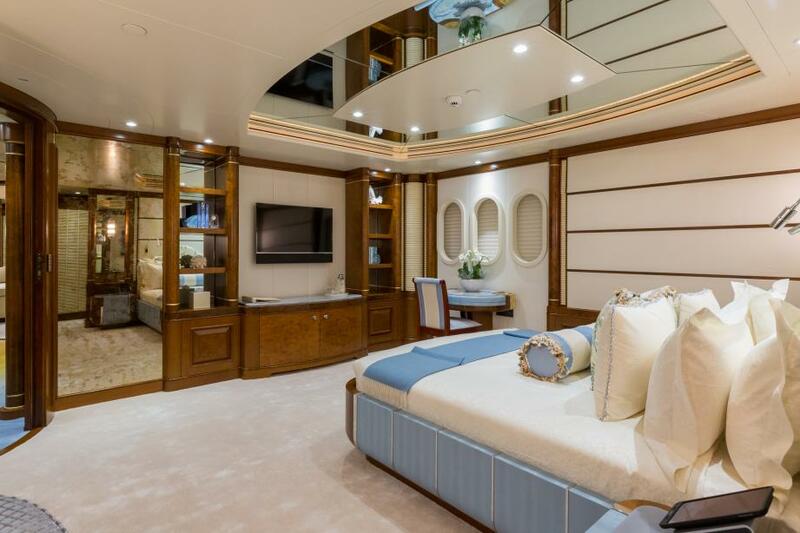 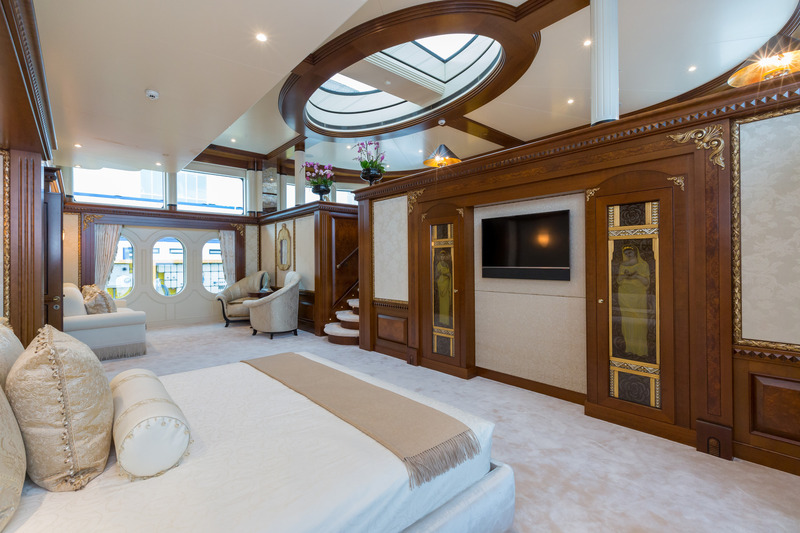 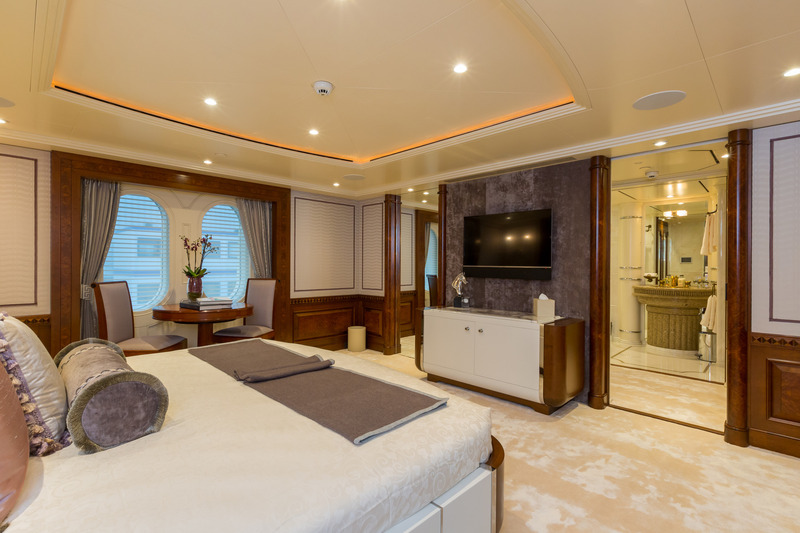 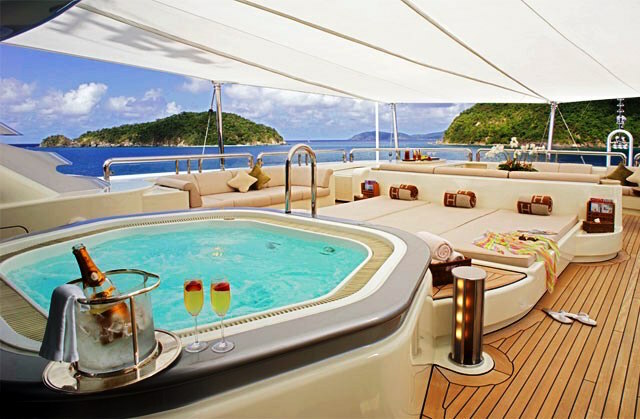 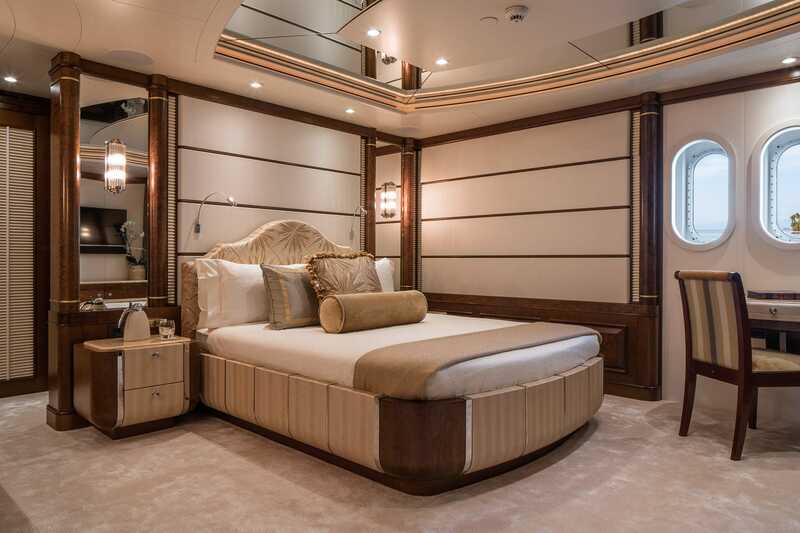 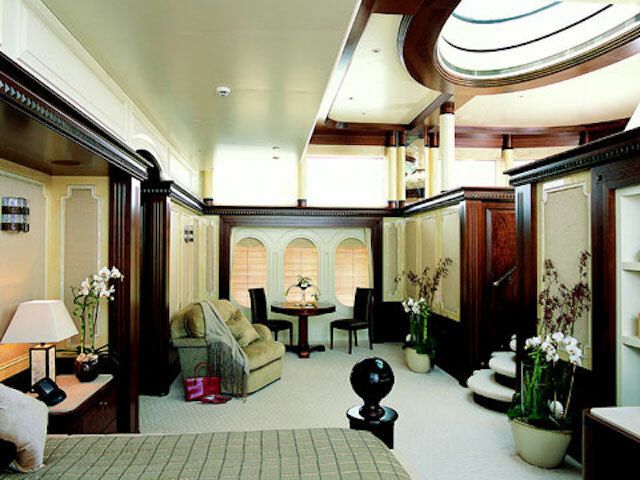 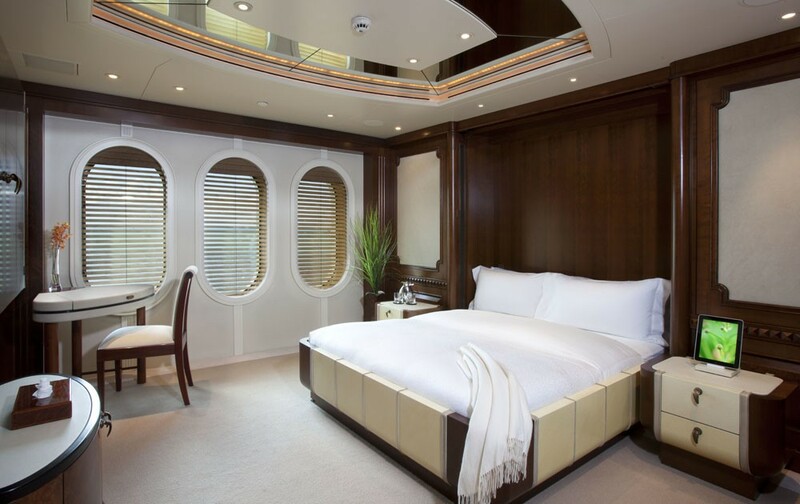 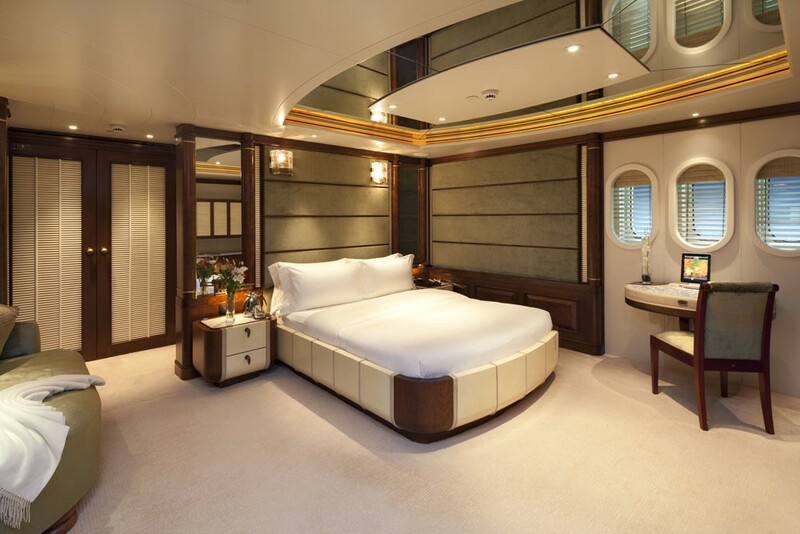 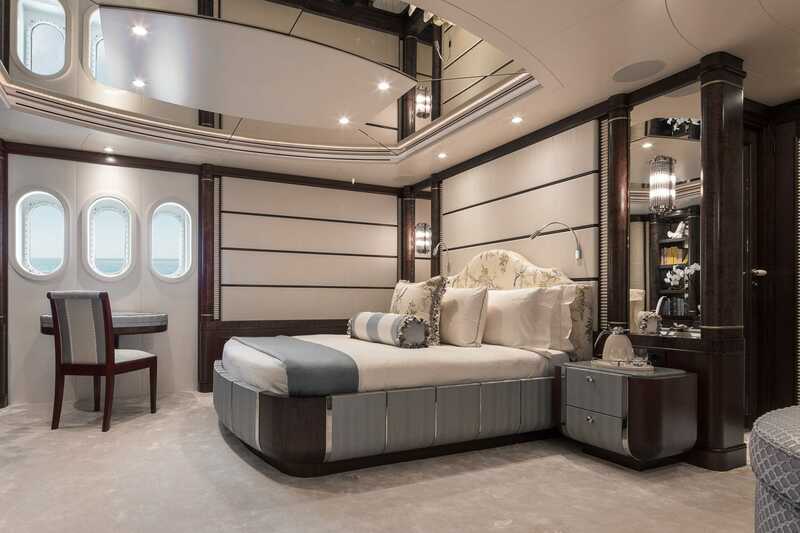 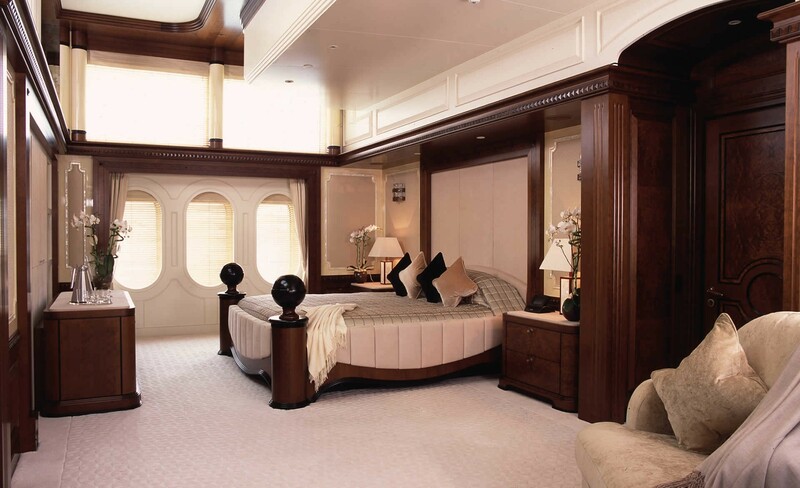 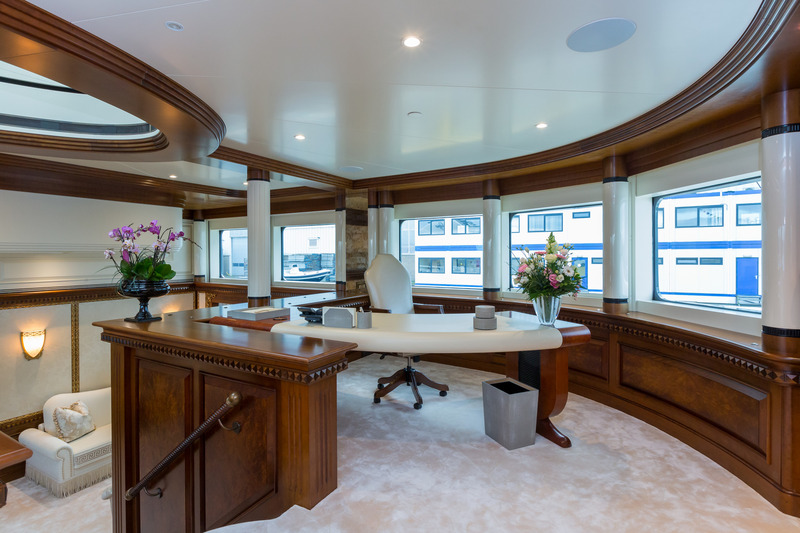 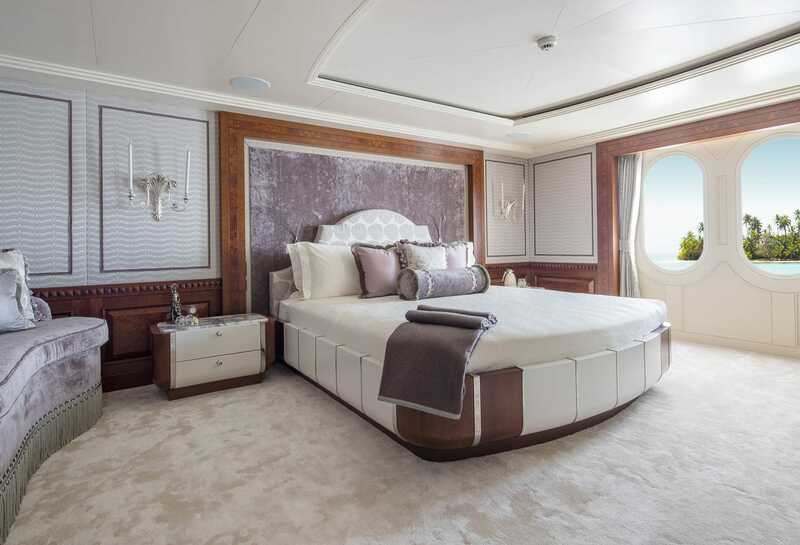 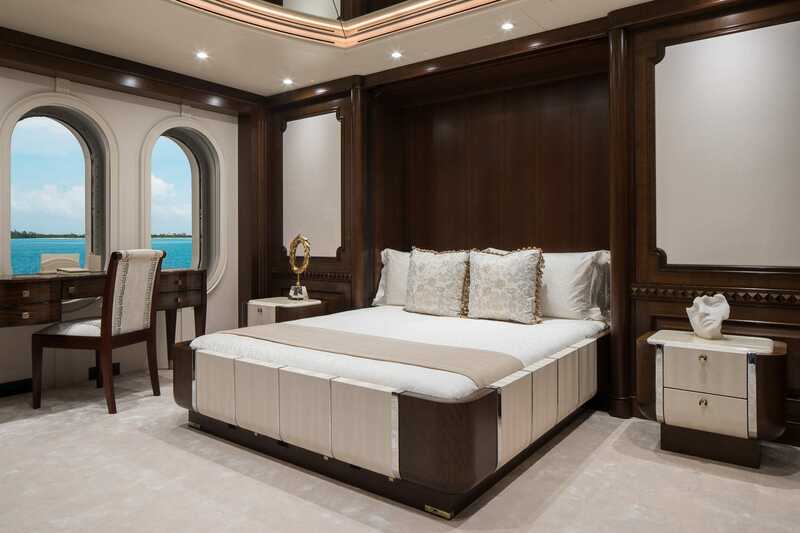 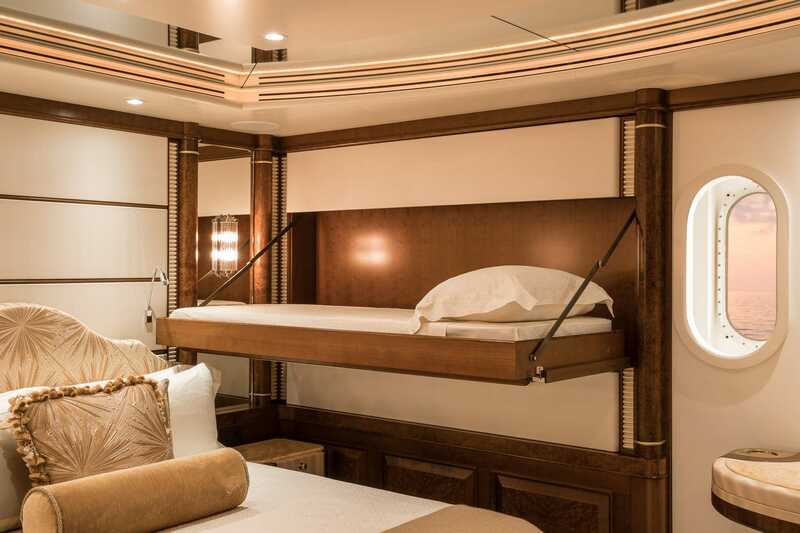 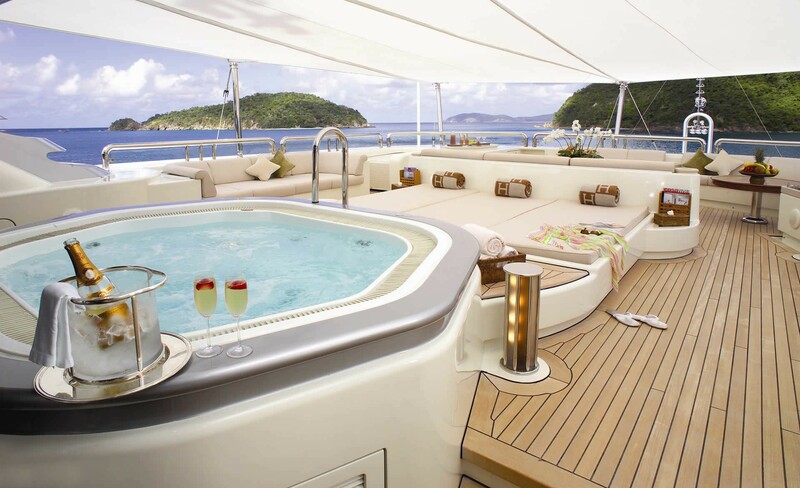 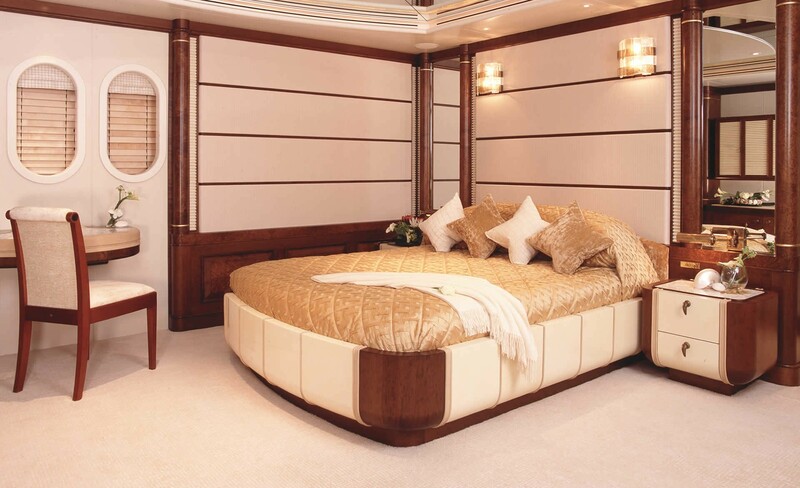 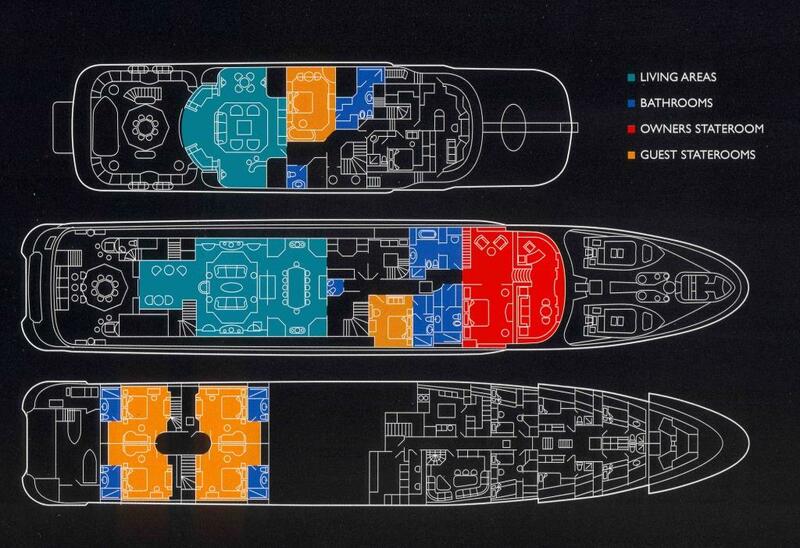 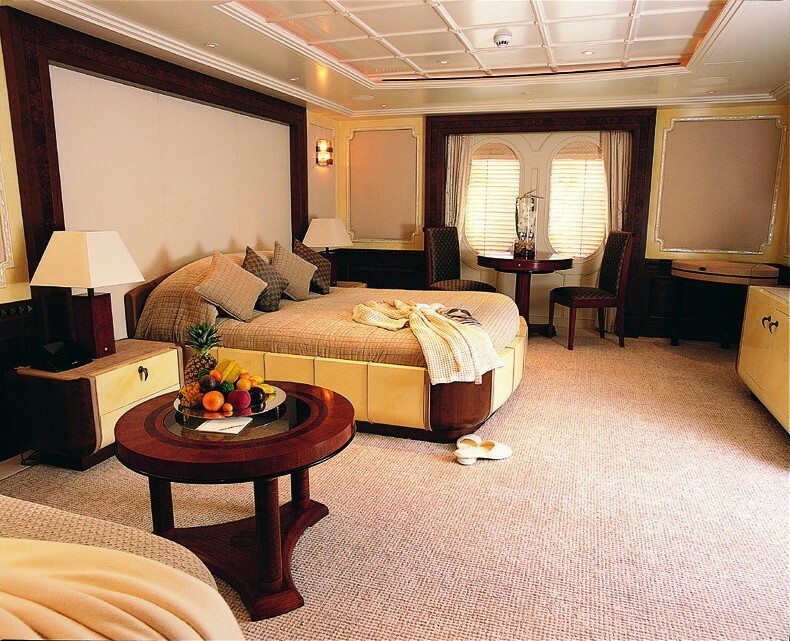 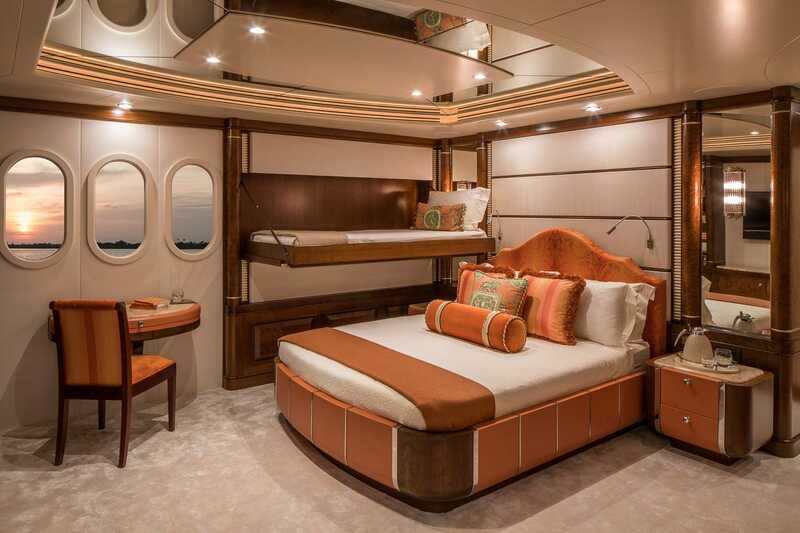 The master stateroom is full beam of the yacht on the main deck forward, with a split level layout. 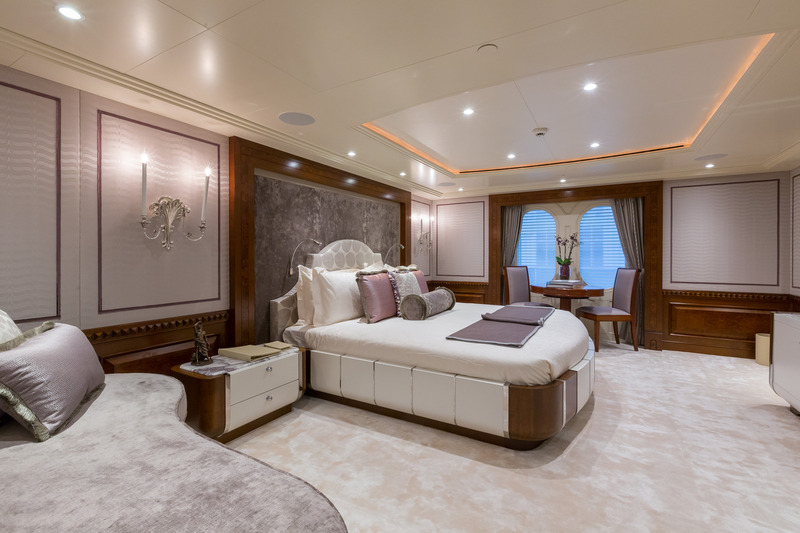 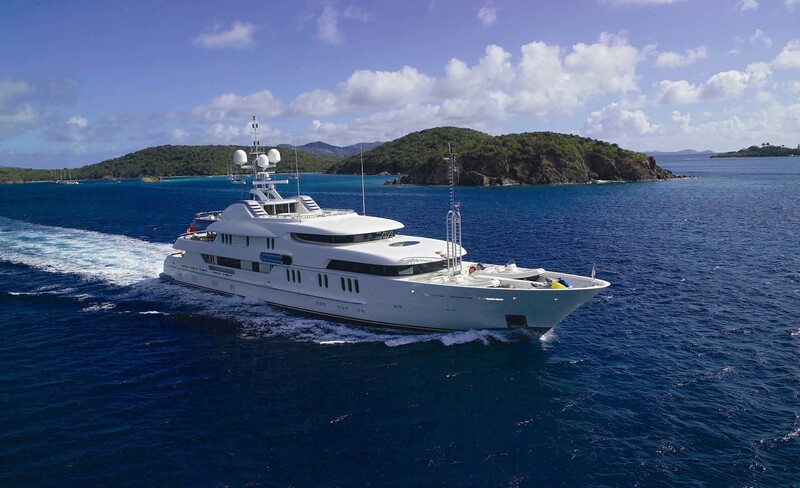 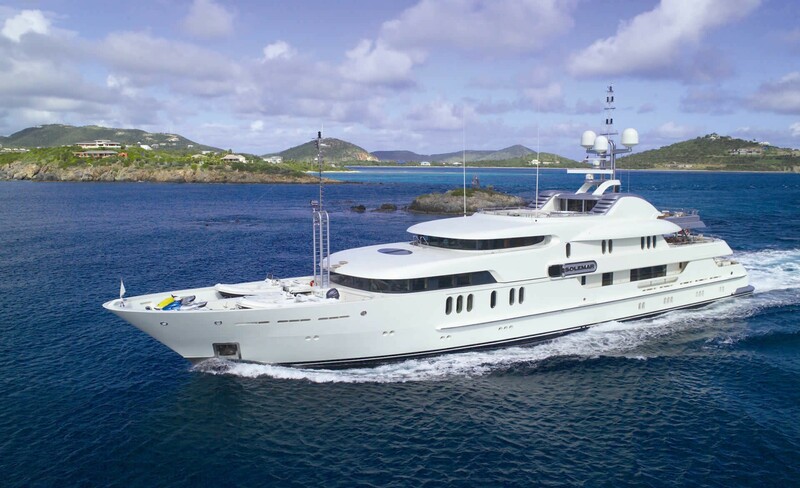 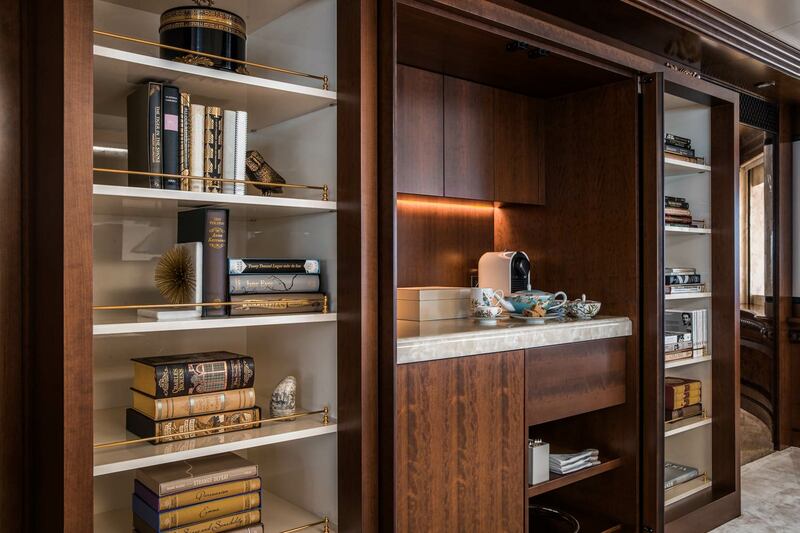 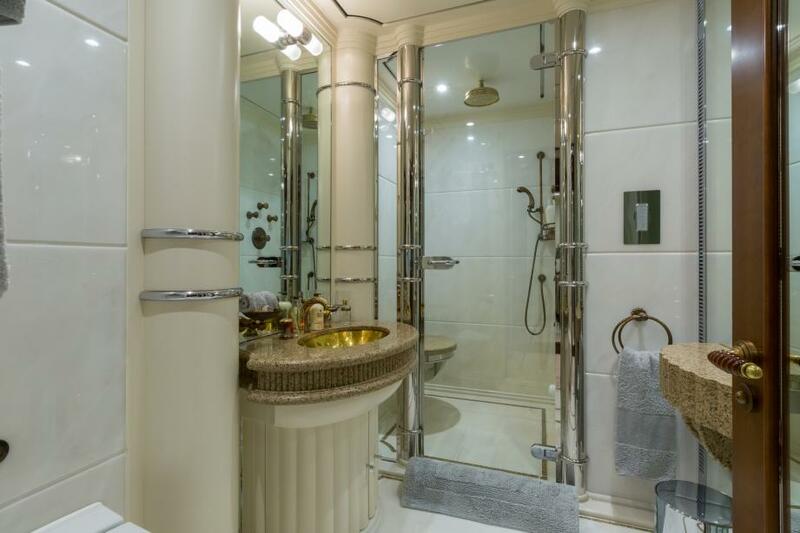 The upper level has a king size bed and private lounge, while the lower level offers a further lounge, study and full beam ensuite with his and hers facilities. 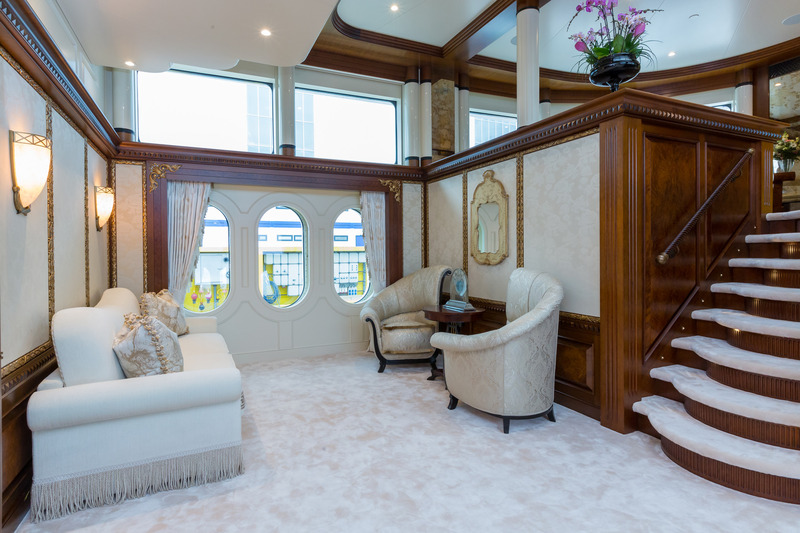 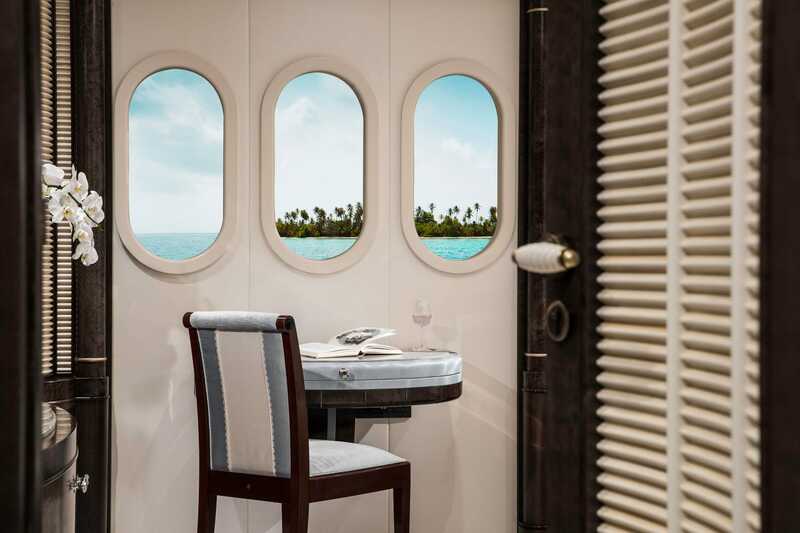 The VIP cabin is on the upper deck forward of the skylounge, with a king size bed. 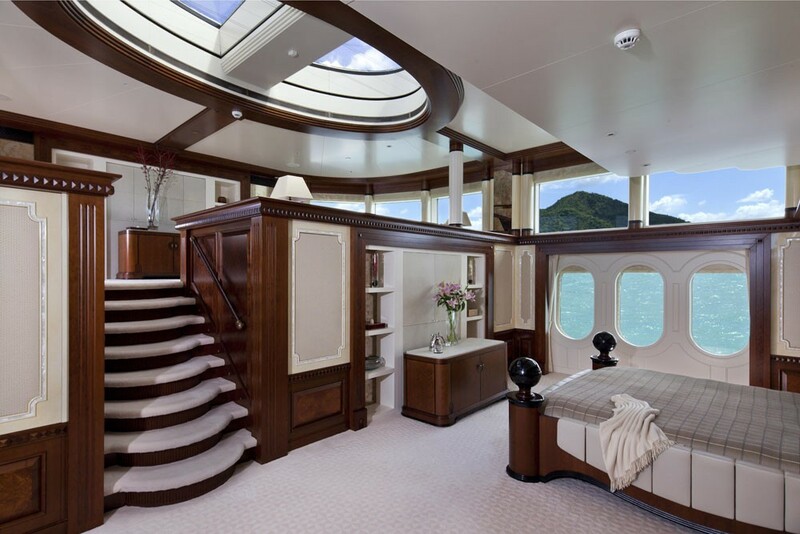 A guest cabin on the main deck to starboard has a queen size bed. 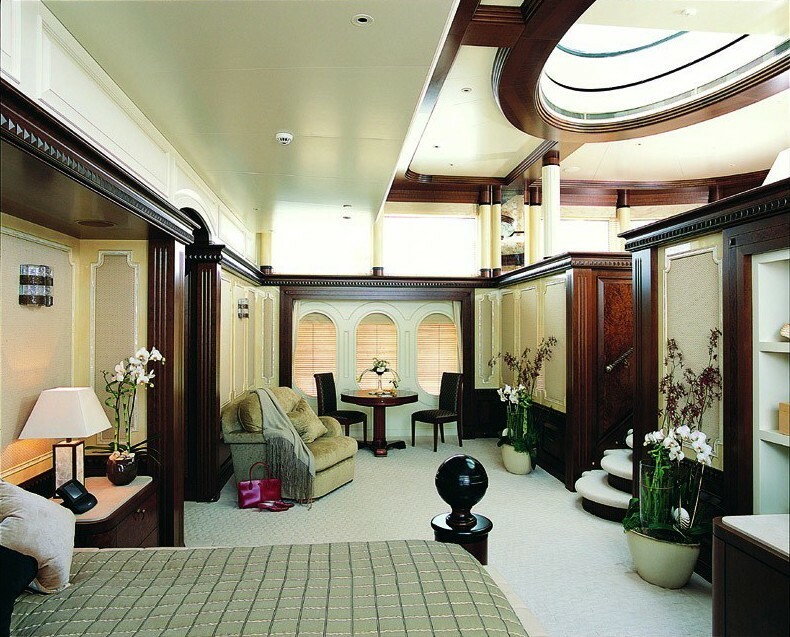 On the lower deck are 4 mirror image guest cabins, each with a queen size bed and Pullman berth. 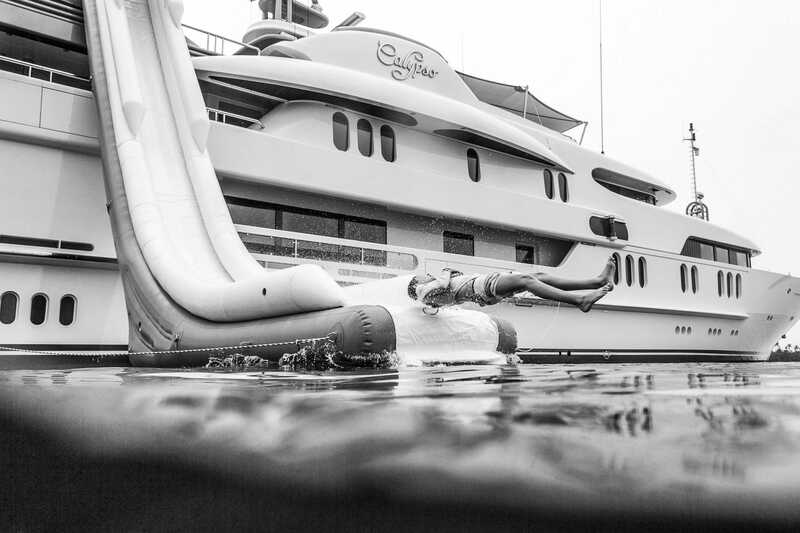 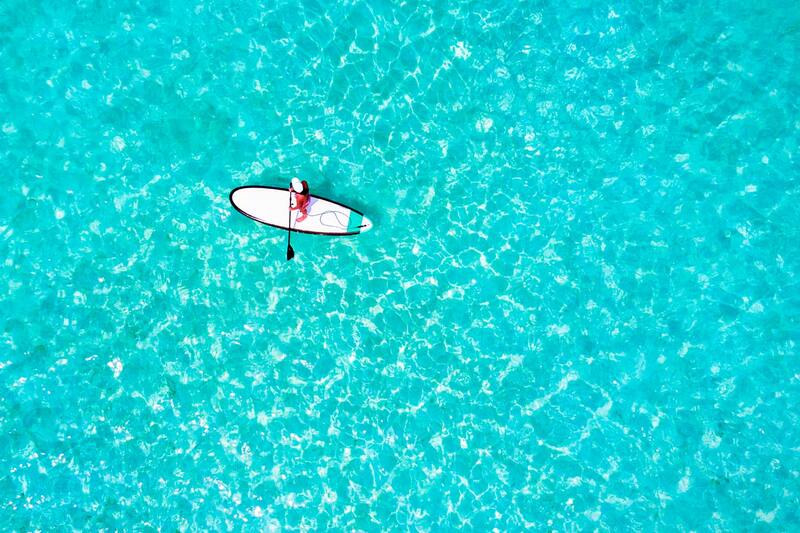 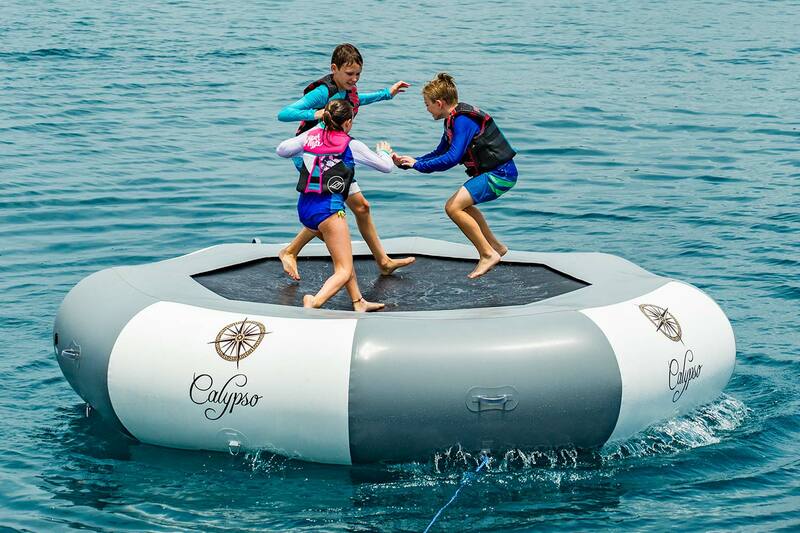 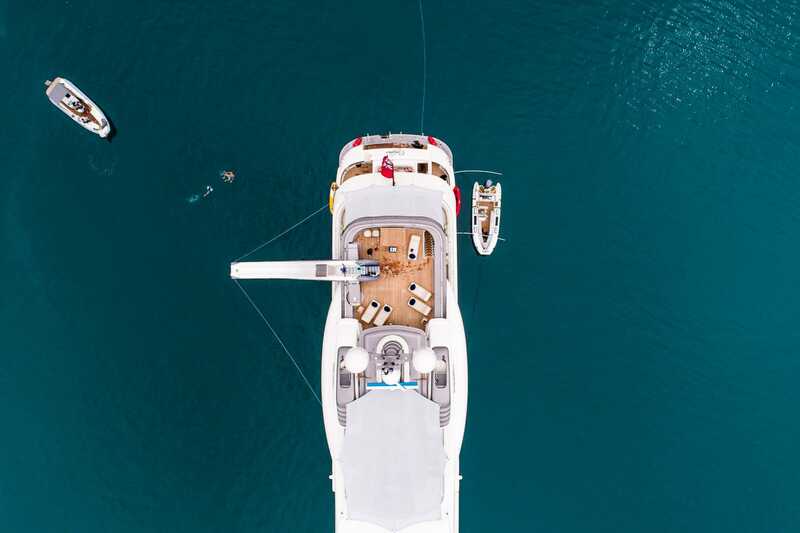 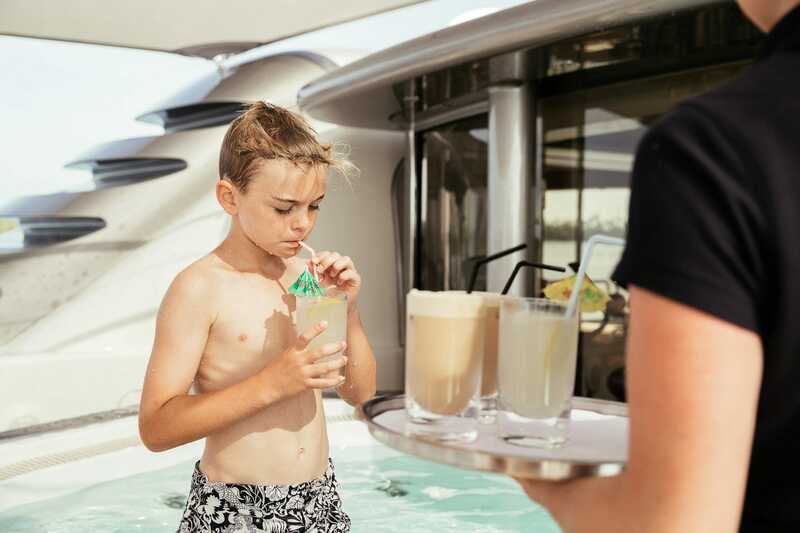 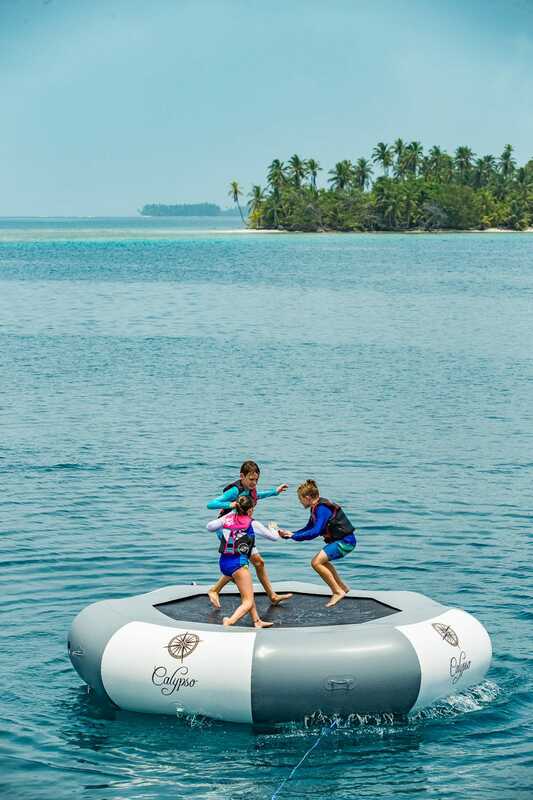 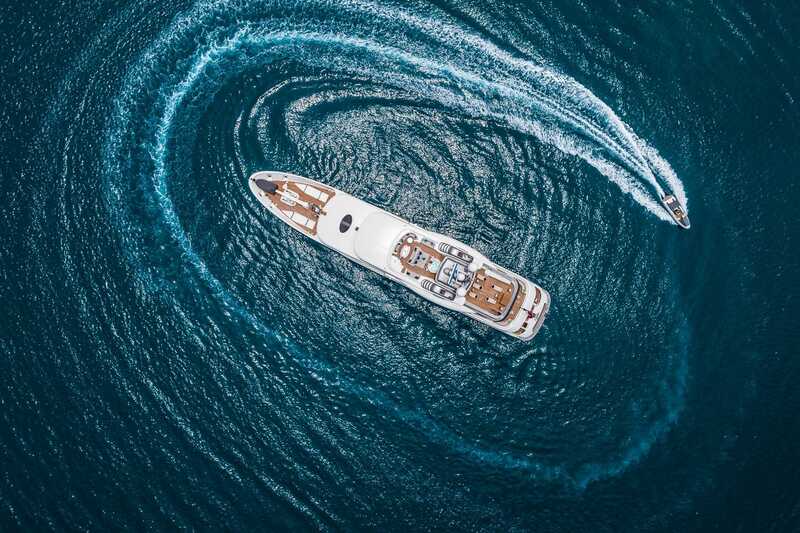 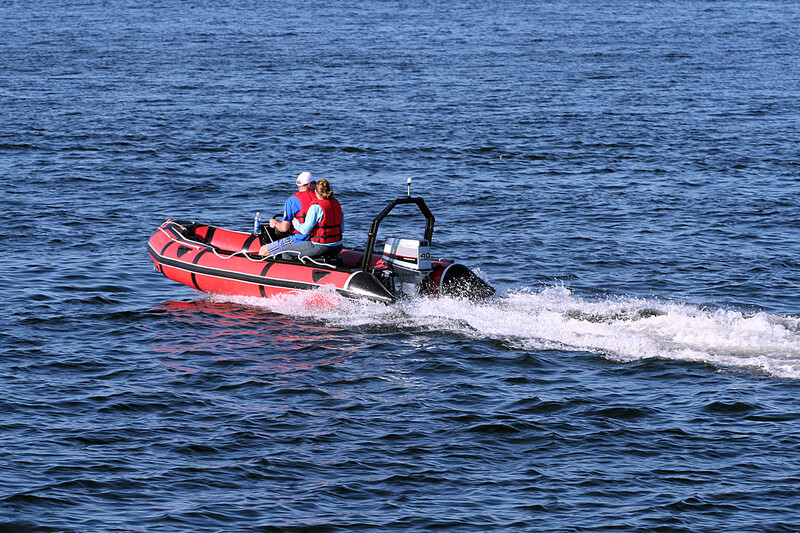 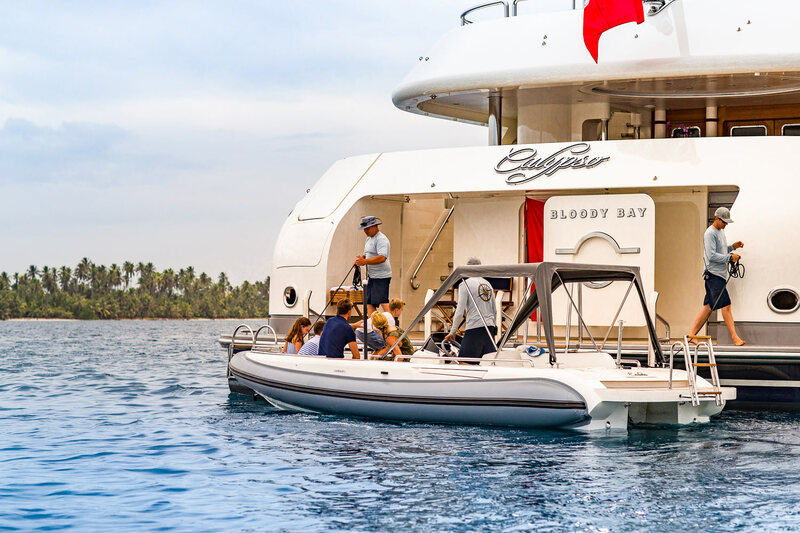 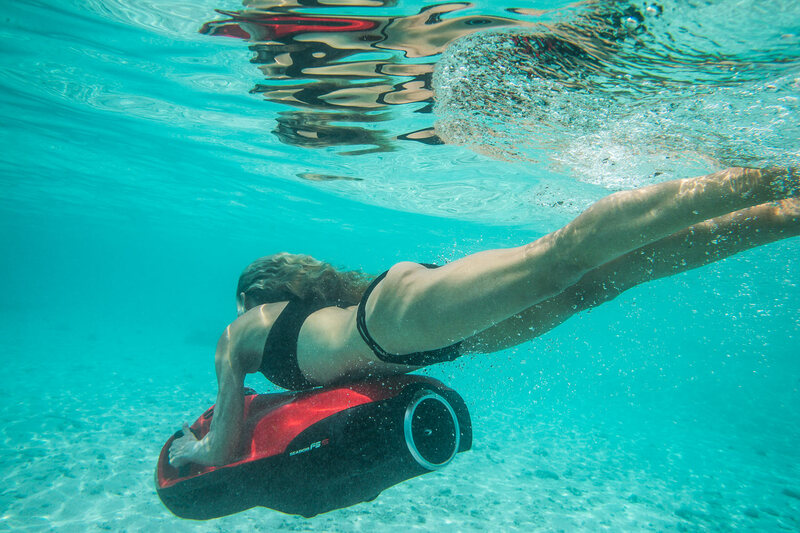 CALYPSO provides the following yacht charter extras, toys and amenities: Tenders & Toys: All toys and tenders New 2017 7.5m (24.6') Dariel Sport Tender 7.5m (24.6') Dariel Limo Tender 8.8m (29') water slide Trampoline 2 Montague X90 Bikes 2 Seabob F5S Lampuga Boost Electric surfboard 2 Laser Pico sailboats 2 Atom Windsurfers with multiple sails Windsurfer rig for Crossover Inflatable SUP 2 Liquid Force 138 kite boards with multiple size kites 2 Hobie Lanai Single Kayaks 2 Sea Eagle 380x Pro Carbon Inflatable 2 person Kayaks 2 Naish Nalu GTW 10'6" SUP 4 Naish Crossover Inflatable 9'10" SUP Towable Toys: 2 Jobe ,1p Hotseats, Jobe Binar 2p, Jobe Airstream Jobe Shock Knee Board Liquid Force Trip 134 Women's Wakeboard Liquid Force Trip 138 Wakeboard Liquid Force Focus 44 Wakeboad Jobe Kids Hemi Trainers 46" Skis Jobe Hemi Combo Skis 62" Jobe Mode combo Skis 68" Obrien Synchro 66" mono Ski Obrian G5 67" Mono ski 4 Aqualung Scuba Diving Full Kits 12 sets of Snorkeling kit Shiamano Tigre Fishing Rod and Reel 4 Casting rods and Reels Rendezvous Scuba Diving Only Audio Visual Equipment and Deck Facilities: Comprehensive 2017 AV system with HD screens and Apple TV and IPad control. 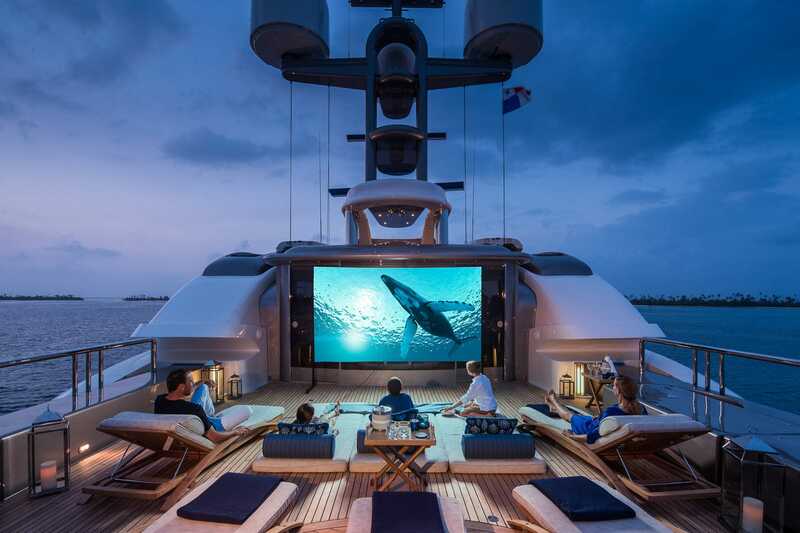 iPhone compatible HD Movie projector & 3 meter custom screen for outdoor movies under the stars. 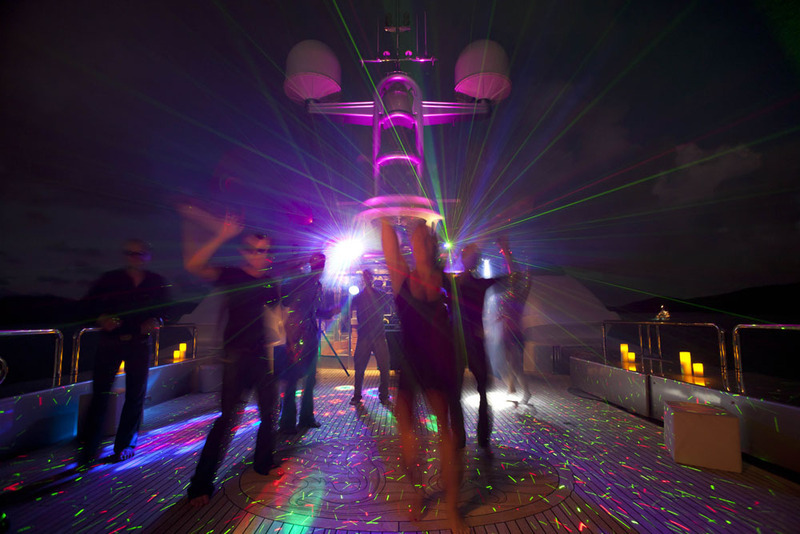 Full light show, lasers, smoke and pro disco sound system onboard Stern - beach with shower for tender boarding and water sports. 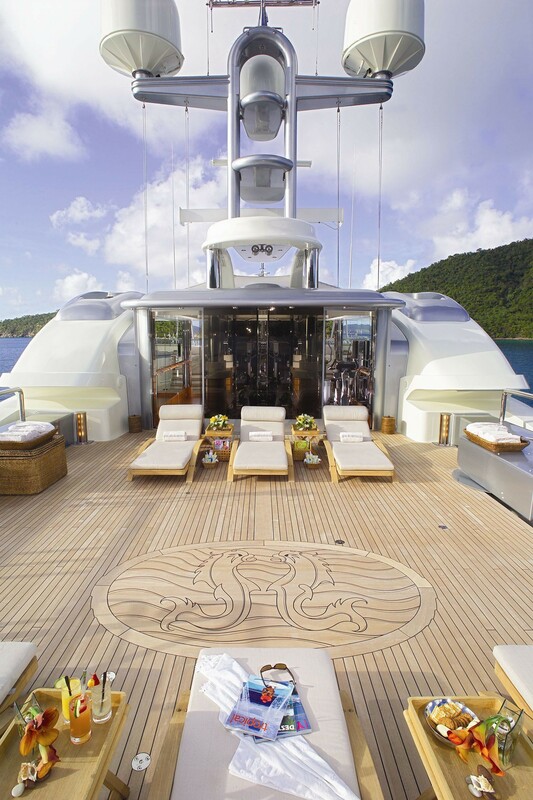 Main deck aft - shaded and sunny lounging areas. 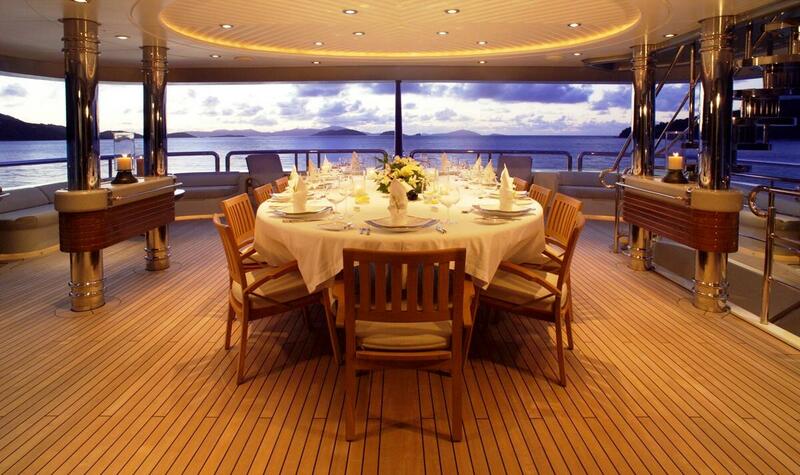 Upper deck aft - shaded dining area. 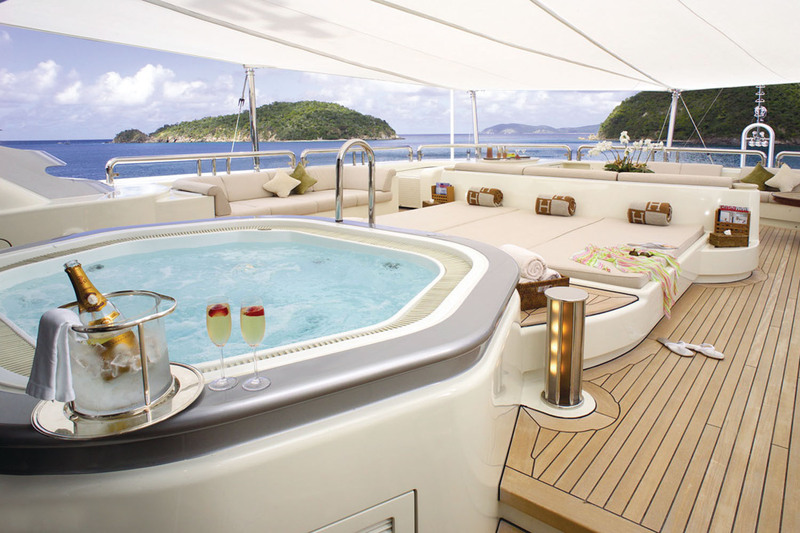 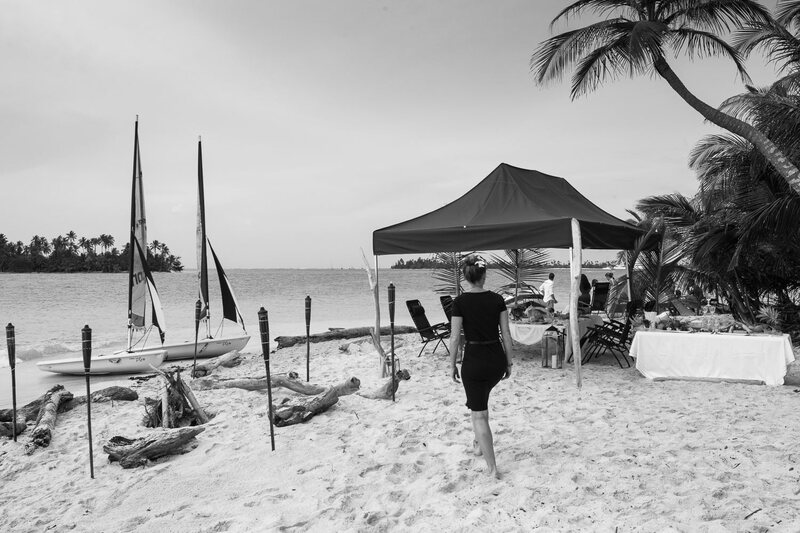 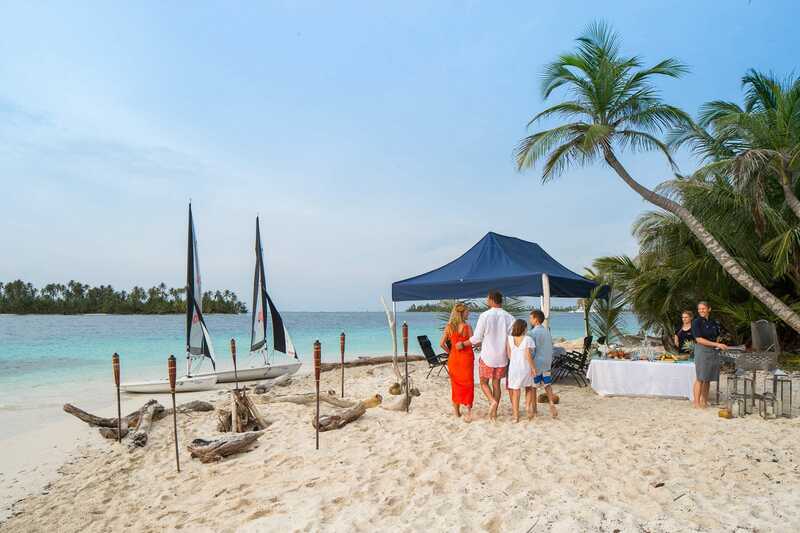 Sunny or shaded lounging area with heaters Sun deck - aft sunning area with chaise lounges. 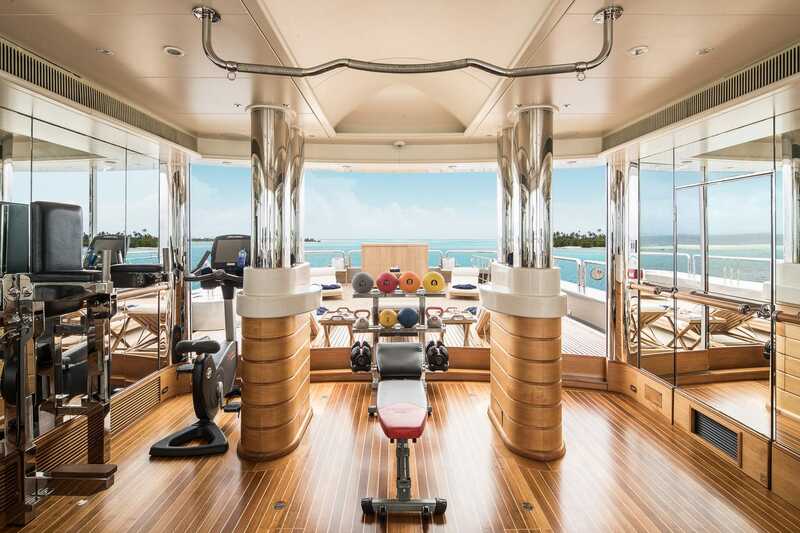 In the middle is a air conditioned gym that can be open or closed. 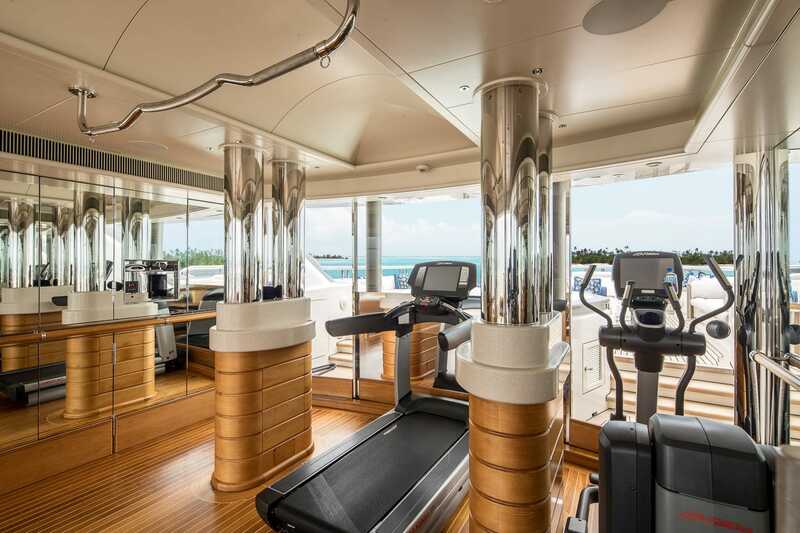 Elliptical, treadmill & bike trainer machines . 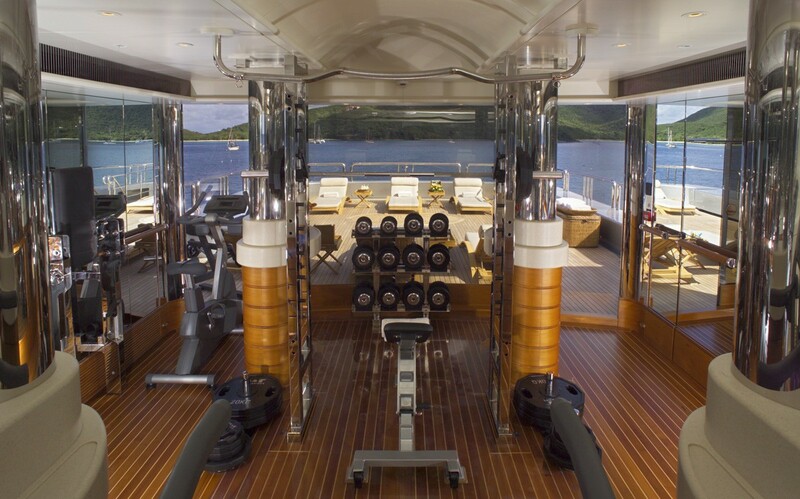 Free weights, balls, mats. 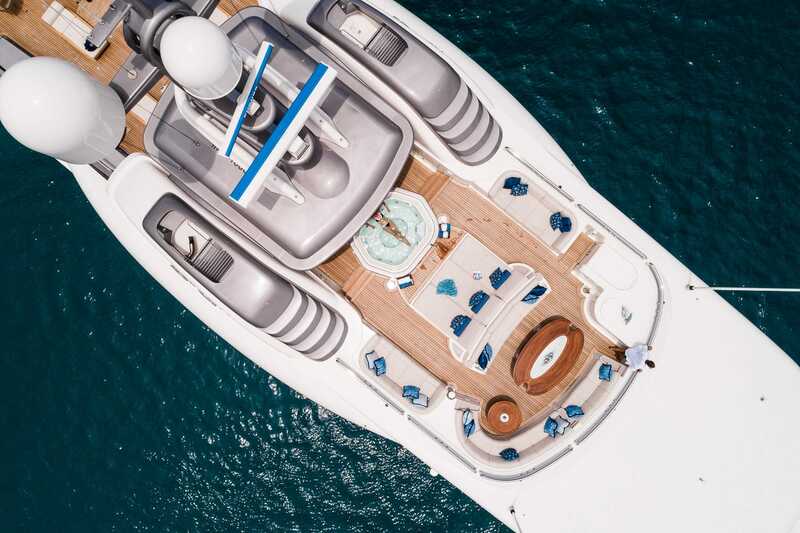 balance boards etc In the front their is a huge area with Jacuzzi, sun beds, dining and lounging areas with tables, couches and awnings if needed. 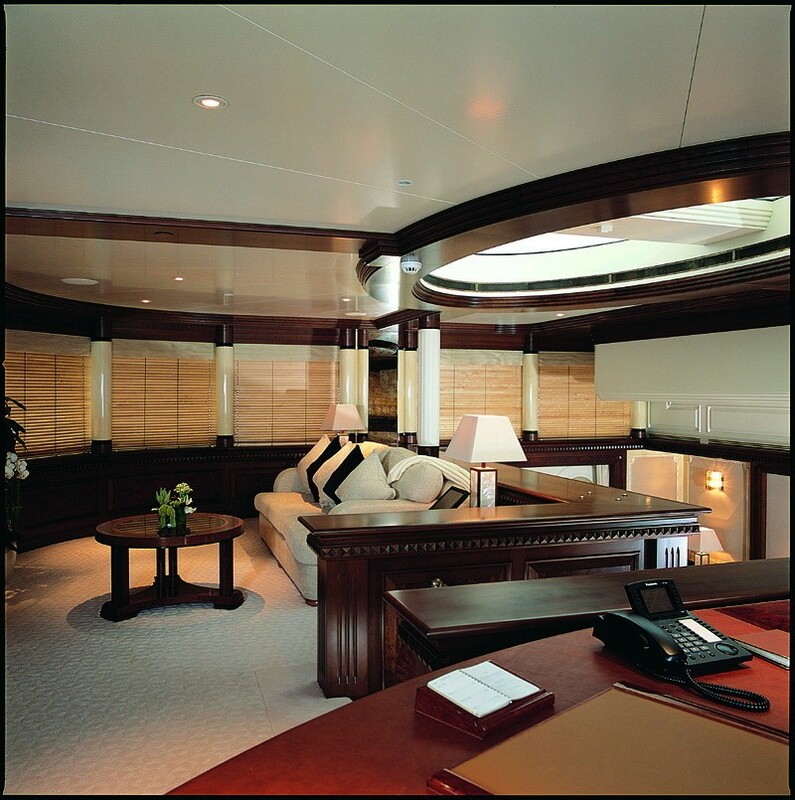 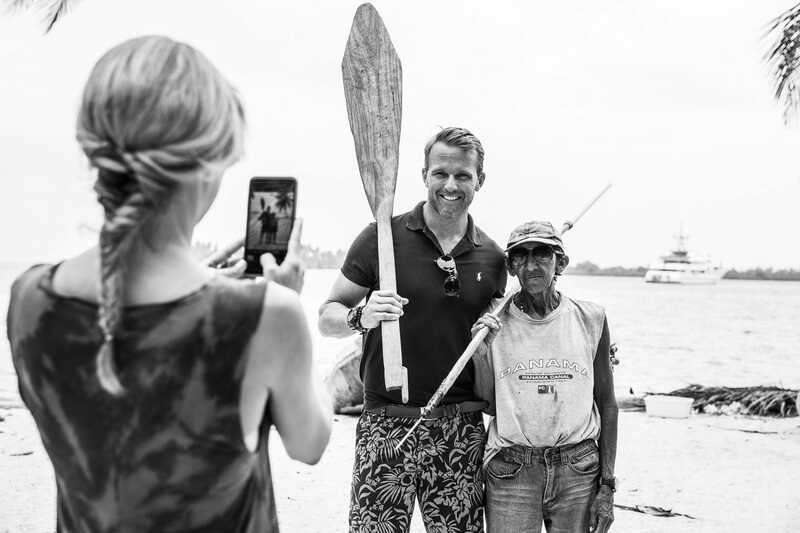 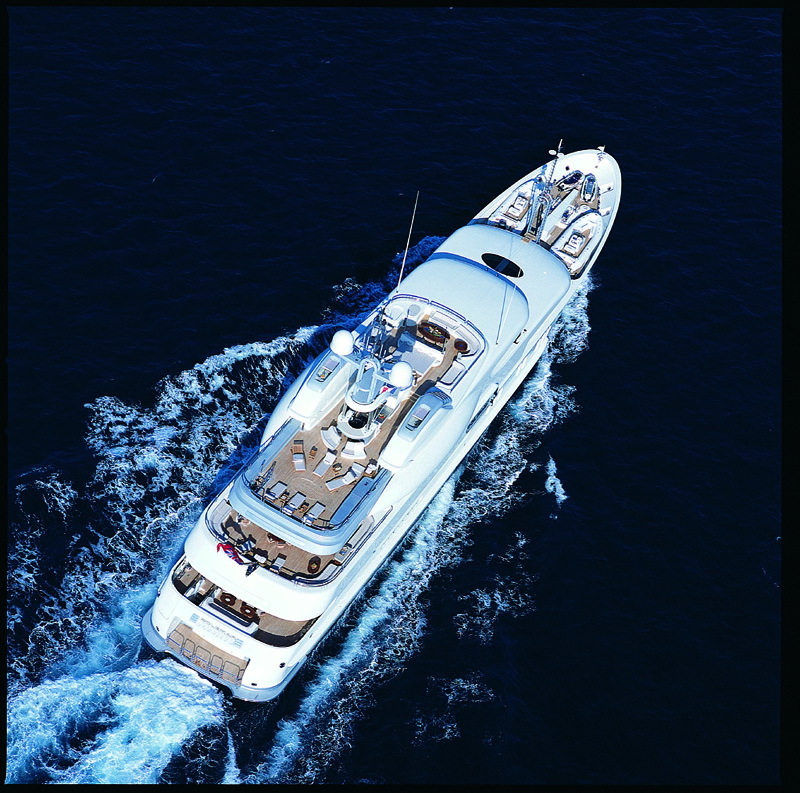 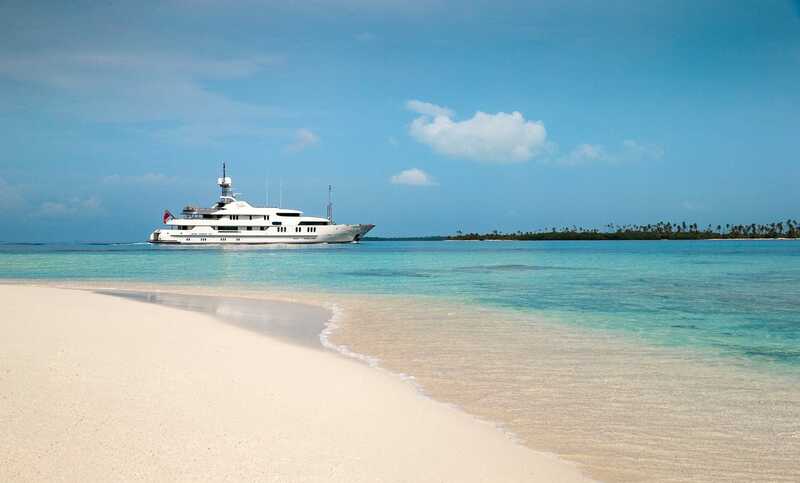 Communications: WiFi network throughout the yacht with broadband Internet access world wide. 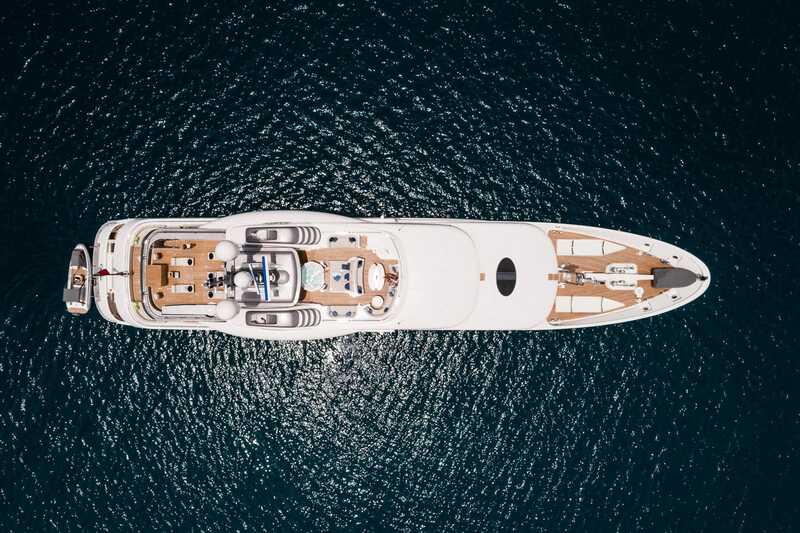 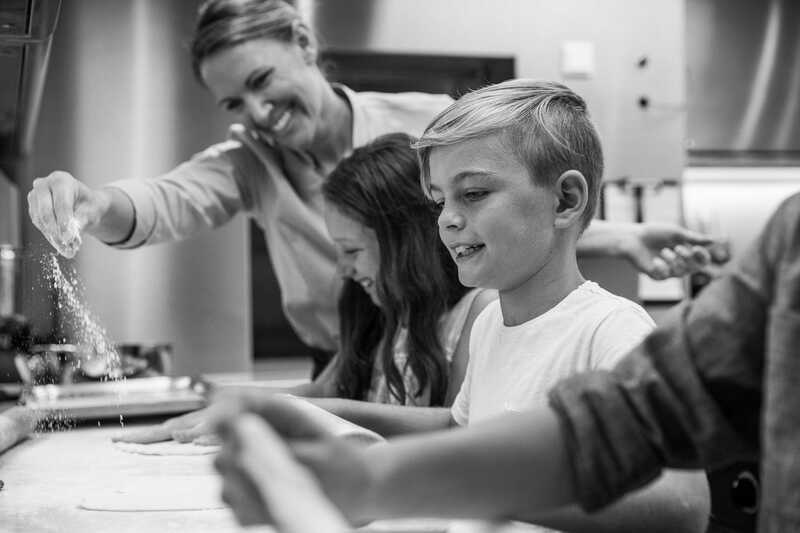 2017 Communication system with phone and data connections via VSAT, Sat Com and GSM.